Fires can become life-threatening in only a matter of two minutes, that is why it is necessary to practice fire safety tips. All of these safety tips are tips, but are not guarantee to prevent any matter. If a fire is still to occur, like it did in this St. Cloud home, call SERVPRO of St. Cloud to clean and repair the damage. We are available 24/7, and can be reached at (320) 248-5400! Experiencing damage in your home from frozen pipes? We are almost over the cold season, but that does not mean that all pipes are in the clear. 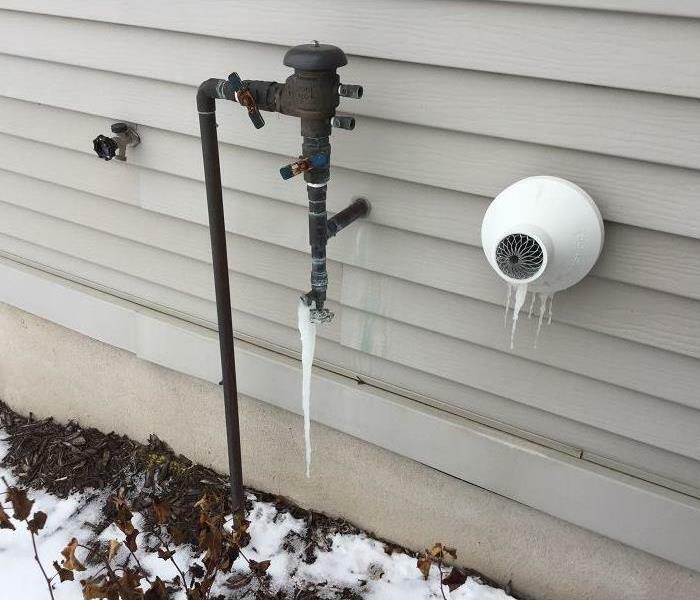 Be sure to be keeping an eye on your pipes to make sure that they are not freezing up! Not noticing a frozen pipe can cause water damage within your home. 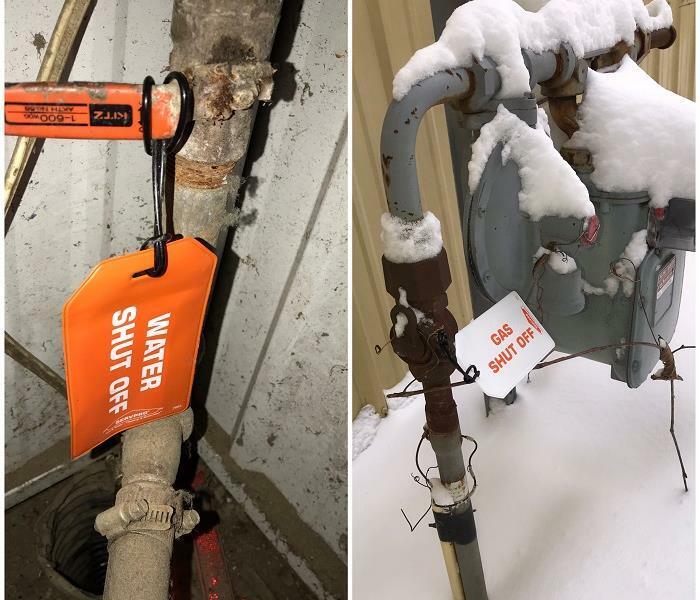 If you do miss a frozen pipe, call SERVPRO of St. Cloud at (320) 248-5400 to help! We are available 24/7! 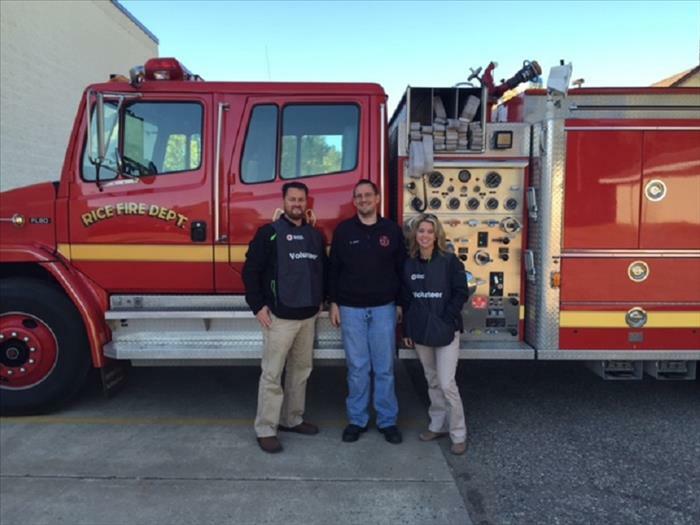 Experiencing a fire can lead to tragic losses, let SERVPRO of St. Cloud help you through that difficult time! We will come in to demolish the parts of the building that the fire affected. After this, we will help go through all of the items in the building to see what contents can be saved from the loss and cleaned. This home experienced a complete fire loss. They called SERVPRO of St. Cloud who arrived in a timely manner and helped them through the tragic loss. If you are to ever experience any sort of loss, call SERVPRO of St. Cloud at (320) 248-5400. We are available 24/7 and ready to help! SERVPRO of St. Cloud will make sure there is no moisture in your walls! A moisture meter is used by SERVPRO of St. Cloud to detect moisture content in materials. This tool is relied on to find potential problems and damage to structures from moisture buildup. SERVPRO of St. Cloud was using the moisture meter on a St. Cloud home to check the walls for any potential problems or damaged caused by water. If you ever experience a water loss or damage, call SERVPRO of St. Cloud at (320) 248-5400 to assist you! We are available 24/7 and would love to help! 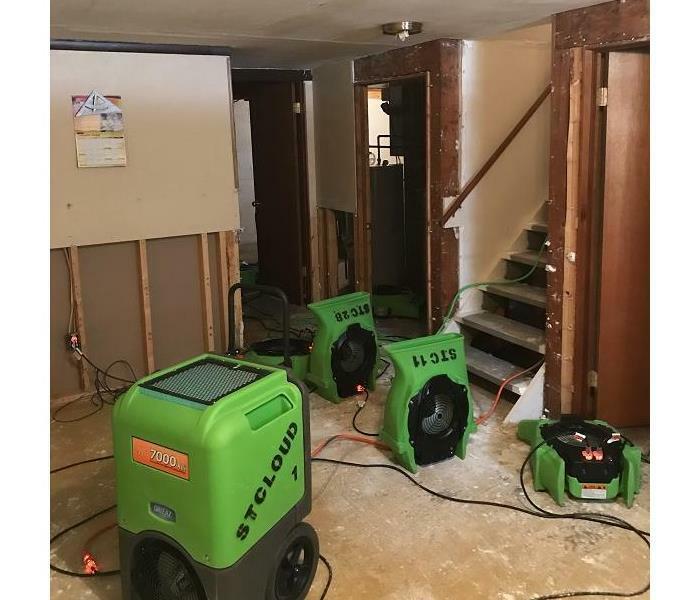 On February 2, 2019 SERVPRO of St. Cloud attended Celebrate Becker. Celebrate Becker is an event to bring the community together. There was vendors, foods, inflatables, and entertainment for the whole family! SERVPRO of St. Cloud likes to stay involved in the community. If you are interested in doing any events together, give us a call at (320) 248-5400! Experiencing pipe bursts in this frigid cold weather? This St. Cloud home experienced two pipes bursting in their home overnight. The water damage was not discovered until 6 hours later by the homeowner. SERVPRO of St. Cloud arrived in a timely manner and started to dry out the damaged area. Following that they started to remove the water damaged areas. If you experience any pipe bursts call SERVPRO of St. Cloud at (320) 248-5400. We are available 24/7! Want to be prepared in case of an emergency? Mold is a fungi that can be discovered inside or outside. It is best known for growing where there is a lot of moisture present. This Sartell, MN home was being cleaned by SERVPRO of St. Cloud due to excess mold being discovered. SERVPRO of St. Cloud cleaned the mold while using the correct equipment to stay safe. Have a problem with fire, water, or mold? Call SERVPRO of St. Cloud to help you! We are available 24/7. Reach us at (320) 248-5400! When it comes to a loss/disaster no one wants to have to move out of their home or shut down their business. SERVPRO of St. Cloud avoids this by using hydroxyl generators. 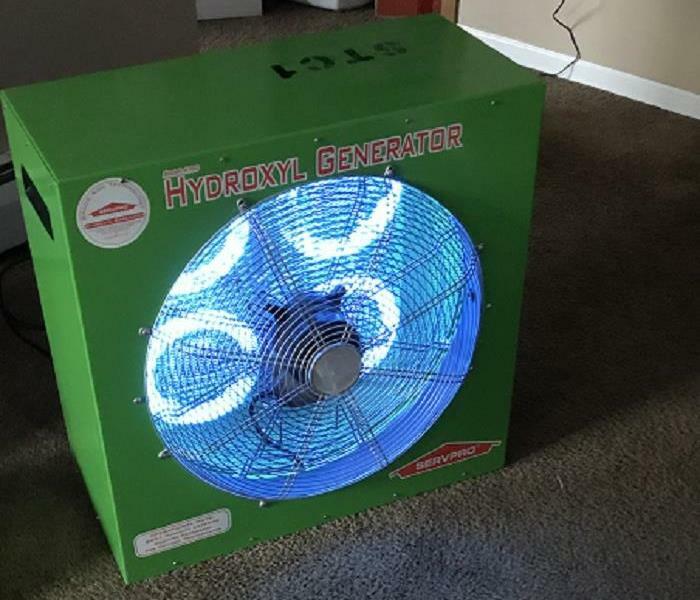 The hydroxyl generator is used for deodorization purposes, and is a machine that is safe to use in occupied areas. If you ever experience a loss/disaster, call SERVPRO of St. Cloud at (320) 248-5400! We are available 24/7! Frozen and Busted Pipes? Call SERVPRO of St. Cloud! It is that time of year when pipes freeze up and bust! If you were to experience this, call SERVPRO St. Cloud at (320) 248-5400. Our staff will be there in a timely manner. We are available 24/7 and would love to help! Fire Damage? SERVPRO of St. Cloud is here to help! An outside source caused one end of this home to catch on fire. SERVPRO of St. Cloud was there to help clean up the area and personal belongings. 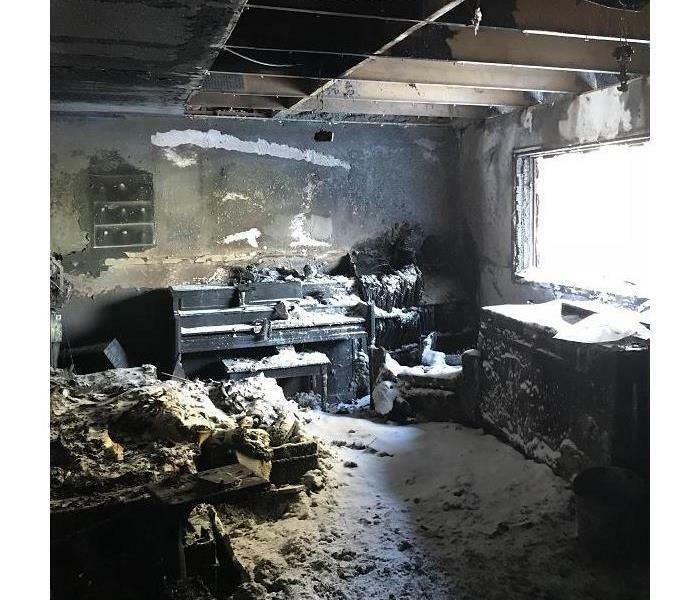 The mess and tragedy that comes along with experiencing a fire can be lessened with the help of SERVPRO of St. Cloud. They will get there in a timely manner to clean and repair the damage. If you ever experience a fire that leaves you needing help with the clean-up and re-build, call SERVPRO of St. Cloud at (320) 248-5400. We are available 24/7, and would love to help! 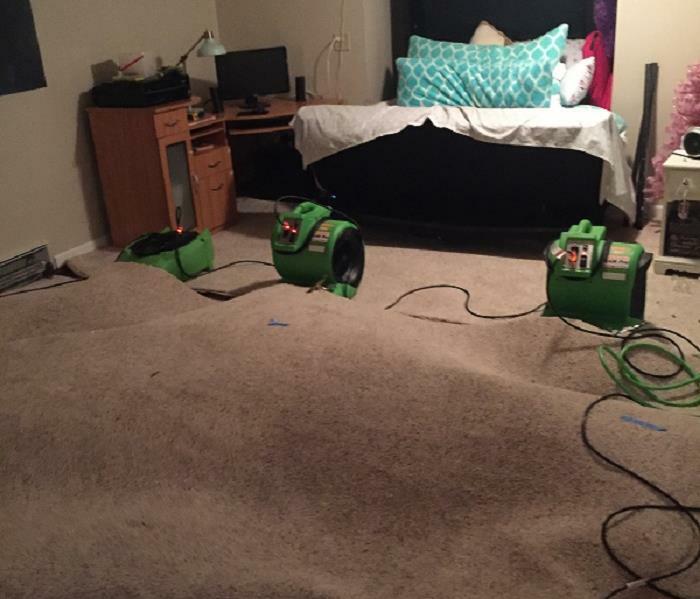 Experiencing water damage is not ideal, especially when odors can come from the mold that is being created. SERVPRO of St. Cloud staff will respond in a timely manner to repair the damages and eliminate the odors. SERVPRO of St. Cloud will contain the odor in a confined space while they work to eliminate the odor. 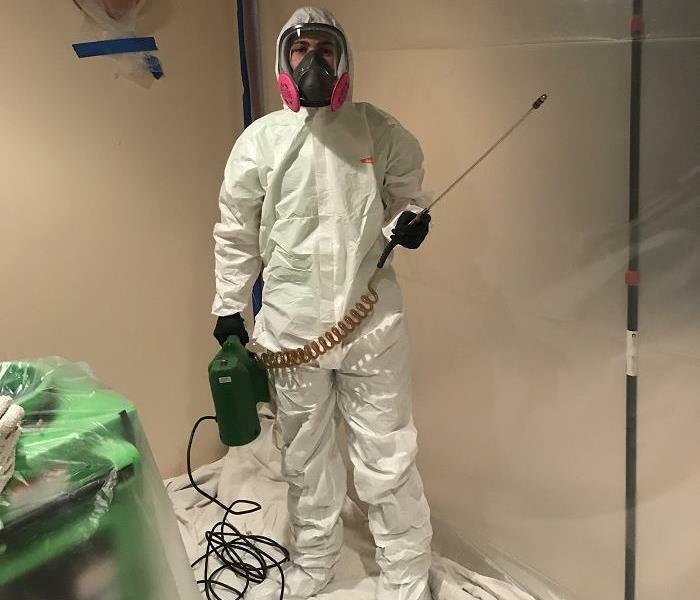 Wearing this Hazmat suit will protect the SERVPRO staff while getting the job done! Contact SERVPRO of St. Cloud at (320) 248-5400 if you ever suffer from water loss or mold. We are available 24/7 and here to help you! 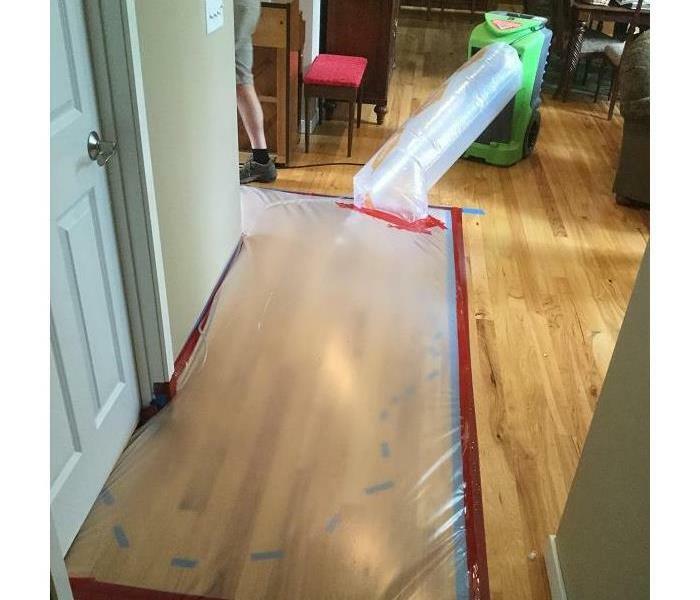 Water damage can be a disaster if leaked upon your hardwood flooring. SERVPRO of St. Cloud always tries to restore the materials in your home instead of replacing them as it is less intrusive, expensive, and least amount of time that your life is disrupted. This hardwood flooring was wet and SERVPRO of St. Cloud has advanced equipment to dry out the flooring. These in-floor mat drying systems allows the flooring to be dried out and reduce the buckling that can occur. Our advanced drying equipment sets us apart from other restoration companies. 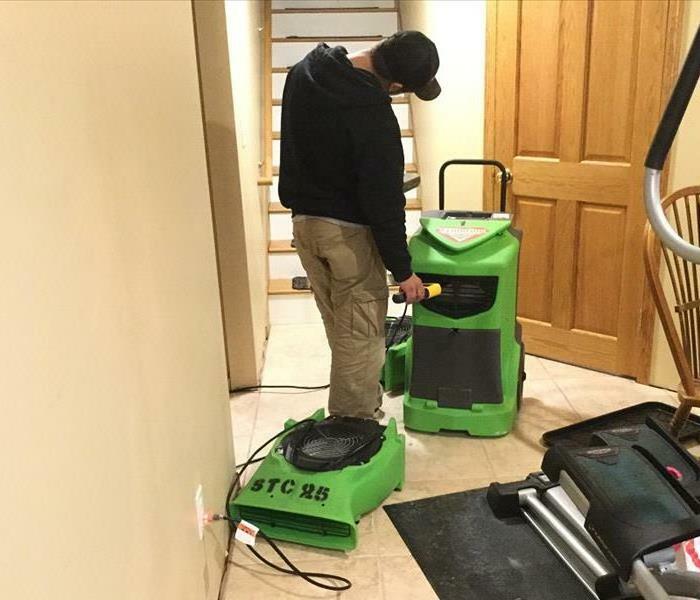 Should you have a water damage to your hardwood flooring at your home or business, call a company that has up-to-date technology to dry it out. Call SERVPRO of St. Cloud at (320) 248-5400. We are always here to help! This commercial building experienced a fire. SERVPRO of St. Cloud used thermal fogging to eliminate the odors completely. 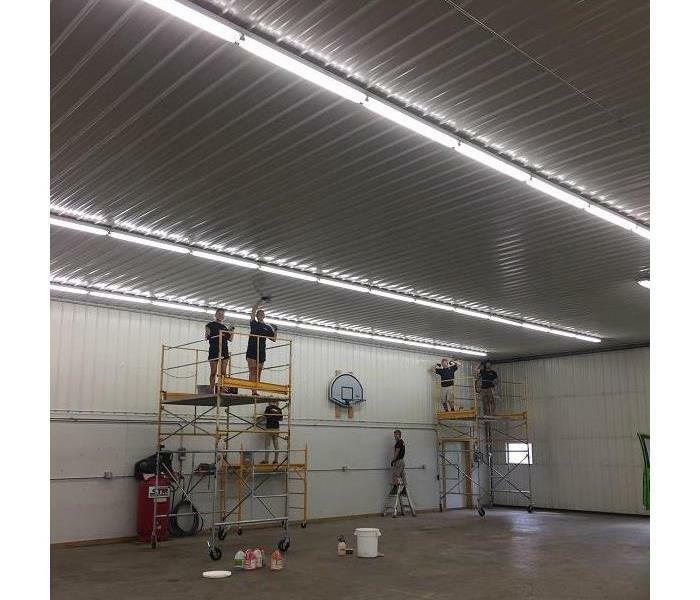 Due to it being a commercial building, SERVPRO employees worked after hours to get the job done. If your home or business experiences a fire, call SERVPRO of St. Cloud at (320) 248-5400. SERVPRO of St. Cloud helps with residential and commercial losses. SERVPRO of St. Cloud is able to help with any size loss, from small residential water or fire jobs to large commercial losses. This photo shows a fire that occurred in a commercial building with several offices affected. SERVPRO of St. Cloud is able to join forces with the large loss division to get the building back to full operating power. Should your business suffer any fire or water damage, please contact SERVPRO of St. Cloud at (320) 248-5400. We are here to help in your time of need! Let SERVPRO of St. Cloud help you with your water damage! What should you do if you have a water loss in your house such as a toilet leak or a pipe burst? Call SERVPRO of St. Cloud to help! We are a 24/7 emergency response mitigation company with qualified people that want to help you in your time of need. Our production crew values cleanliness and respects your home. Notice this home that suffered water damage. 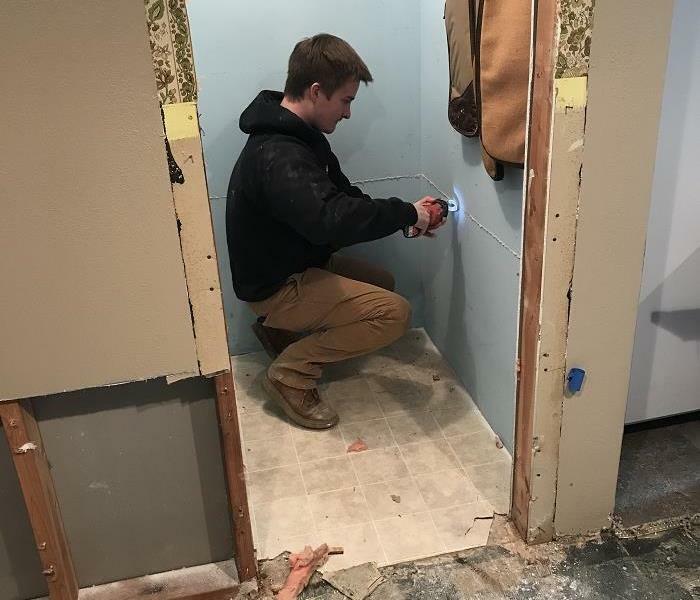 The technicians took pride in their work as the drywall needed to be cut and the job site was cleaned up before they left. As a homeowner, please entrust your home to our professional staff in your time of need. We can be reached 24/7 at (320) 248-5400. This home suffered from a water loss that resulted in flooding in the basement. The homeowners came back from vacation to find water spread throughout the entire basement. They immediately called their insurance company, who directly referred them to SERVPRO of St. Cloud. SERVPRO of St. Cloud was able to clean the mess and dry out the water disaster. After the water was extracted, SERVPRO of St. Cloud repaired the basement for the homeowners. Should you ever suffer from a water loss, SERVPRO of St. Cloud would love to assist you! We are available 24/7 and can be reached at (320)-248-5400. This home suffered from a fire in the attic, that spread very quickly. These homeowners called SERVPRO of St. Cloud who responded as quickly as possible. There was significant amount of smoke and soot damage that needed to be removed. SERVPRO of St. Cloud had the necessary tools and equipment to do so, removing all debris and filth from the fire. 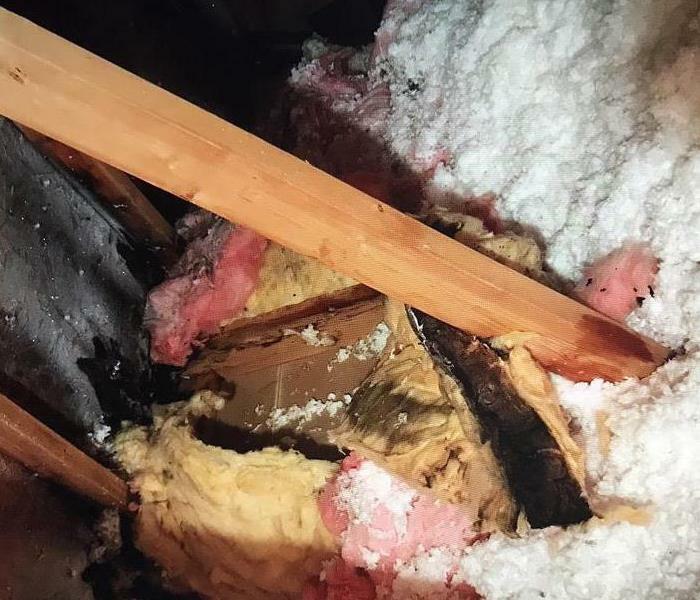 This attic was cleaned up and taken care of, which the homeowners were very pleased. Should you ever suffer from a fire, SERVPRO of St. Cloud would love to work with you and be there throughout the process! We are available 24/7 and can be reached at (320)-248-5400. This home suffered from an electrical fire, which caused minor damage to the house. The homeowners could still smell the aftermath of the fire that invaded their home. SERVPRO of St. Cloud stepped in and hot thermal fogged this home to eliminate the odor. The odor was completely eliminated and the home was free of any odor that resulted from this fire. 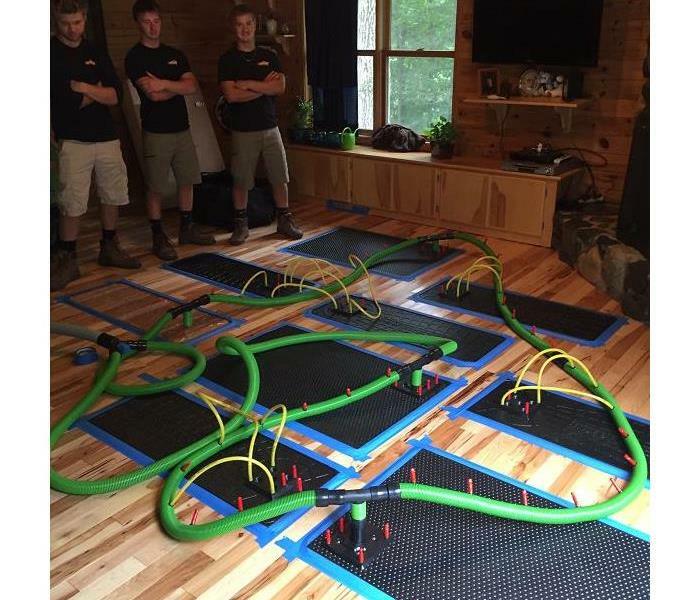 The homeowners were pleased with how fast SERVPRO of St. Cloud was able to efficiently remove all odors from their home after the fire. Should your home ever suffer from a fire, call SERVPRO of St. Cloud at (320)-248-5400. 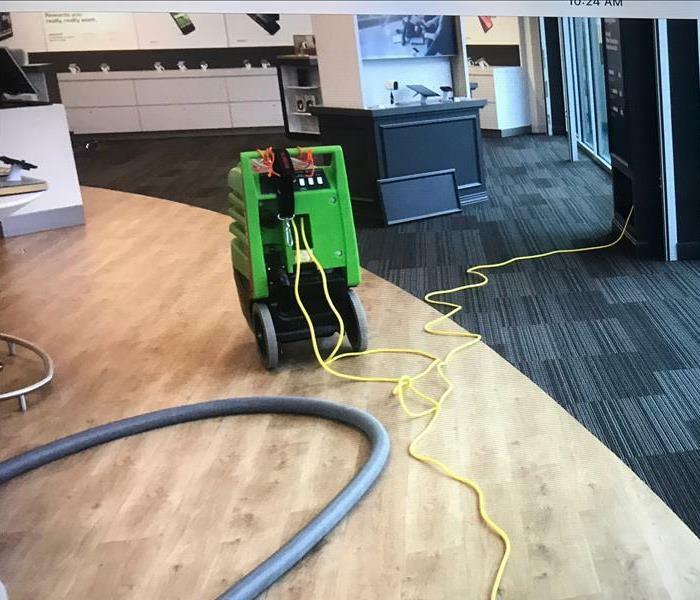 There was water damage at a local retail store in St. Cloud due to leakage from a broken pipe. SERVPRO of St. Cloud was able to extract and remove all water very efficiently. This store was able to keep their doors open to customers as SERVPRO of St. Cloud cleaned the damage so quickly. 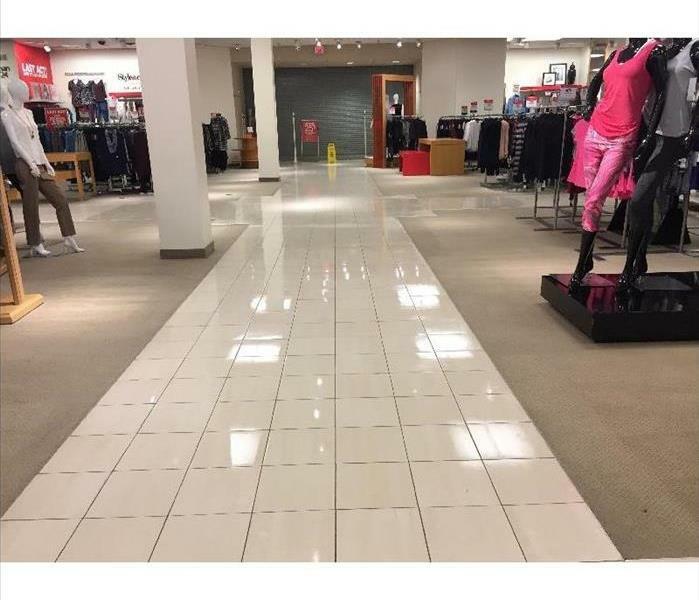 This store was pleased with the outcome and the fast results, as they didn't have to shut their doors with the damage they had. 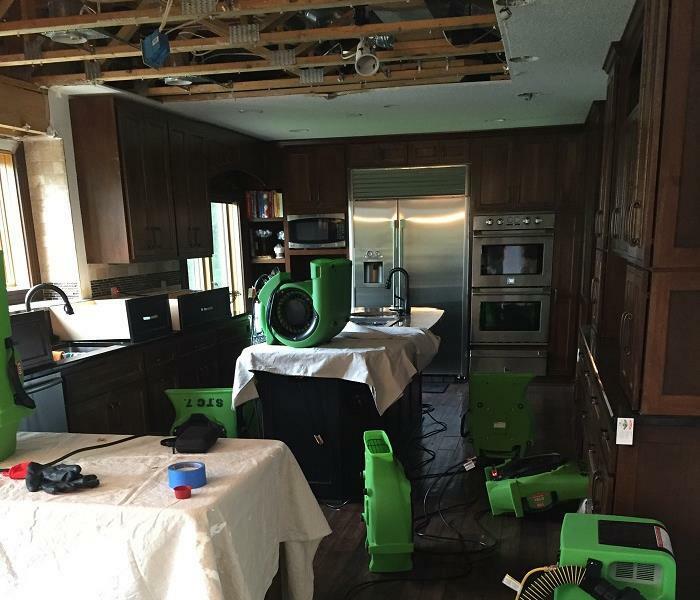 Should you ever suffer from water damage, SERVPRO of St. Cloud will work to clean it up as fast as they can!! Call us at (320)-248-5400. SERVPRO of St. Cloud assisted in helping this daycare remain a clean and healthy environment for all of the kids. It is especially important for daycares to keep up with the cleanliness of their area, so they are free of bacteria and germs for the children's health. This daycare called SERVPRO of St. Cloud to remove bacteria that has been collected and clean the carpets. SERVPRO of St. Cloud carpet cleaned the floors and removed all bacteria that was present. If you are ever in need of a carpet clean, SERVPRO of St. Cloud would love to do that for you! This was the aftermath of a fire that destroyed this home. 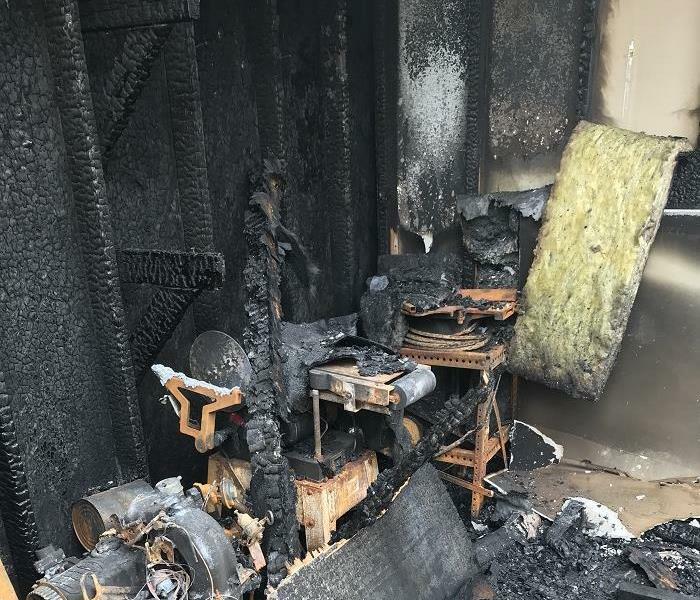 The homeowners lost the majority of their personal items and were unable to go through the home and find the possessions they wanted to keep with the mess. SERVPRO of St. Cloud helped the homeowners through the process and dispose of their contents that could not be salvaged. 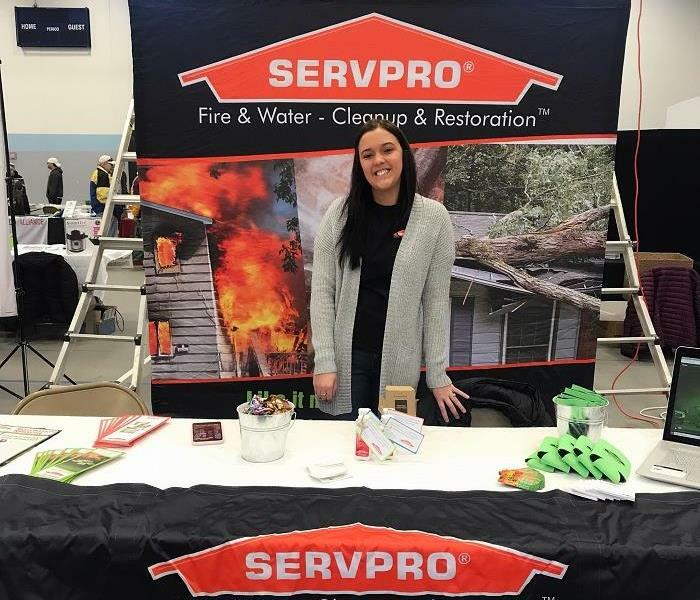 Should you ever suffer from a fire loss, SERVPRO of St. Cloud would love to assist you. We are available 24/7 and can be reached at (320)-248-5400. This home suffered from a water loss that was impacted mostly in the kitchen area. 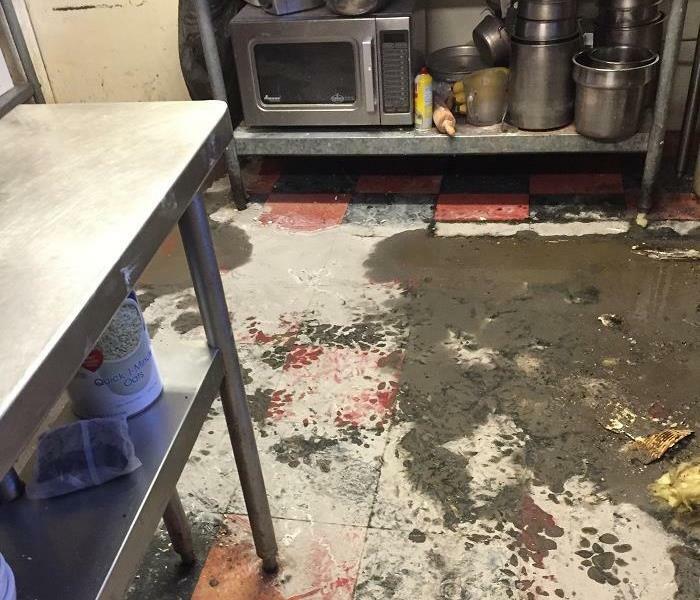 A dishwasher flooded and hundreds of gallons of water covered the floor. This homeowner called SERVPRO of St. Cloud for immediate removal and water extraction. SERVPRO of St. 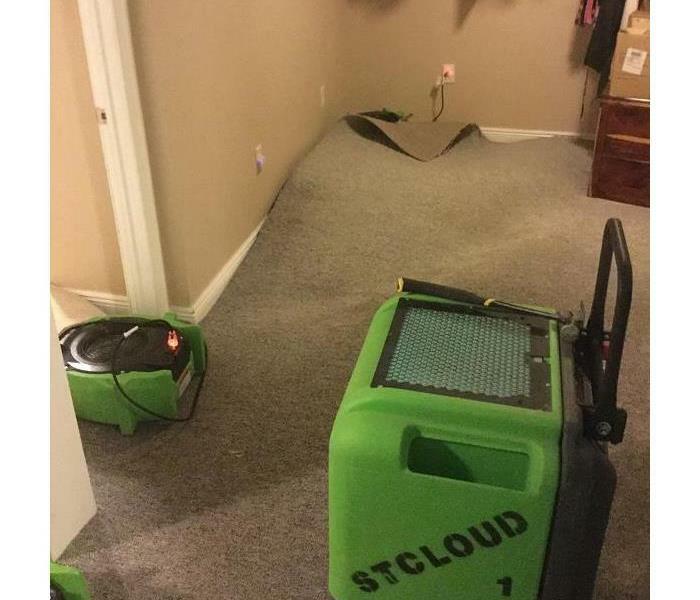 Cloud was able to effectively remove and dry out all water in a timely manner, with the different dehumidifiers that were used. These homeowners were pleased with the service and how their kitchen was as good as new! 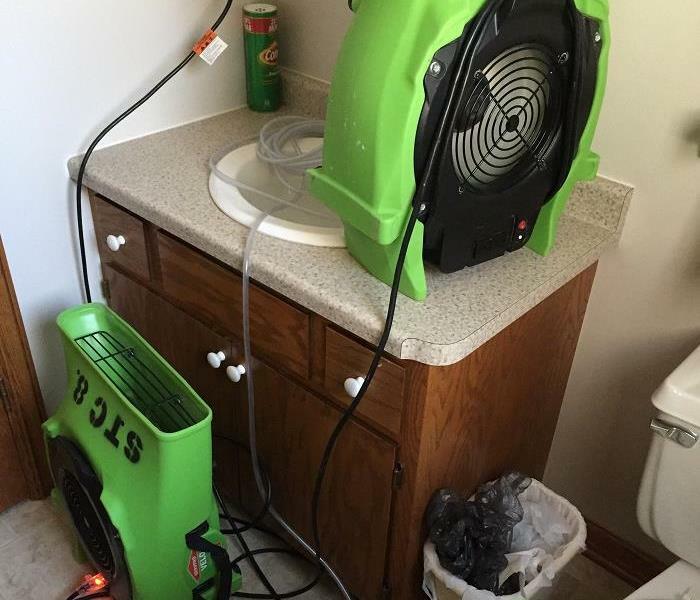 Should you ever suffer from a water loss, SERVPRO of St. Cloud would love to assist you in your need! Our number is (320)-248-5400. SERVPRO of St. Cloud drying out a bathroom. This home suffered a water loss after a leak in the kitchen. The water went under the hardwood flooring and ran into the bathroom area. SERVPRO of St. Cloud is able to detect the amount of moisture in materials and dry them out. This shows a floor drying mat system that will prevent cupping of the materials. Should your home suffer a water loss, please contact SERVPRO of St. Cloud at (320) 248-5400. We are available 24/7 and here to help! SERVPRO of St. Cloud assisted in drying out a commercial bank that suffered from a water loss. 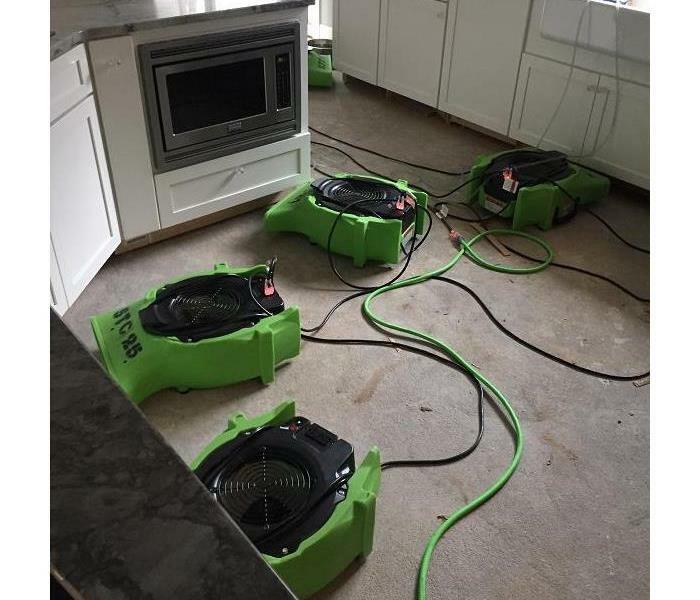 To effectively ensure that all water was removed, SERVPRO of St. 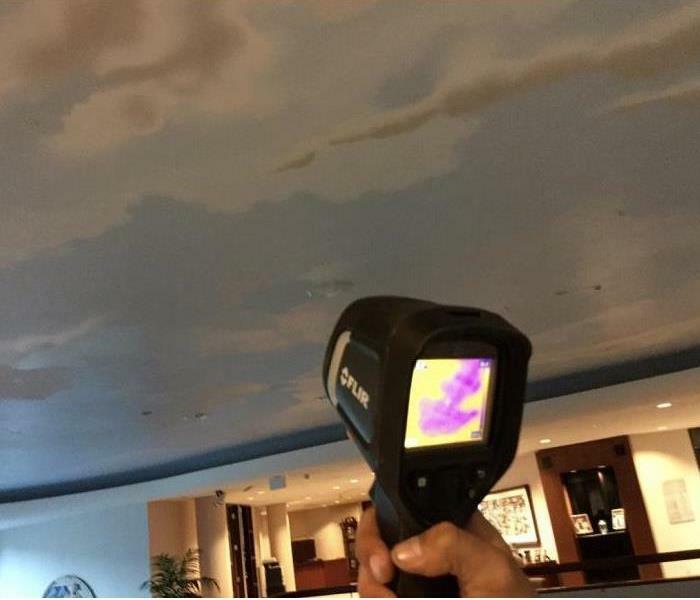 Cloud used this infrared camera that tests moisture from materials that cannot be seen with the naked eye. In doing so, the crew was able to properly remove all water, even the water that was not visible. 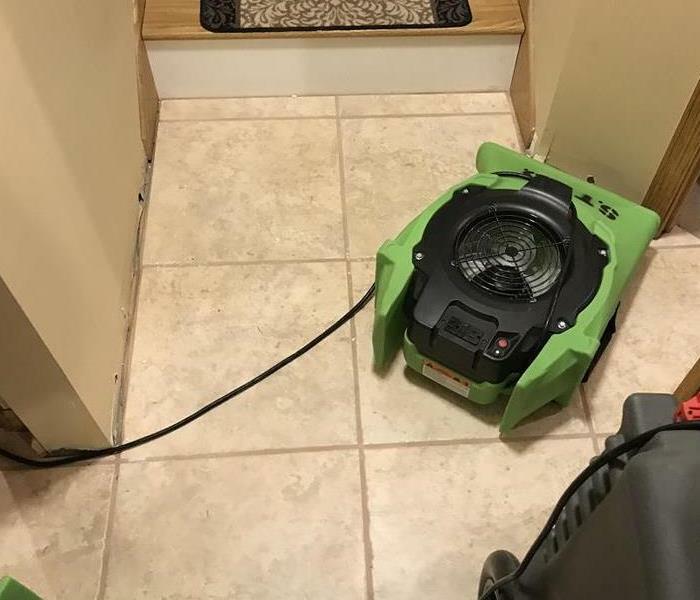 If you ever suffer from a water loss, SERVPRO of St. Cloud would love to assist you in your needs! We are available 24/7 and our number is (320)-248-5400. This home suffered from a water loss in the basement, due to a pipe burst. As a result, this home required the carpet, drywall, insulation, and trim to be removed to fully extract all water. SERVPRO of St. Cloud was able to do so efficiently, removing all unnecessary water due to the drying equipment that was used. The homeowner was pleased with the results, and wanted SERVPRO of St. Cloud to take care of the rebuild as well. Should you ever suffer from a water loss, SERVPRO of St. Cloud is able to clean up the disaster from start to finish, completing the rebuild as well. We are available 24/7 and would love to work with you! This home suffered from water damage, which was due from a pipe leak coming from the dishwasher. As a result, this led to water damage to the hard wood flooring in the kitchen area. 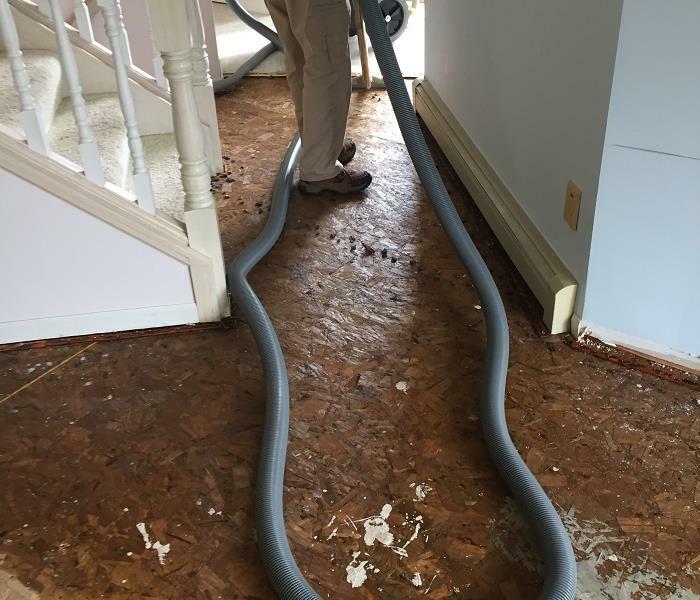 This homeowner did not want to rip out his flooring, and wanted to restore, if at all possible. In doing so, SERVPRO of St. Cloud was able to do so successfully with this floor drying mat system. In turn, the homeowner was pleased with the result, and the water was completely dried out quickly. Should you ever suffer from water loss, SERVPRO of St. Cloud is able to restore what you have! We are available 24/7 and would love to help in assistance. Our number is (320)-248-5400. This home was devastated from a fire after an electrical shortage. SERVPRO of St. Cloud removed all of the homeowner's personal belongings and helped navigate this difficult time with them. SERVPRO of St. Cloud needed to gut this entire house, as the fire damage was so severe and was a total loss to their house. Should you ever suffer from a fire or need assistance with the clean-up and rebuild, call SERVPRO of St. Cloud at (320)-248-5400. We are available 24/7 and would love to help. This home suffered from a water loss which started in the laundry room, and caused the water to travel down to the lower level of the home. The water damaged the hard wood flooring and carpet. The homeowners liked their flooring and wanted to save it, if at all possible. SERVPRO of St. 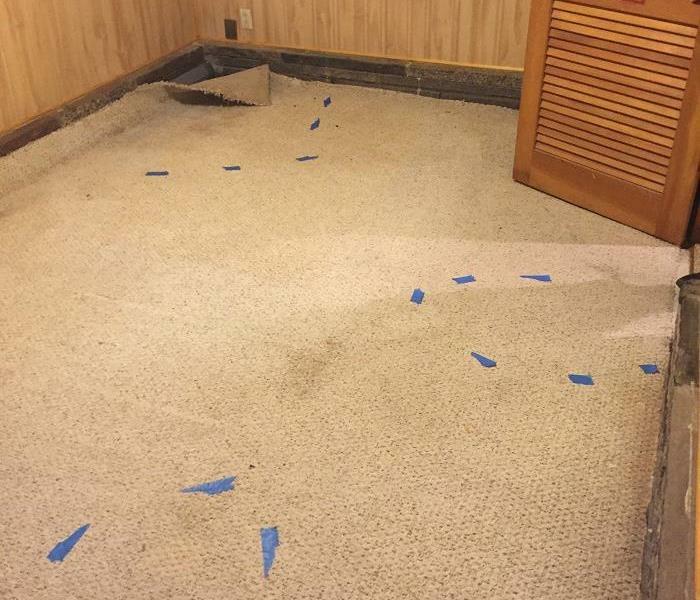 Cloud used these drying mats to restore this flooring, without having to rip it out. This technique was cost effective and less disruptive. In doing so, SERVPRO of St. 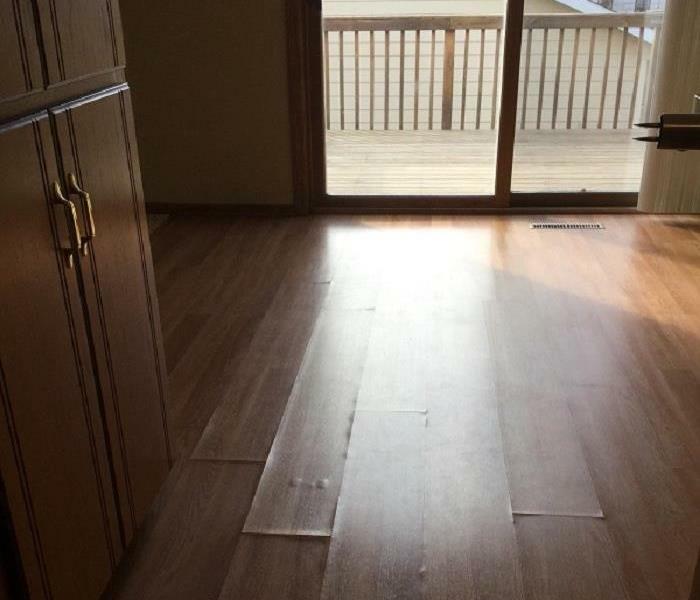 Cloud was able to save this flooring, and the homeowner was pleased with the outcome. Should you ever suffer from water loss, SERVPRO of St. Cloud will be glad to help. We are available 24/7 and our number is (320)-248-5400. 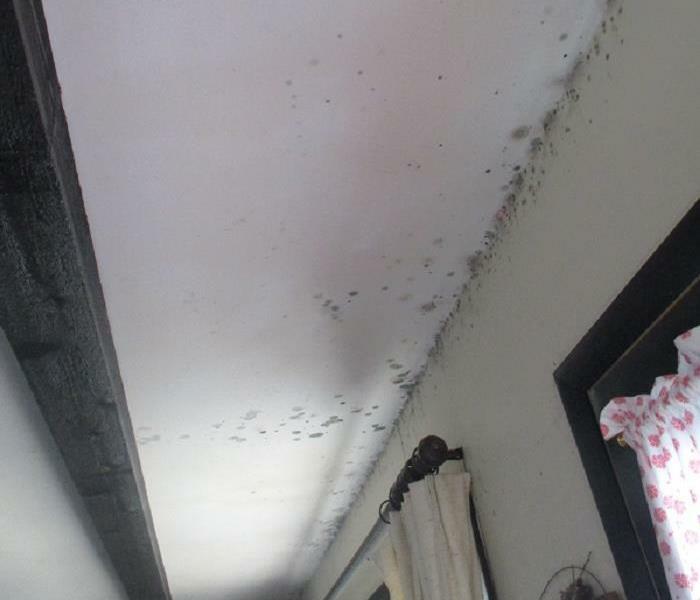 This home suffered from a water loss that damaged the ceiling, walls, and floor. This was due to a pipe burst in the wall cavity, in which the interior walls needed to be removed. SERVPRO of St. Cloud was able to do so quickly and efficiently, so they could begin the rebuild. Should you ever suffer from a water loss, please call (320)-248-5400! We are available 24/7 and would love to help. 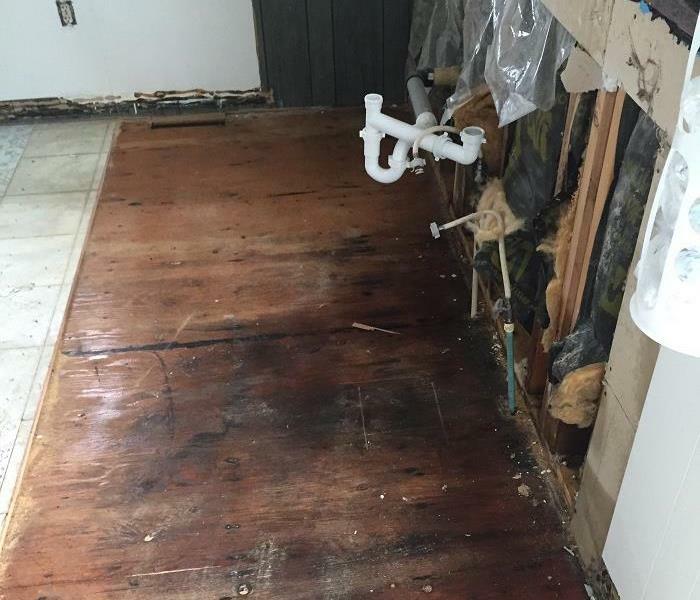 This home suffered from a water loss in the bathroom and continued down to the basement. This home has been remodeled to be handicap accessible, and as a result, there is a false floor that needed to be dried out that isn't visibly seen. SERVPRO of St. Cloud set up this a containment area concentrating on drying the ceiling directly above. SERVPRO of St. Cloud was able to successfully remove all water by directly drying the ceiling with this air ducting system. Should you ever suffer from water loss, SERVPRO of St. Cloud is available to help 24/7! Call us at (320)-248-5400. A large in-home fire left this house completely destroyed, and was a total loss to the house. SERVPRO of St. Cloud was called and was able to dispose and sort through personal belongings. This photos illustrates the high intensity of insulation and debris that was covered in soot. All belongings in the home were charred, and SERVPRO of St. Cloud was able to assist the home owner during this difficult time. SERVPRO of St. Cloud strives to make difficult situations a bit easier, as we are there throughout the process. Should you ever suffer from a fire loss or need assistance in any other hazard, please contact us at (320)-248-5400. 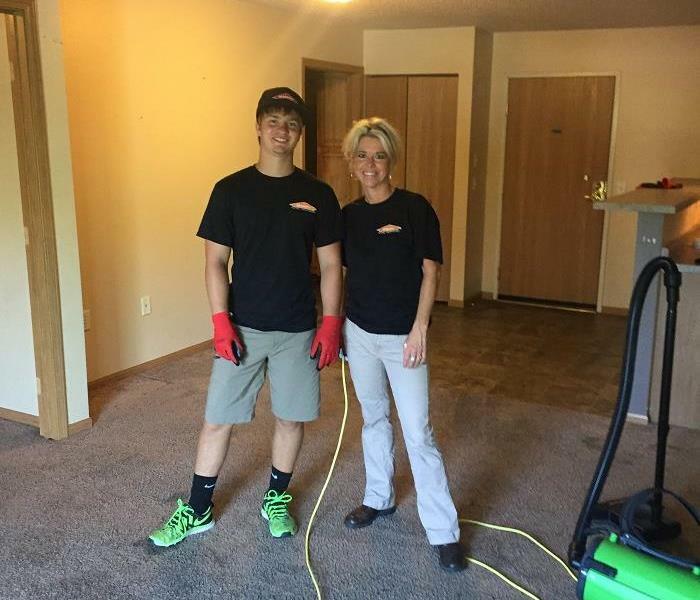 SERVPRO of St.Cloud cleaned out an entire 9 story dorm building at St. Cloud State University to prepare for the following school year quickly approaching. The crew worked together to HEPA vacuum the drapes, ceiling, and walls. Other crew members were busy scrubbing down all the individual dorm rooms, eliminating all residue built up in the cabinets, window sills, and desk drawers. Carpets were cleaned throughout the building. This building has not been occupied for the last four years, and as a result, a lot of debris and dust accumulated. SERVPRO of St. Cloud worked together to clean this building efficiently and in a timely manner. If you are needing any type of cleaning done from mold, biohazards, or commercial, SERVPRO of St. Cloud will be glad to help! We are available 24/7 and can be reached at 320-248-5400. SERVPRO of St. 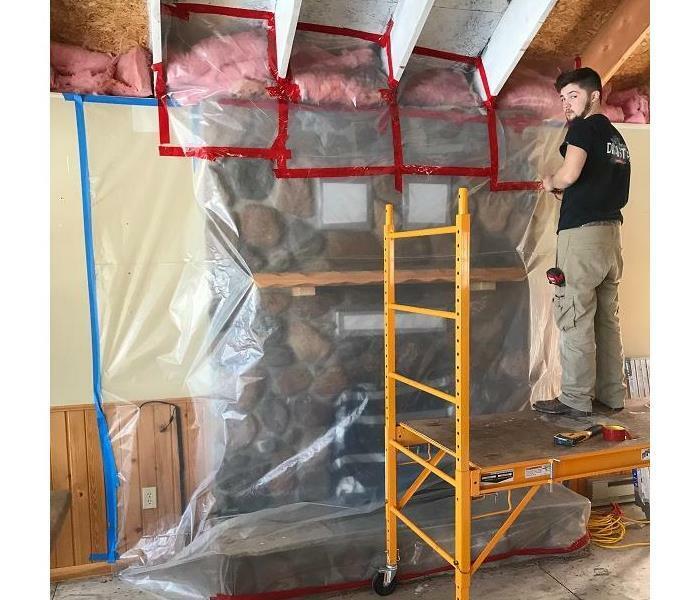 Cloud restoring a fireplace after a fire damaged a cabin. With a cabin in full use with spring and summer activities, a fire abruptly ended the home owners activities. 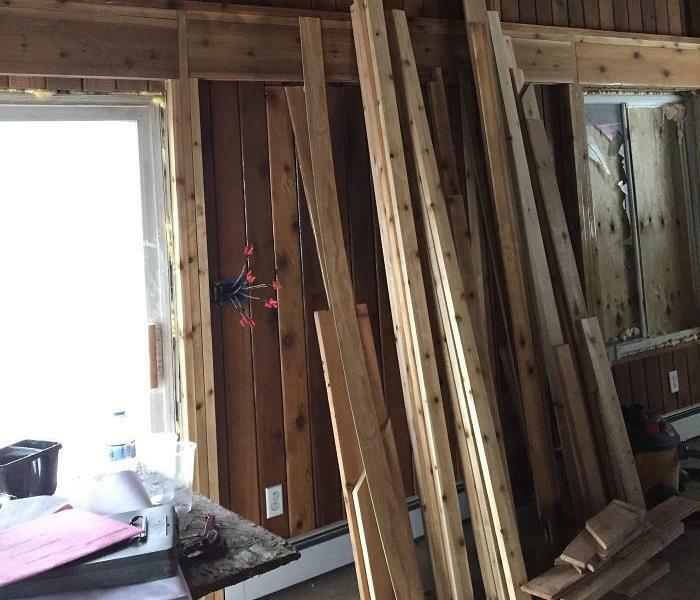 A chimney fire started which resulted in the cabin's walls and ceilings to be greatly damaged. SERVPRO of St. Cloud responded quickly and was able to get to the scene promptly. SERVPRO of St. Cloud was able to restore many materials including the fireplace shown. The homeowners were pleased with the service and work from the crew. Should your home or business suffer fire damage, please contact SERVPRO of St. Cloud at (320) 248-5400. We are available 24/7 and always here to help! SERVPRO of St. Cloud is restoring carpet from a water loss. This home suffered a water loss to their home. Although the entire basement was affected, the water was clean water and we are able to dry out the materials instead of tearing them out. This photo shows the carpet being floated and air movers drying out the carpet from the underneath side. This technique saves money and allows the repair process to be minimal. Insurance companies and home owners are pleased with how efficient the process goes. Should you suffer water damage to your home or business, please contact SERVPRO of St. Cloud at (320) 248-5400. We are here to help! SERVPRO of St. Cloud drying out a floor and saving materials! A water loss at your home can cause frustration and an inconvenience. SERVPRO of St. Cloud tries to minimize the amount of time that your home is disrupted. In order to do that, we want to restore as much materials as possible instead of removing them. This photo shows a kitchen floor that was wet. Instead of removing the wood, we have in floor drying mat systems to dry the materials. The homeowners were pleased with how fast the floor was dry and how little inconvenience there was. 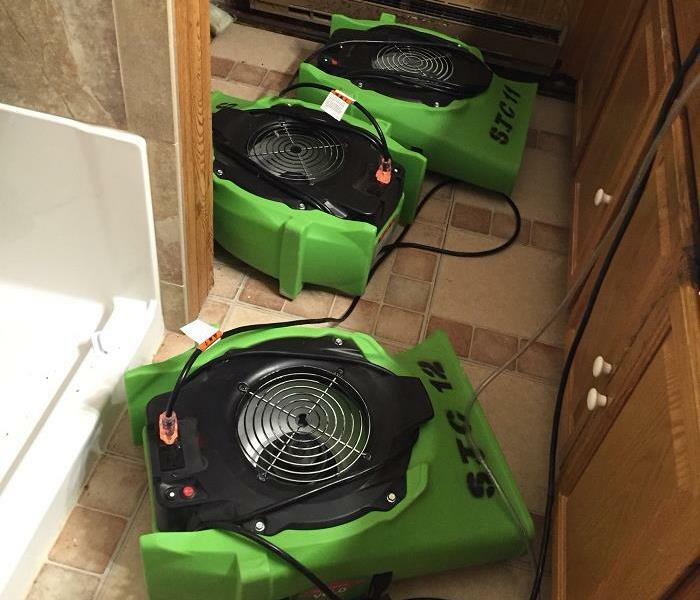 Should you or your business suffer water damage, please contact SERVPRO of St. Cloud at (320) 248-5400. We are available 24/7 and happy to help! SERVPRO of St. Cloud is cleaning after a fire occurred! This home suffered a fire loss after there was a fire in the chimney. The fire department was able to extinguish the fire; however, there was soot and an odor throughout. The ceiling had a knotty pine tongue and grove ceiling that needed to be removed. Our technicians were able to HEPA vac the ceiling and walls prior to cleaning as shown. It is important to do the proper steps in cleaning a fire in order to eliminate the odor entirely. Should your business or home suffer a fire, please contact SERVPRO of St. Cloud at (320) 248-5400. We are available 24/7 and here to help meet your needs! Water damage throughout the flooring. SERVPRO of St. Cloud tearing out a floor! This home suffered extensive water damage after a home was left unoccupied for an extended period of time. 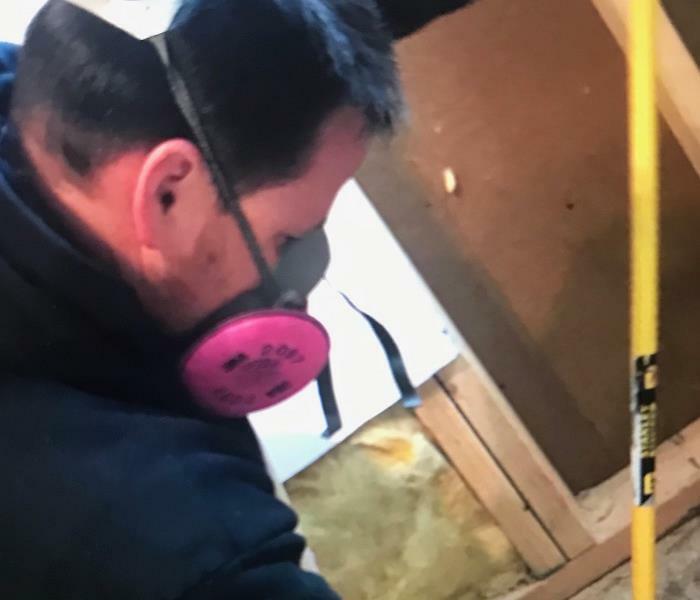 When the homeowner returned, they found that the pipes burst in the house causing water puddling on the main floor and down into the lower level. SERVPRO of St. Cloud responded. Due to the amount of time that the water was standing, we were not able to restore the materials but had to remove them. The homeowner is pleased they they are able to work with one contractor throughout this process. Our construction background is critical and the crew's skill is so helpful in these situation. 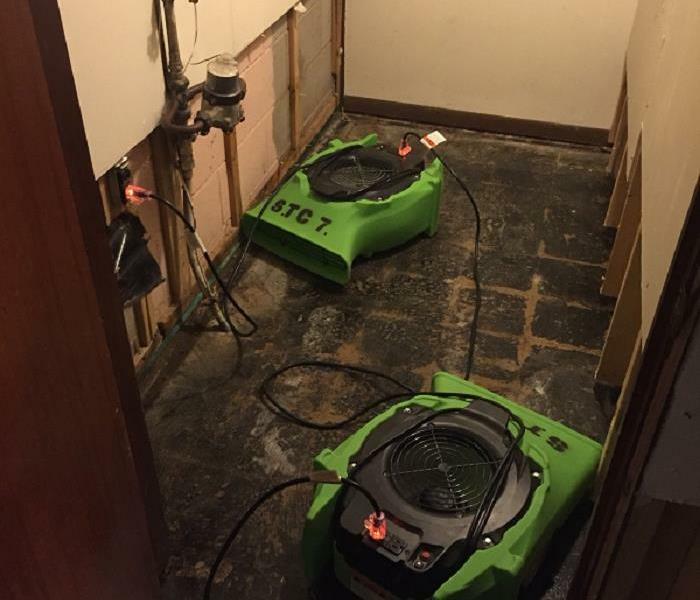 Should you suffer water damage, please contact SERVPRO of St. Cloud at (320) 248-5400. We are available 24/7 and always here to help! SERVPRO of St. Cloud has chemicals that can clean almost anything! Does your home or business have areas of dirt, grease, and grime that you think may never be able to come clean? Do you not have enough time in your day to clean it yourself or with you staff? If so, contact SERVPRO of St. Cloud for all your industrial cleaning! We have a wide variety of products that will able to work through the toughest stains. Our chemicals are top notch, like no other. You will be amazed at the strength of our products and the results that we can make. Should your business have an upcoming project, please contact SERVPRO of St. Cloud at (320) 248-5400. We would be available to provide a cleaning estimate and test our products for you to see the results! Fire destroys a home... SERVPRO of St. Cloud is there to help. This home was engulfed with flames after the curtains caught on fire. The house is severely damaged and a majority of the homeowners personal property is a complete loss. SERVPRO of St. Cloud has been hired by the insured to help navigate the insurance process in regards to their personal property. SERVPRO of St. Cloud has the ability to determine if contents can be cleaned and deodorized as a result of a fire. SERVPRO of St. Cloud can go through all of the individual items to help make a list for the insurance company of the items that are salvageable and those items that are not. We hope that you are never involved in a fire. However, if you are, SERVPRO of St. Cloud would love to help in that time of need. SERVPRO of St. Cloud is available 24/7 and can be reached at (320) 248-5400. This Thanksgiving, homeowners returned to their house to find water damage in the kitchen as their kitchen faucet leaked. Water ran down into the lower level damaging the ceiling and walls. SERVPRO of St. Cloud wants to restore materials instead of ripping them up and replacing as it is more economical and less of a convenience for our customers. We set up our equipment and was able to dry out the kitchen island. The homeowner were pleased with the work. Should you suffer water damage as a result from a leaky toilet, dishwasher, or pipe burst in the winter, please contact SERVPRO of St. Cloud at (320) 248-5400. We are available 24/7 and always here to help! Is this a spider cobweb? No, its formed from a fire! At first glance, this looks like a large cobweb formed from a spider. However, this is actually caused from a fire. Cobwebs often form following a fire throughout the area. 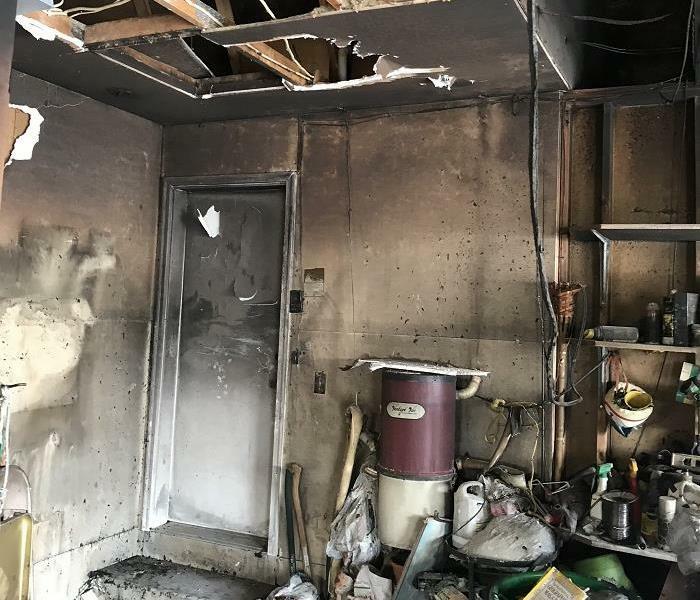 This home in Central Minnesota suffered a kitchen fire which resulted in chemical residue throughout. There was a strong odor present along with soot and cobwebs in spite of not having flames or the fire department dispatched. SERVPRO of St. Cloud has provided an air scrubber and in the process of cleaning the home so they can return quickly. Should your home or business suffer from a fire, please contact SERVPRO of St. Cloud. We are available 24/7 and would love to assist you in time of need. Water damage started in this bathroom; however, not everything needs to be removed! SERVPRO of St. Cloud takes pride in restoring materials instead of cutting them out and removing them. 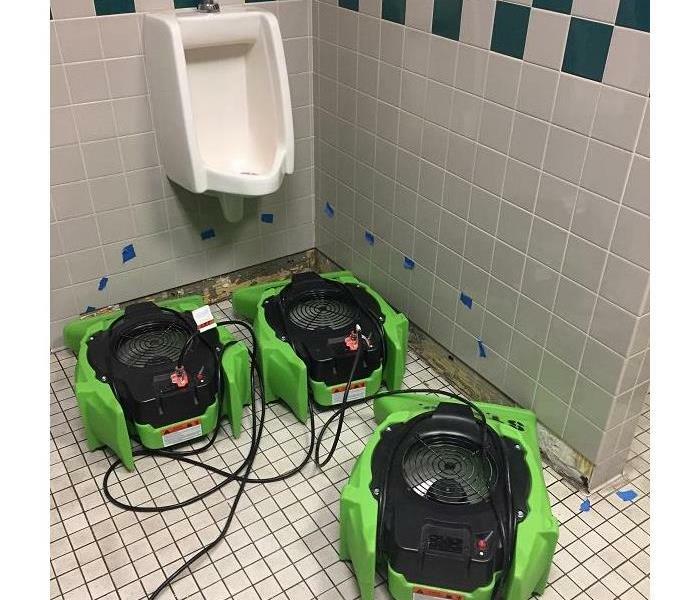 This bathroom shows this as the air movers and dehumidifier is drying out the materials. One critical step is the amount of time that lapses when we arrive on the scene. These homeowners contacted us immediately which results in helping the drying process. Should your home or business suffer fire or water damage, please contact SERVPRO of St. Cloud at (320) 248-5400. We are available 24/7 and always here to help! SERVPRO of St. Cloud is drying out walls by drilling holes in the drywall. Do you have water damage and afraid that your house is going to be destroyed by drying it out? SERVPRO of St. Cloud understands that your home is important to dry out but not to cut out drywall and other materials if you don't have to. 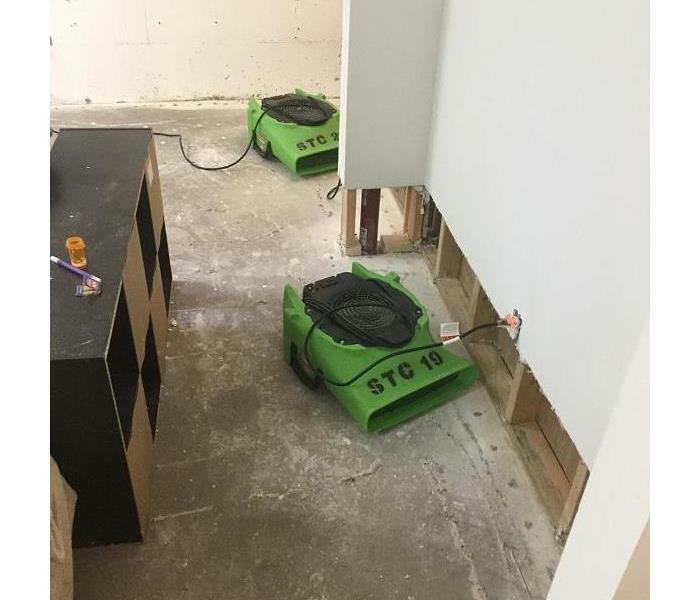 Here is a photo of air movers placed strategically where the baseboards have been removed and holes drilled in the drywall. 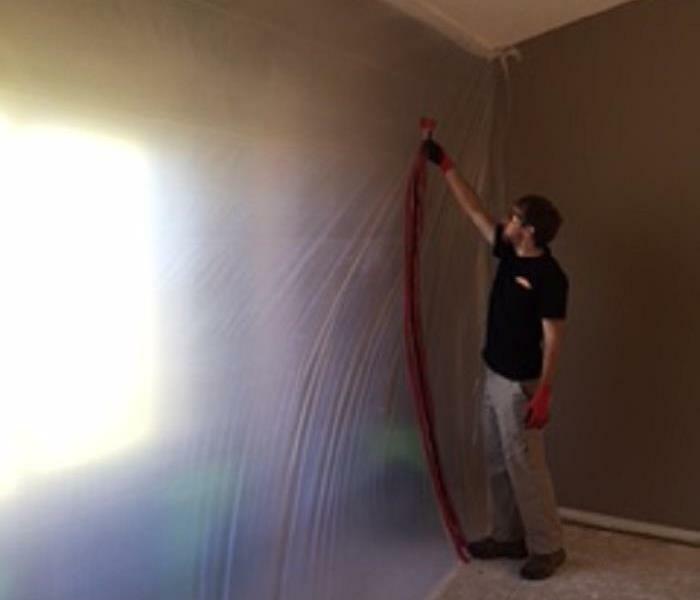 The air is able to dry out the wall cavities instead of cutting out all of the sheetrock. SERVPRO of St. Cloud wants to protect your home. Should you have any water or fire damage, please contact SERVPRO of St. Cloud at (320) 248-5400. We are available 24/7 and always here to help! SERVPRO of St. Cloud taking readings... The science behind the drying. 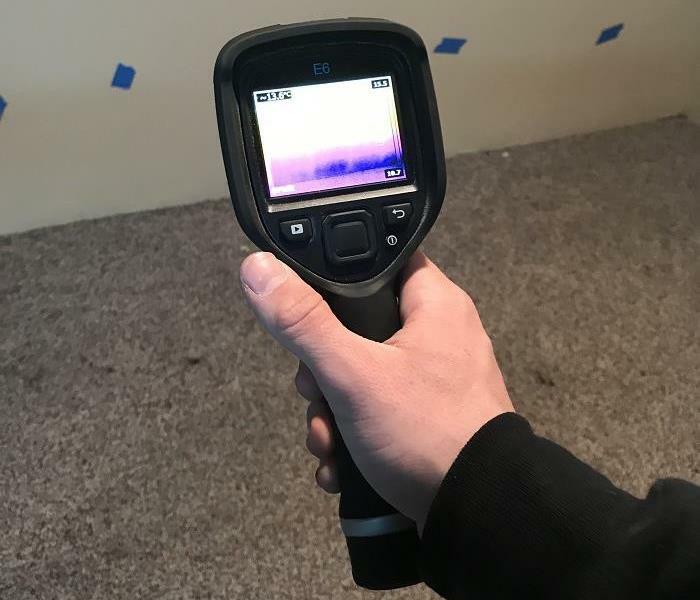 Have you ever wondered how we are able to determine if your wet materials in your home is dry? Are you glad that we don't just "feel" the materials to see if we think they are still wet? We are happy to tell you that there is a science behind the drying. SERVPRO of St. Cloud has a variety of drying equipment including air movers, dehumidifiers, injector drying systems to best dry out your house or business. We take readings and it is calculated to show when the materials are dry. Here an employee is taking the temperature in the room along with dehumidifier readings to help determine the drying progress. 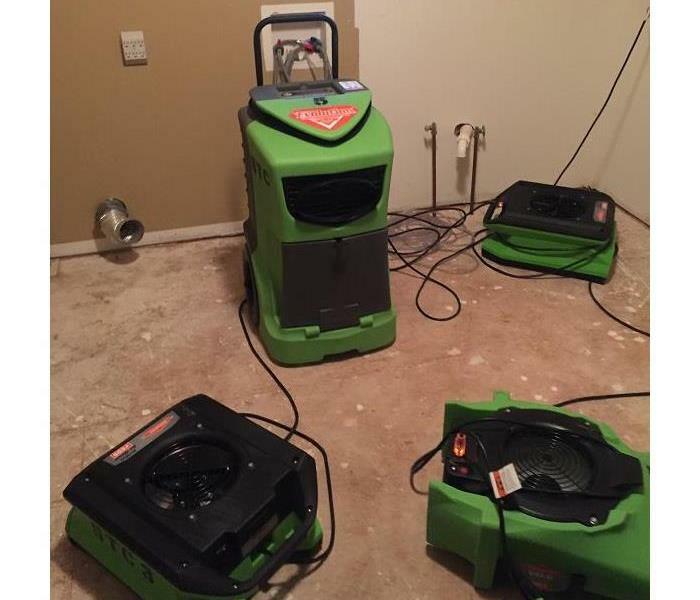 If you have any water damage from a sump pump failure, pipe burst, or any other leak, please call SERVPRO of St. Cloud at (320) 248-5400. We are available 24/7 and always here to help! SERVPRO of St. 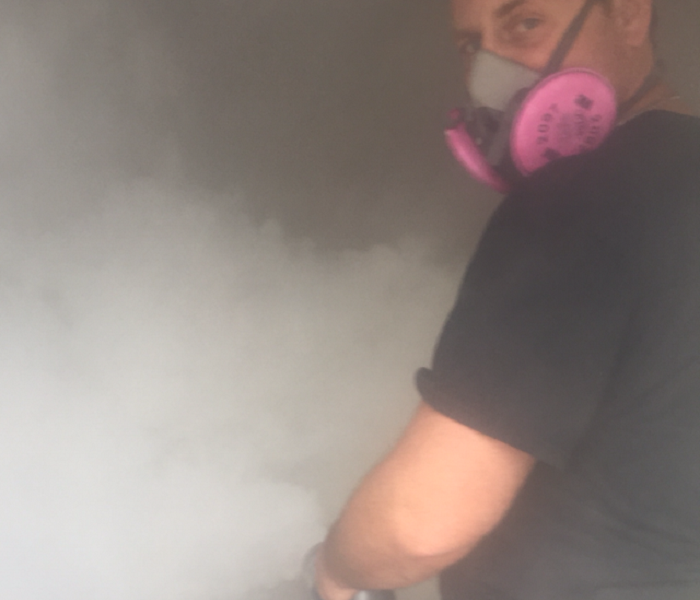 Cloud drying out a commercial building! A local business in St. 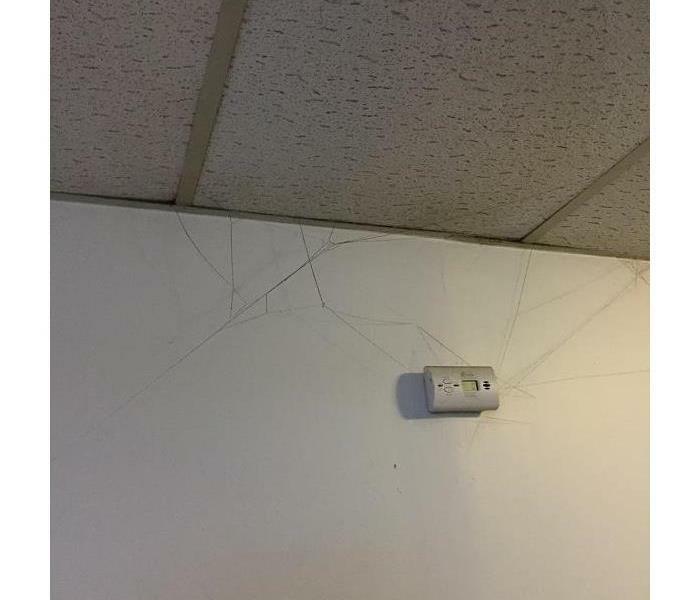 Cloud suffered water damage in the walls of their office. SERVPRO of St. Cloud was able to determine the affected walls. As SERVPRO of St. Cloud's philosophy is to restore materials instead of replacing them, we have a variety of drying equipment to use. This photo shows equipment used to dry behind cabinets and other hard to reach places. 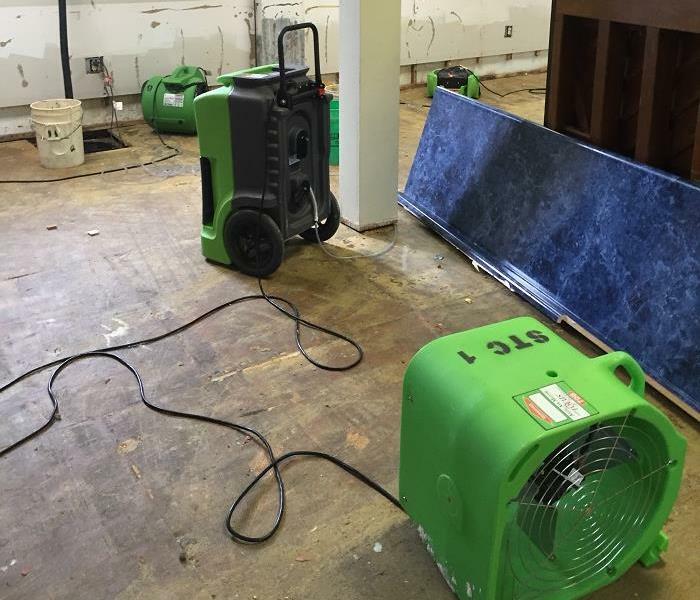 Should your business or home have water damage, please contact SERVPRO of St. Cloud at (320) 248-5400. We are available to help 24/7! Dishwasher started on fire and caused soot throughout! 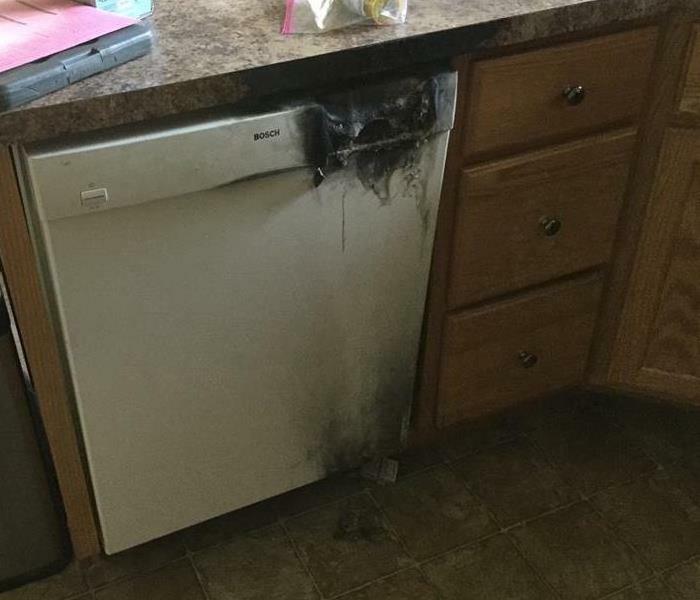 This dishwasher started on fire causing damage to the home. Fortunately, the fire alarms went off and the homeowner was able to use a fire extinguisher to get it out. The soot and fire odor was prevalent throughout. SERVPRO of St. Cloud was contacted and was able to deodorize and clean the home for them. 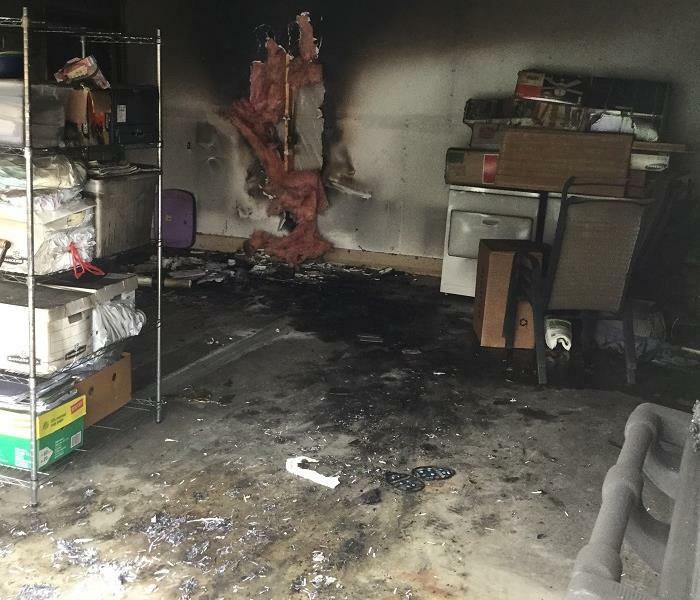 Should you have any fire damage to your office or home, please contact SERVPRO of St. Cloud at (320) 339-3737. We are always here to help 24/7! SERVPRO of St. Cloud provides great cleaning for businesses! Although SERVPRO of St. Cloud specializes in fire and water restoration, we are proud of our commercial cleaning that we provide. 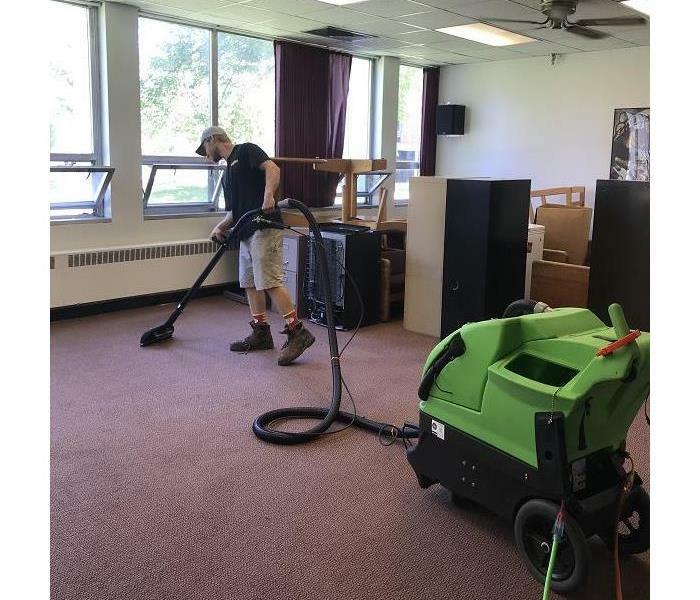 Our staff will work with your business or office building should you have carpet cleaning, light office cleaning, or a deep cleaning that needs to happen. Call SERVPRO of St. Cloud at (320) 248-5400 for a cleaning estimate today! SERVPRO of St. Cloud is drying out a basement! This home in St. 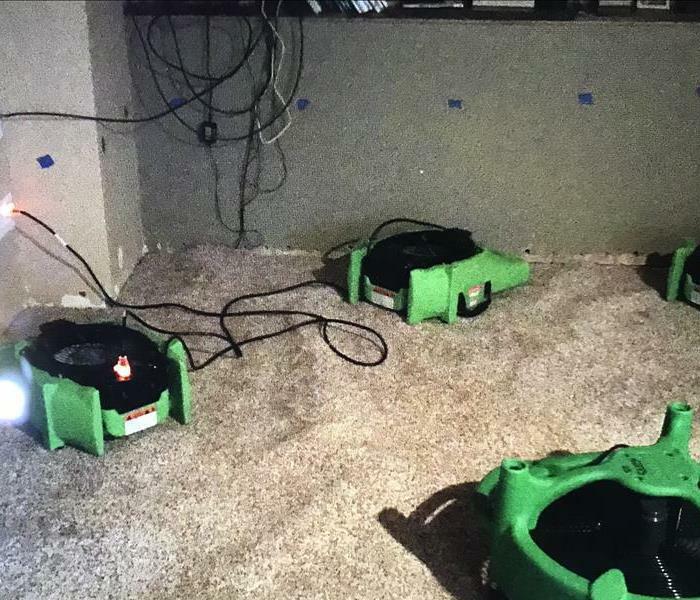 Cloud, Mn had a wash machine leak in the lower level causing damage to the carpet, pad, and drywall on the walls. SERVPRO of St. Cloud responded to the home. The homeowners were pleased with our workmanship as our crews take pride in the quality of work performed. Note the containment area where the drying equipment was placed inside of. The drywall is neatly cut and the floors cleaned after the carpet and pad had to be removed. 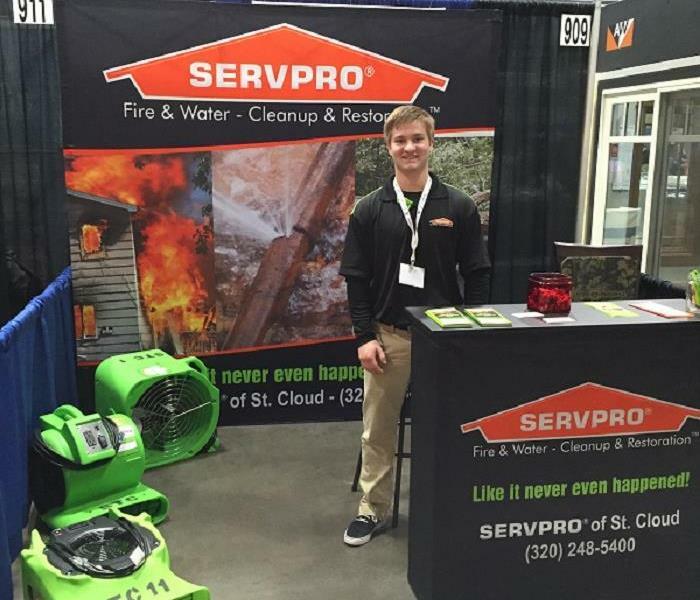 Should your business or home suffer water or fire damage, please contact SERVPRO of St. Cloud to help in your time of need. We are available 24/7 at (320) 248-5400. SERVPRO of St. Cloud repairs roof after storm. Storm damage can cause havoc in your life. You may suffer from storm damage as a result of hail and your roofing and siding affected. Minnesota rains can cause heavy flooding and basements to show the affects with water damage. Cold winters can cause ice dams and roofs to leak. Whatever the cause, SERVPRO of St. Cloud would like to help you in your time of need. We understand the dynamics of water damage and how it affects your home and have 20+ years in construction to know how to best repair your home. 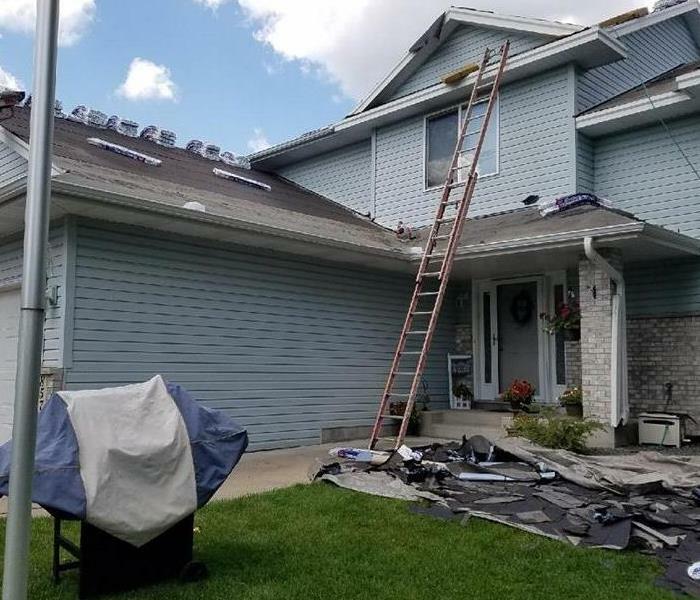 This home in Central Minnesota suffered hail damage to the roof and was repaired by SERVPRO of St. Cloud. Should your home or business suffer any form of storm related damage, please call SERVPRO of St. Cloud for an estimate. We are available 24/7 at (320) 248-5400. Restaurant grease fire causes damage! SERVPRO of St. Cloud to the rescue! 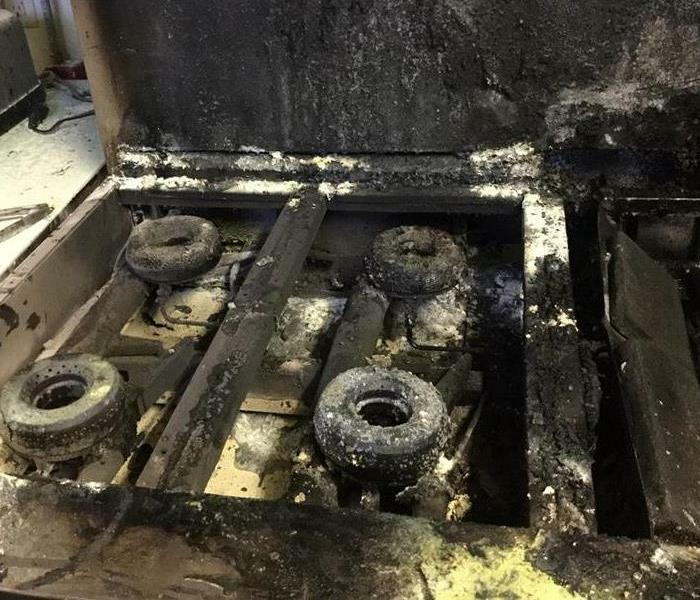 A restaurant in Central Minnesota had a grease fire in their kitchen. The local fire department responded quickly to prevent further damage. However, the debris, soot, and smoke odor was present throughout the entire kitchen and dining room. SERVPRO of St. Cloud responded within hours and is in the process of cleaning the debris and eliminating the smoke odor. Look for upcoming after pictures when the cleaning is complete. Should your business or home suffer a fire and unsure with what to do, please contact SERVPRO of St. Cloud. We are always here to help! We can be reached at (320) 248-5400. 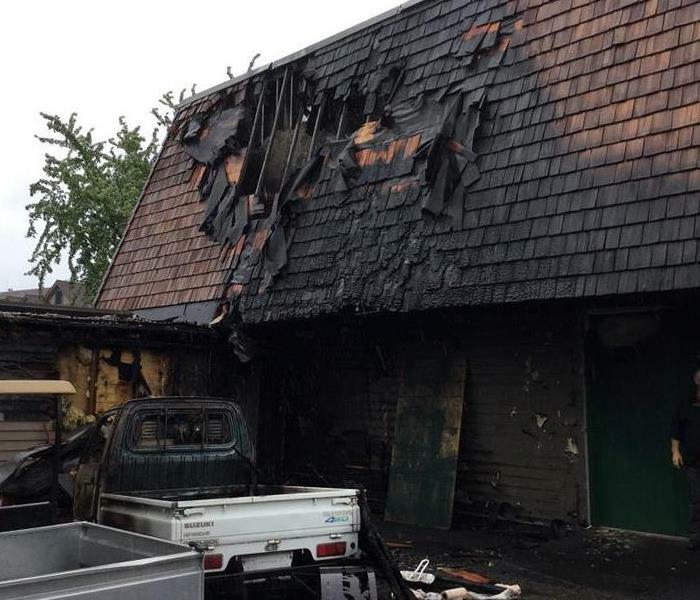 Fire at commercial property needs help from SERVPRO of St. Cloud! This property in Central Minnesota suffered a fire to the exterior of the building. As it is important to stay open for business, they contacted SERVPRO of St. Cloud to help with fire cleanup and deodorization. As the fire smell needed to be eliminated, it was important to provide deodorization through thermal fog, air scrubbers, and ozone machines. It was amazing how the fire odor smell was removed. Should your business, office, or home suffer from fire damage, please feel free to contact SERVPRO of St. Cloud at (320) 248-5400. We are available 24/7 and always here to help! We work with all insurance companies. SERVPRO of St. Cloud is drying out a laundry room! A homeowner came back to their house after work to find the wash machine leaked throughout the main floor and down into the lower level. They contacted their insurance agent who recommended SERVPRO of St. Cloud. We responded and dried out the materials. The homeowner were pleased with the process and how they were informed of the drying progress with their home. Although no one ever wishes to have a water or fire loss, we take pride in trying to make every claim the smoothest and best workmanship involved. We understand that this takes into account a clean job site, clear communication, and professionalism. Should you have a water or fire loss, please contact SERVPRO of St. Cloud at (320) 248-5400. We are available 24/7 and always here to help! SERVPRO of St. Cloud is cleaning a large pole shed! SERVPRO of St. Cloud offers a variety of services from water and fire damage to mold cleanup, reconstruction services as well as general cleaning. On this date, SERVPRO of St. Cloud cleaned a large pole shed emphasizing the lights, tall ceilings and walls. The owner was pleased with the professional quality, speed of work, and great service and performance. If your office needs additional cleaning, please contact SERVPRO of St. Cloud at (320) 248-5400 for all your needs! 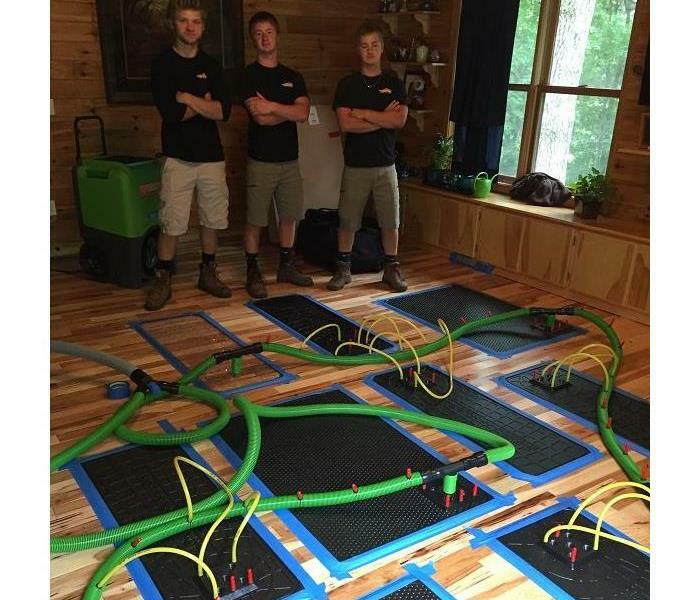 Drying hardwood flooring with the injector dry mat system! After a recent heavy storm in Central Minnesota, water came into this home from the roof and down into the flooring. SERVPRO of St. Cloud came out and provided emergency services to the exterior of the home and began to dry out the interior of the home. As SERVPRO of St. 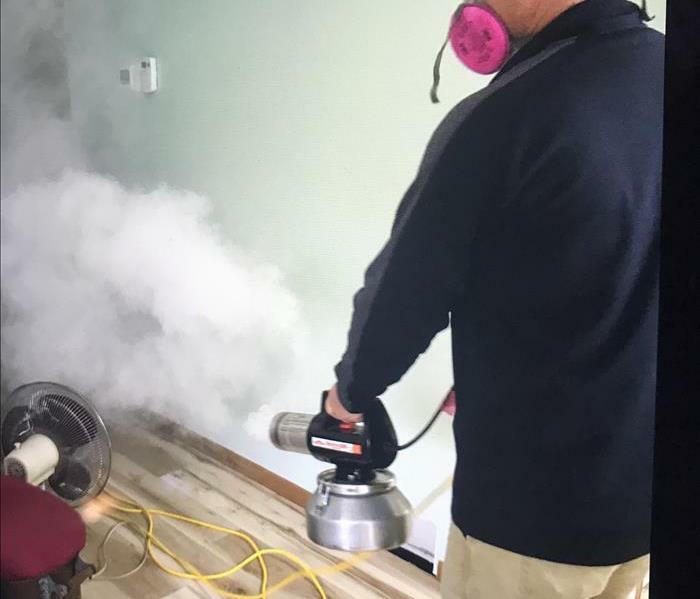 Cloud prefers to restore materials instead of replacing them, we installed an injector drying system to dry out the hardwood flooring. During the time we monitored the materials, we observed the flooring drying out without cupping or damaging the wood. Should your business or home suffer storm related damages needing water mitigation, please contact SERVPRO of St. Cloud at (320) 248-5400. We are available 24/7 and always here to help! Water damage in lower level. This home in central Minnesota had damage after a recent storm causing water damage throughout the lower level. SERVPRO of St. Cloud was able to provide emergency services to the homeowner. The carpet had to be removed along with a portion of the drywall. Note the clean job site as SERVPRO of St. Cloud's technicians are proud of how they leave each and every job. Should your home or business have water damage, please contact SERVPRO of St. Cloud at (320) 248-5400. We are available 24/7. 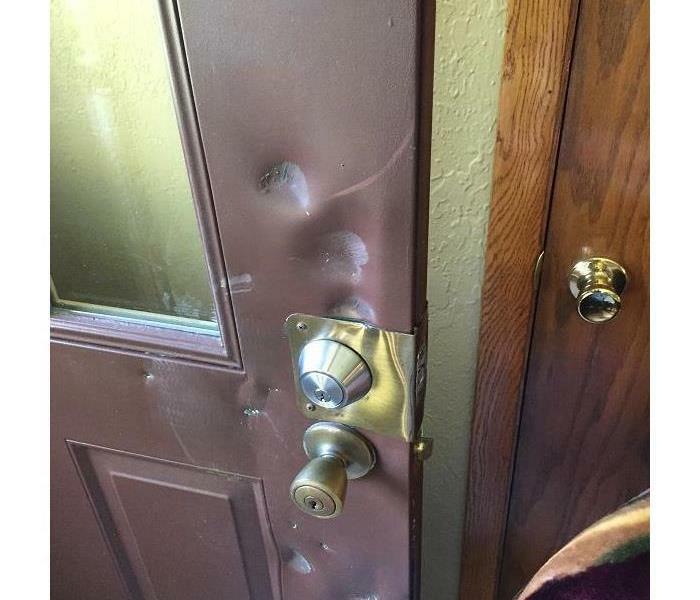 This home in Central Minnesota was vandalized after a burglary. The homeowners have worked with law enforcement, the insurance company, and SERVPRO of St. Cloud to get their property back to how it was before the burglary. This door shows the damages from being broken into. SERVPRO of St. Cloud is able to clean what they left dirty as well as repair damages with necessary construction. Should your business or home be affected by a burglary or vandalism damages, please contact SERVPRO of St. Cloud to help! We are open 24/7 at (320) 248-5400. Did you get hit by the recent storms? Call SERVPRO of St. Cloud to help! 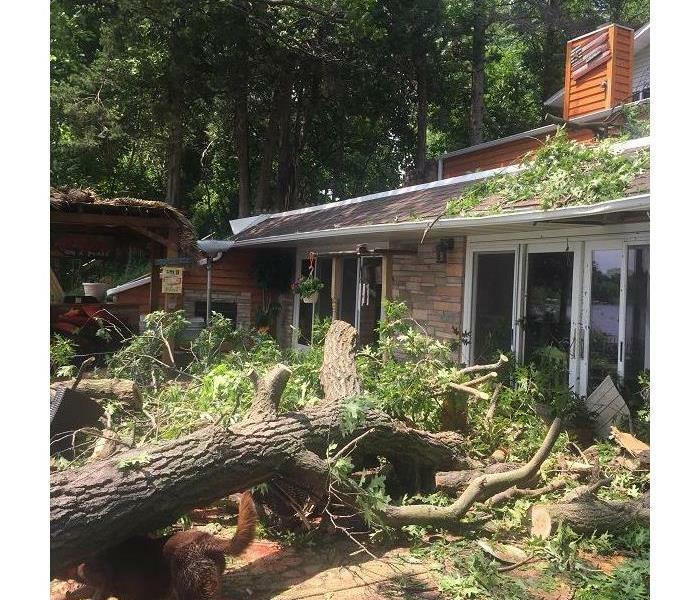 The recent storms throughout Minnesota damaged numerous homes and businesses with toppling trees, hail and wind damage. 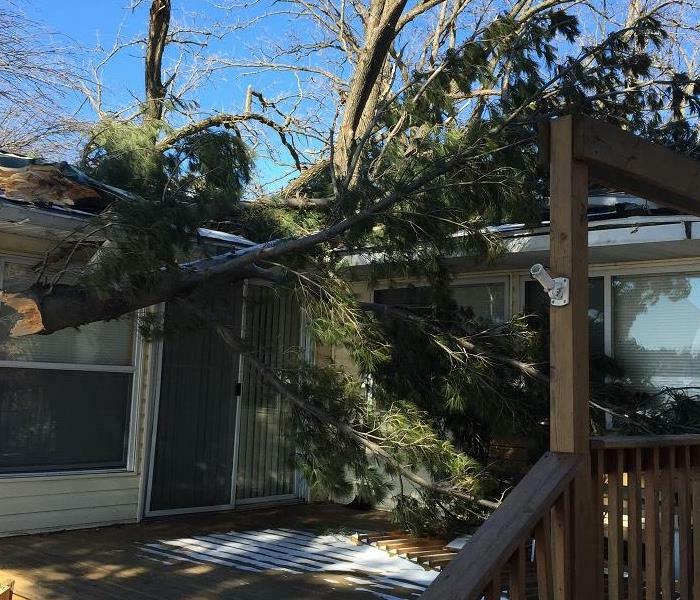 This home suffered interior and exterior damage after a tree punctured through the patio door. SERVPRO of St. Cloud was able to board up the home so no elements could further damage the interior. Should you suffer storm damage, please contact SERVPRO of St. Cloud at (320) 339-3737. Drying the flooring is SERVPRO of St. Cloud's specialty! This home had suffered water damage and the water went under the hardwood flooring in the kitchen and living room. SERVPRO of St. Cloud is in the process of drying the floor as we would rather restore the flooring instead of removing the flooring. Notice the containment area and drying specifically in this area. Should your home or business suffer water or fire damage, please contact SERVPRO of St. Cloud at (320) 248-5400. We are here 24/7 to help in your time of need! Water damage throughout the basement. A bathroom pipe burst upstairs causing water damage throughout the house. 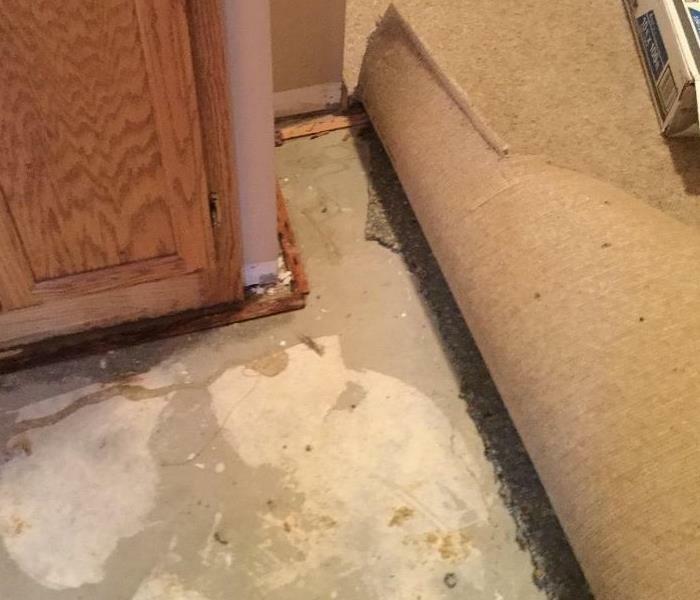 The homeowners came home to quite a mess and contacted SERVPRO of St. Cloud at 9 p.m. We were able to respond immediately putting their minds at ease. We needed to remove some of the materials but were able to dry out the walls in this closet. The customers are happy with how quickly we responded to their water loss. Should you find your home or business with water damage, please contact SERVPRO of St. Cloud at (320) 248-5400 for all your needs! SERVPRO of St. 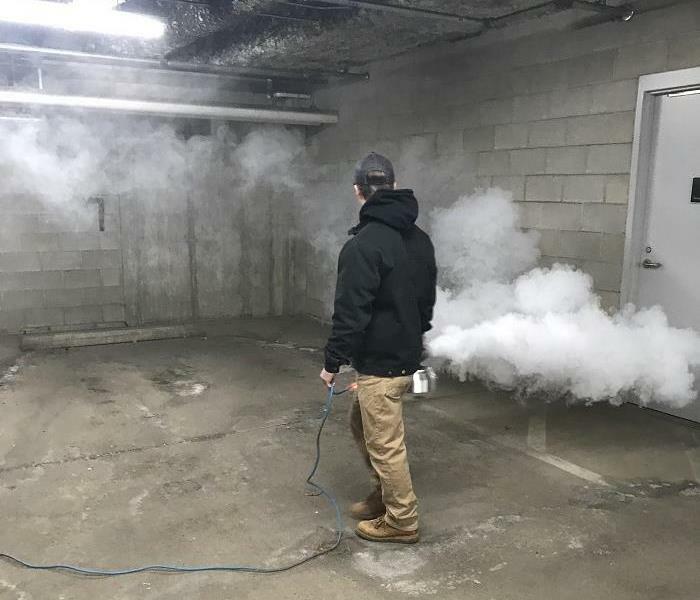 Cloud repairing a basement! Homeowners in Central Minnesota had a sewer backup that damaged the lower level throughout. They contacted SERVPRO of St. Cloud and we removed the damaged materials. We take pride in our work in the cleanliness of the job and how drywall or other materials are removed. We constantly remind ourselves that we want to leave your home or business the way we would to our own home. Should you have water, fire, or mold damage, please contact SERVPRO of St. Cloud at (320) 248-5400 for all your needs. We are available 24/7. 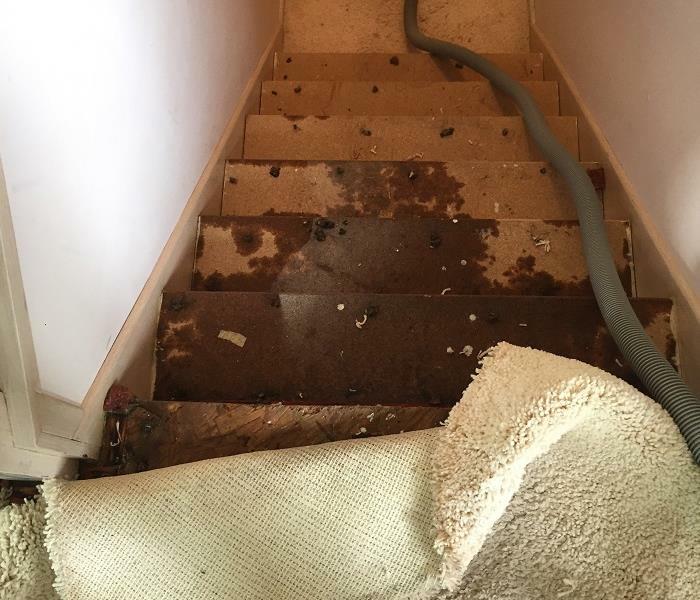 This homeowner woke up to find sewage backup throughout their lower level. They contacted SERVPRO of St. Cloud. We responded immediately and cleaned up the mess. The homeowners were pleased with our staff and how smooth the process went. 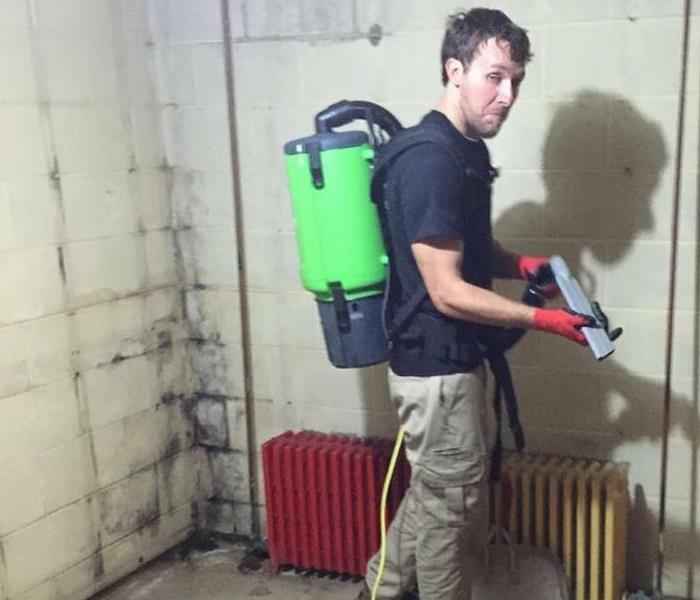 Should you have a sewer backup, or any other disaster including water damage, mold, or fire, please contact SERVPRO of St. Cloud at (320) 248-5400. We are here to help 24/7. SERVPRO of St. Cloud cleaning carpets in apartment buildings. SERVPRO of St. Cloud specializes in fire, mold, and water restoration. However, we also provide commercial carpet cleaning to apartments in businesses. A tenant moved out of this apartment in St. 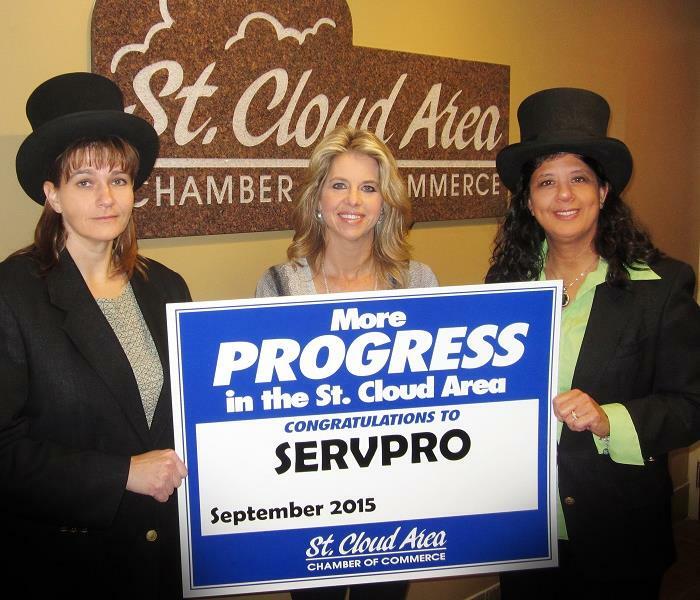 Cloud, Mn and SERVPRO of St. 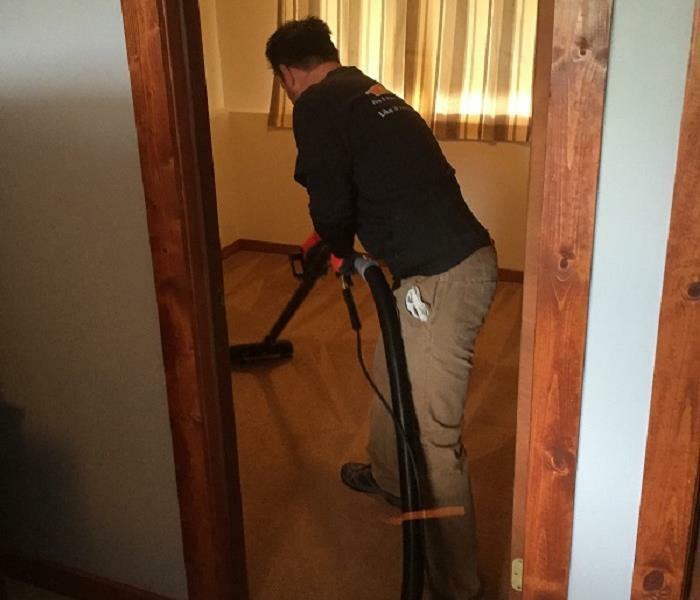 Cloud works with the apartment managers to clean the carpets so they are able to move the new tenant in quickly. We understand that the end of the month is busy and work hard with apartment managers to meet their deadlines and schedules. If your apartment or business needs to have the carpets cleaned, please contact SERVPRO of St. Cloud for all your needs! SERVPRO of St. Cloud cleaning water damage! 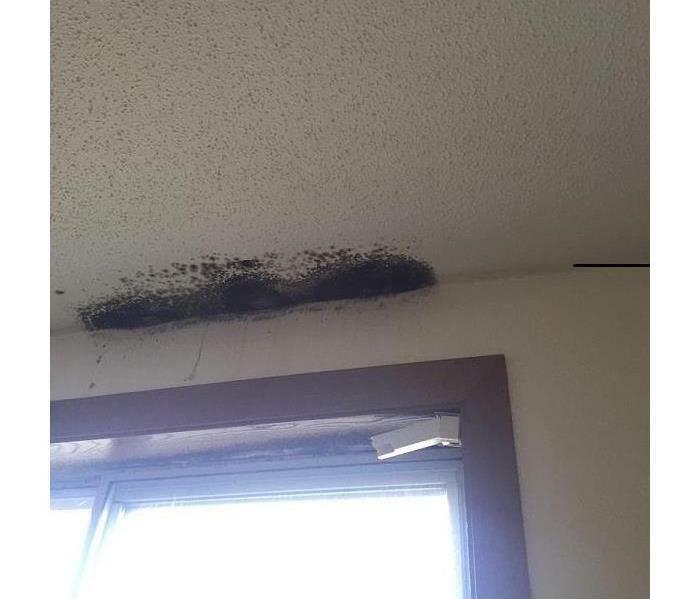 This home in Foley, Mn had water damage after a leak from the bathroom. They contacted SERVPRO of St. Cloud who started to dry out the materials immediately. The homeowners were pleased with the drying out process in spite of the inconvenience a water loss was to them. Should you suffer any water damage, it is our goal to keep you in informed of the process and to treat your home with utmost care. Should you suffer any water, fire, or mold damage, please contact us at (320) 248-5400. We are available 24 hours a day/7 days a week! Mold shown on ceiling in bedroom. Call SERVPRO of St. Cloud for cleanup! This home in central Mn suffered fire damage in the garage. SERVPRO of St. Cloud responded and was able to clean the garage along with the home. Strong odor was present; however, after cleaning the home owner was amazed how clean it smelled! Should you suffer fire damage, please call SERVPRO of St. Cloud at (320) 248-5400. We are open 24 hours 7 day a week! SERVPRO of St. Cloud providing cleanup to local business! This St. 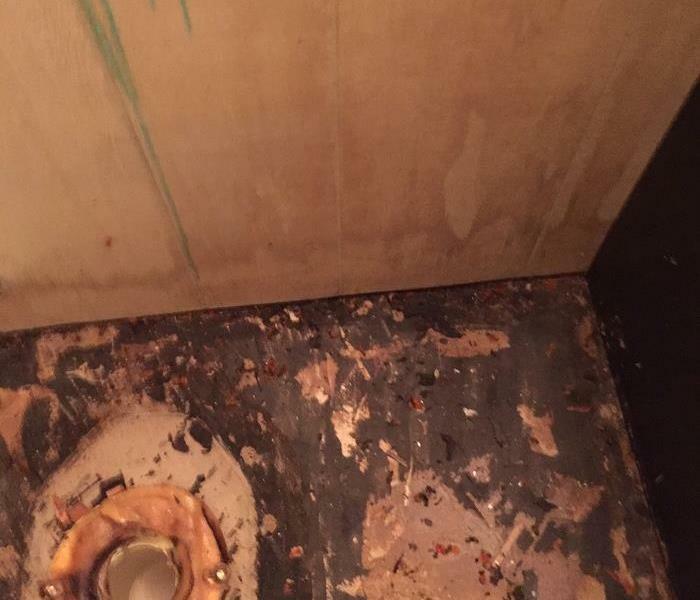 Cloud, Mn business suffered damage after a urinal leaked in the bathroom over a weekend. 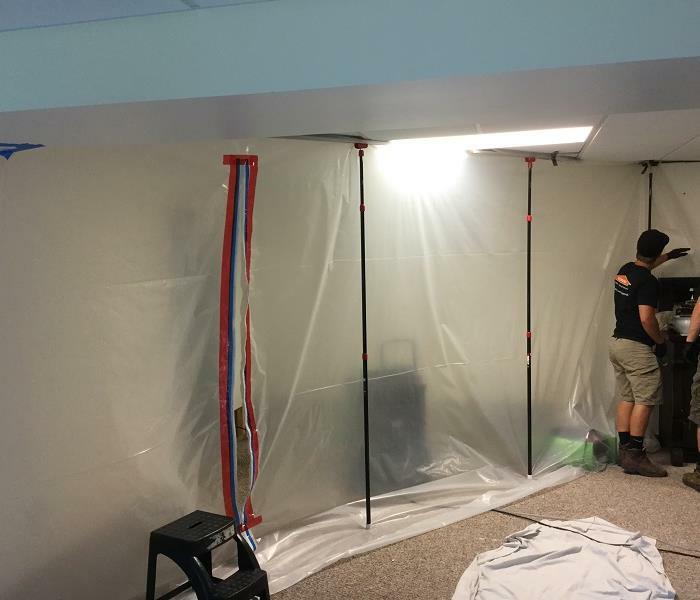 As the company wanted minimal disruption to their employees and work space, SERVPRO of St. Cloud dried out the materials and will provide the rebuild construction work. To work best with our clients, we will work after hours on repairs needed so the business is not as affected. Should your business suffer water damage, mold damage, or in need of fire cleanup, please contact SERVPRO of St. Cloud at (320) 248-5400. SERVPRO of St. Cloud cleans up storm damage! Spring is officially here and with that comes storms! A recent tornado hit Zimmerman, Mn and SERVPRO of St. Cloud responded to the damage. This home suffered damage after trees feel on the house and garage. Should you have storm or water damage, please contact SERVPRO of St. Cloud at (320) 248-5400. Mold found in wall cavity. Call SERVPRO of St. Cloud to help! During remodeling, a homeowner in St. Cloud, Mn suspected mold in their home. They contacted SERVPRO of St. Cloud who did testing and found the source of mold. Look for upcoming before and after photos of this project. The homeowners were pleased with the work, cleanliness of the repairs, and knowledge with mold and construction repairs. Should you suspect mold in your home or business, please contact SERVPRO of St. Cloud for all your needs at (320) 248-5400. We are open 24 hours and always here to help! Electrical fire causes damage to restaurant! This restaurant suffered an electrical fire in the kitchen. The local fire department responded and in the process of extinguishing the fire, there was water damage and residue from the extinguisher throughout the restaurant. Look for before and after photos on our website at a later date once cleanup has been completed. Should your business suffer a fire loss, please contact SERVPRO of St. Cloud to help navigate you through this crisis. We are available 24/7 at (320) 248-5400. 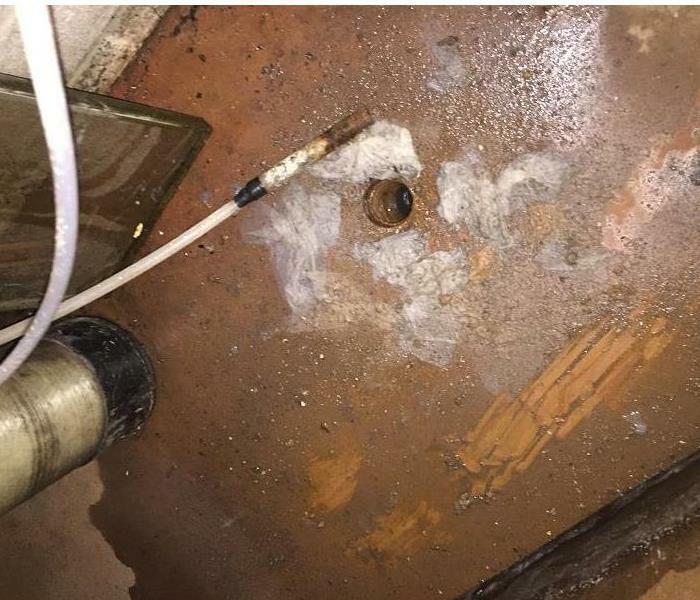 Toilet leak causes damage to bathroom below! This home in St. 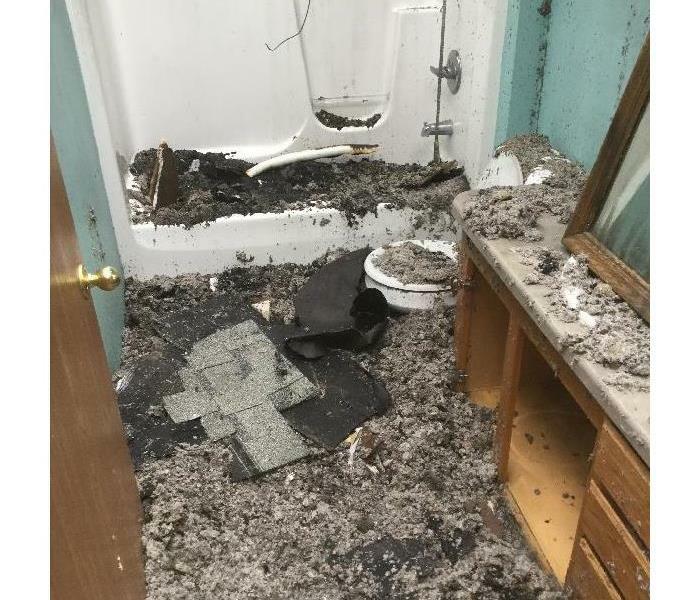 Cloud, Mn had damage when the homeowners came home to find the toilet upstairs leaking below. The upstairs bathroom had damage to the flooring and leaked to the ceiling below. SERVPRO of St. Cloud was able to assess the damage and dry out the materials. 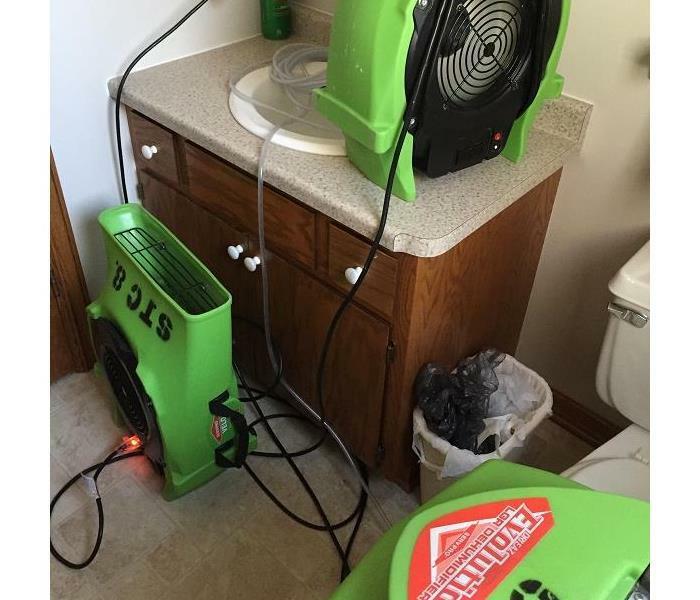 Here is a photo of our equipment set up to dry out their bathroom. Should you need repairs if you have water damage as a result of a broken pipe, leaky faucet or toilet, please contact SERVPRO of St. Cloud at (320) 248-5400. We are here to help 24/7! Drying equipment set up to dry out a ceiling. This home in Sartell, Mn suffered water damage after a toilet leaked causing water damage to the lower level ceiling. SERVPRO of St. Cloud responded to the emergency call and was able to dry out the home as quickly as possible. Should your home or business suffer water damage, please contact us at (320) 248-5400. We are open 24/7 and always here to help! Mold damage in need of cleanup! At first glance, this may look like polka dotted walls. No, it's not! It is mold throughout the bathroom after a pipe burst and ran for several days causing enormous amount of damage to the entire lower level. 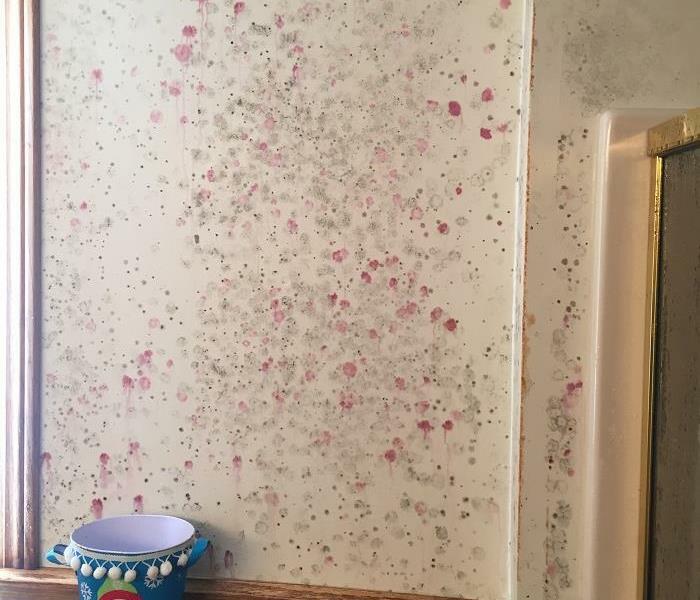 This wall shows mold that needs to be removed. If you suspect mold in your house or business that needs to be addressed, please contact our office at (320) 248-5400. Winter storms are coming...A frozen house causes damages! 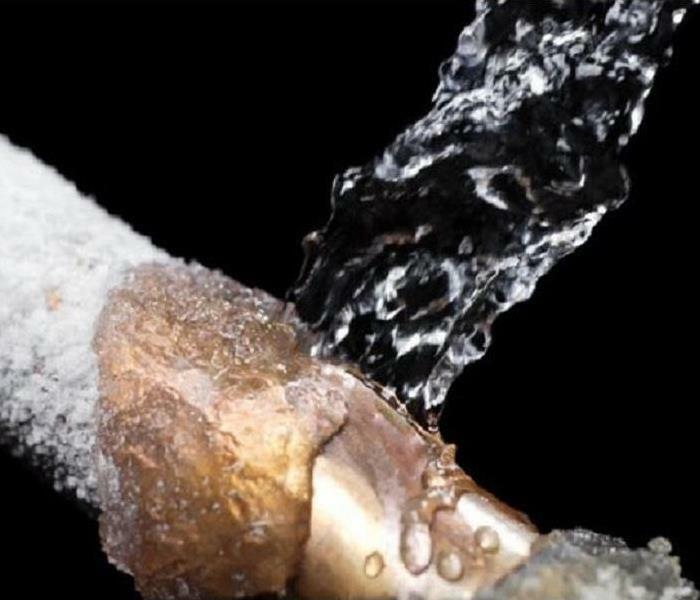 With the recent freezing temperatures, pipes can freeze causing havoc throughout. When water in a pipe freezes, it expands and puts tremendous pressure on both metal and plastic pipes. If the pipe breaks, it can easily release a torrent of water into the building. 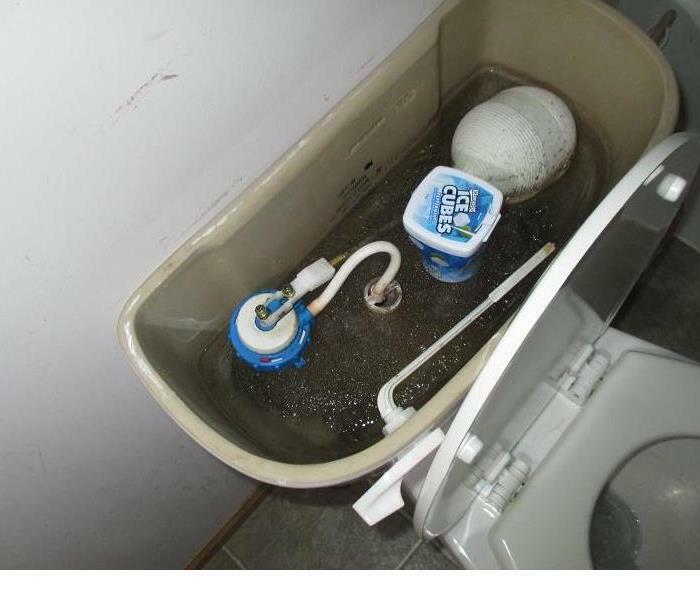 This home shows that the water in the toilet tank froze as the plastic storage of gum sitting on the ice instead of floating in the water. Should you suffer frozen pipes and need cleanup, please contact SERVPRO of St. Cloud at (320) 248-5400. Got mold? SERVPRO of St. Cloud is here to help! Do you have mold at your home or business? SERVPRO of St. Cloud can help repair your damages! 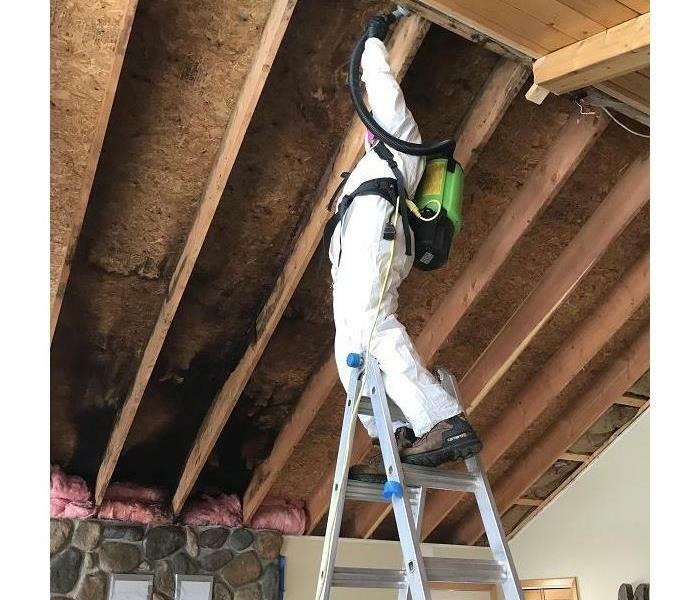 This cabin in Central Minnesota suffered mold after a shower pipe burst squirting water and went unnoticed for several weeks! The lower level was damaged from the ceiling, walls, and floors. Look for upcoming photos of before and after SERVPRO of St. Cloud came in to help! Should you need assistance from water, fire, or mold damage repairs, please contact our office at (320) 248-5400. We are always here to help you in your time of disaster! Frozen pipes cause water damage! With recent extreme cold temperatures, area businesses and homes suffer frozen pipes. When the temperature rises, pipes burst and cause water damage. This home in St. 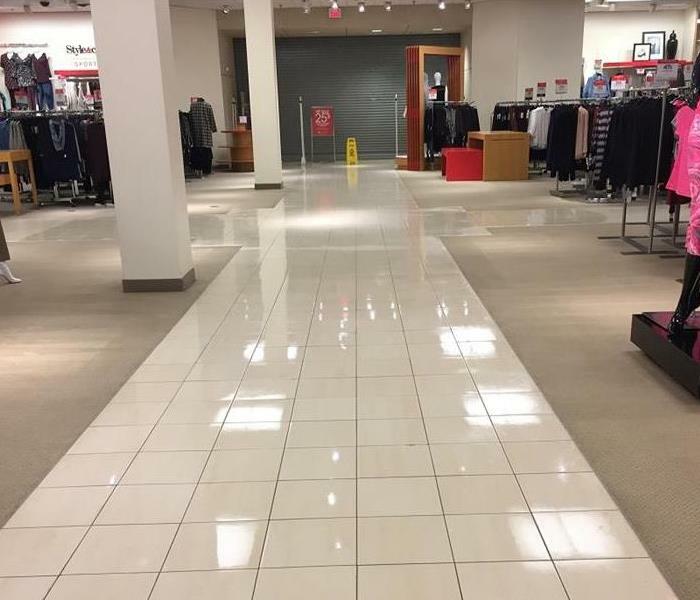 Cloud, Mn had water damage to the lower level. SERVPRO of St. Cloud was able to make the necessary repairs by drying out the materials. Should you suffer any storm damage from frozen pipes, please contact SERVPRO of St. Cloud at (320) 248-5400. We are always here to help! 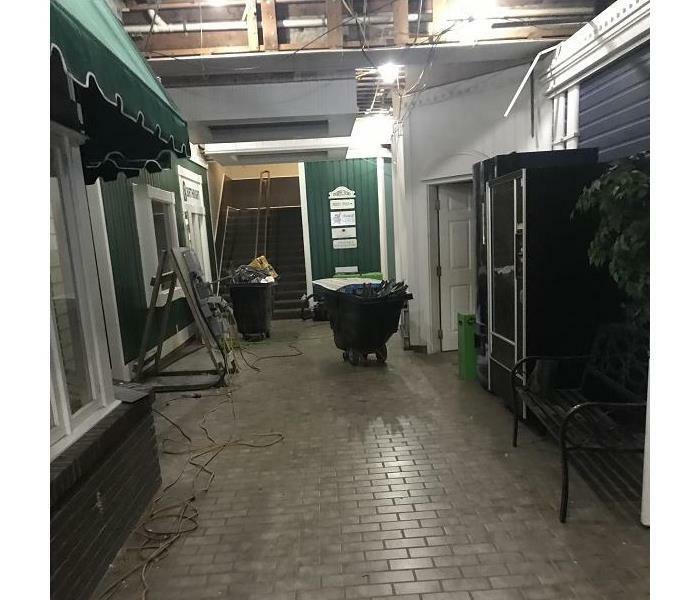 Local small business suffers water loss and SERVPRO of St. Cloud helps! 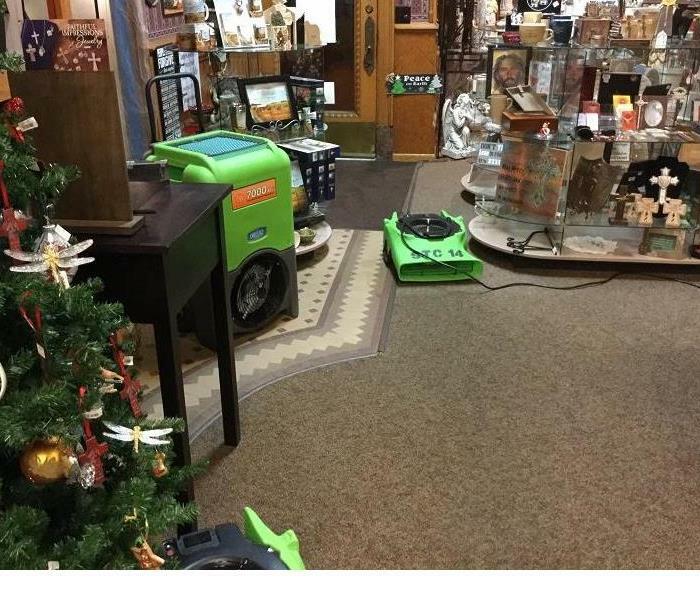 This local gift shop in Central Minnesota suffered water damage after a pipe leaked. The owners contacted SERVPRO of St. Cloud to dry out the building but was concerned to have the repairs done so their business would be minimally affected. We began the mitigation process after hours and the insured was pleased with how quickly we were able to dry things out. Should your business suffer a water loss from frozen pipes or a leak, please contact our office at (320) 248-5400. We are open 7 days a week 24 hours a day to best help you in time of need! Storms cause water damage in Central Minnesota! Storms can cause all sorts of damage. It can range from hail damage to roofs, water damage to basement, or cold snaps that cause frozen pipes. Whatever the damage that your business or home may suffer, SERVPRO of St. Cloud is here to help you in your time of need! We are open 24 hours a day/7 days a week. Please contact us at (320) 248-5400 for professional, quick response, and most importantly- quality service! Mold cleanup in St. Joseph, Mn. 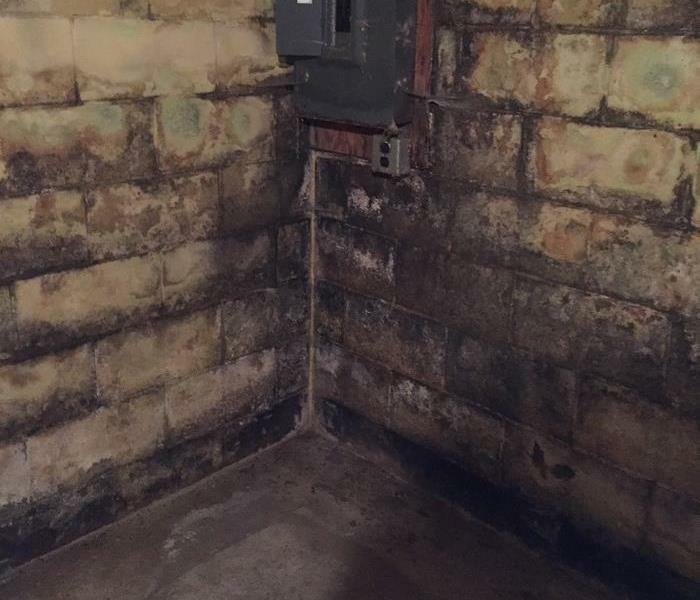 This home had mold present on the walls throughout the basement. The homeowner had health concerns and contacted SERVPRO of St. 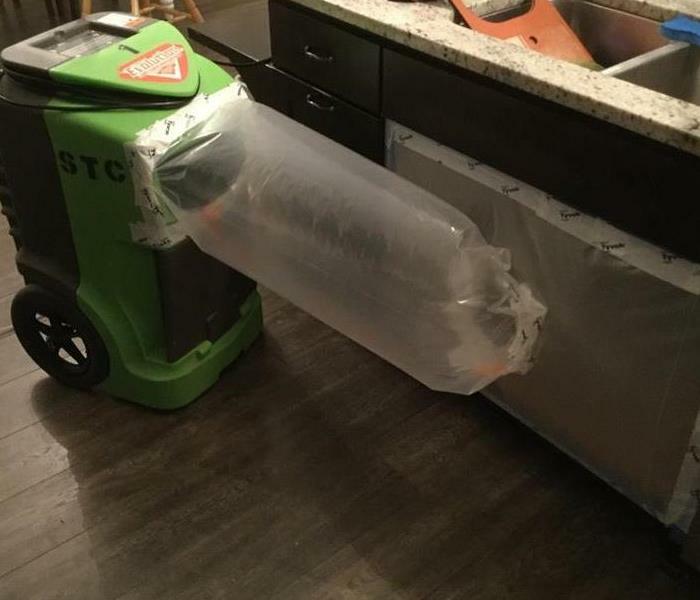 Cloud to remove the mold. Mold may be detrimental to your health and important to remove from your house. Look for upcoming before and after photos of the cleanup. Should you house or business have mold present, please contact SERVPRO of St. Cloud at (320) 248-5400 for all your cleanup needs! SERVPRO of St. Cloud cleans businesses! SERVPRO of St. Cloud offers a wide variety of services. Although we highly recognized as an emergency water and fire restoration company, we also perform cleaning services at local businesses. 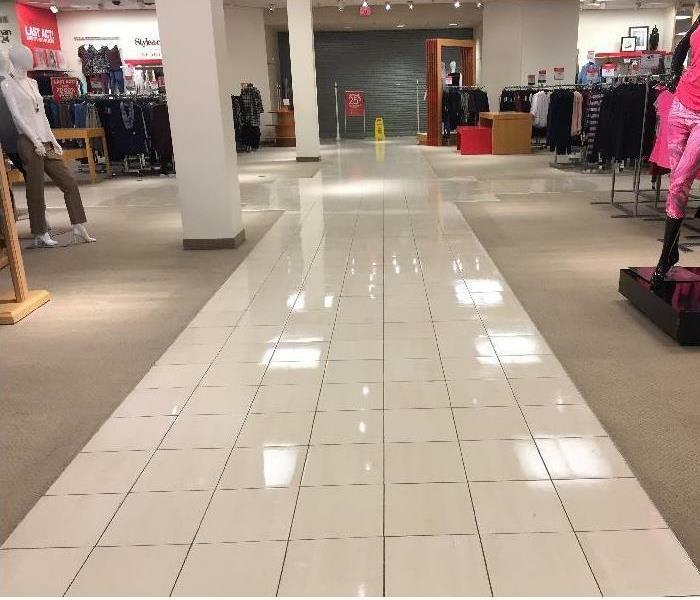 This store in the mall needed to be cleaned. Should your business need to be cleaned on a regular basis or need carpets cleaned at the present time, please contact SERVPRO of St. Cloud at (320) 248-5400. Storm cleanup in Central Minnesota! 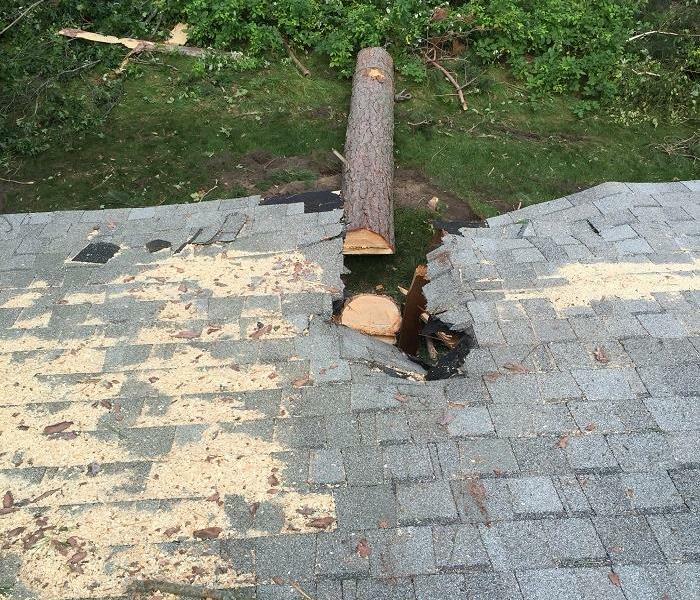 This home in Central Minnesota suffered damage after a strong violent storm causing damage to the roof. This storm resulted with a hole in the roof as a tree punctured through the shingles and plywood. SERVPRO of St. Cloud provided emergency services to the home owner. This church basement in Central Minnesota flooded after a heavy rain. SERVPRO of St. Cloud was contacted through their insurance company to dry out the materials that were affected. 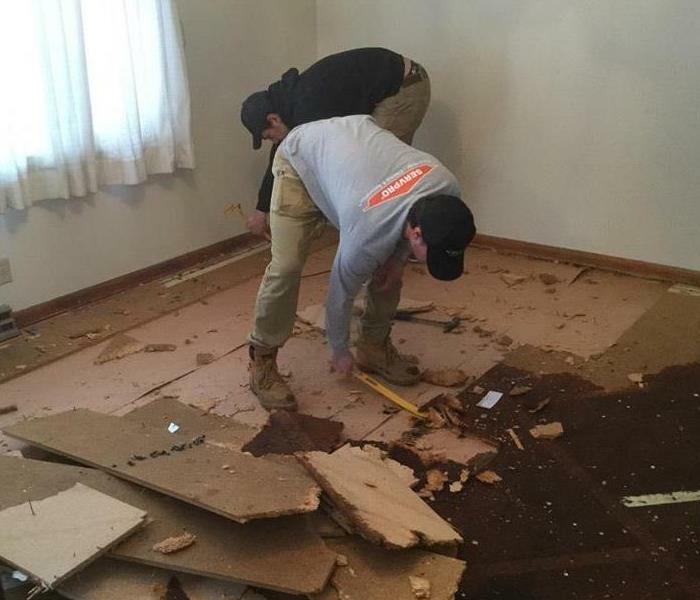 The flooring and walls were damaged and a portion needed to be replaced. 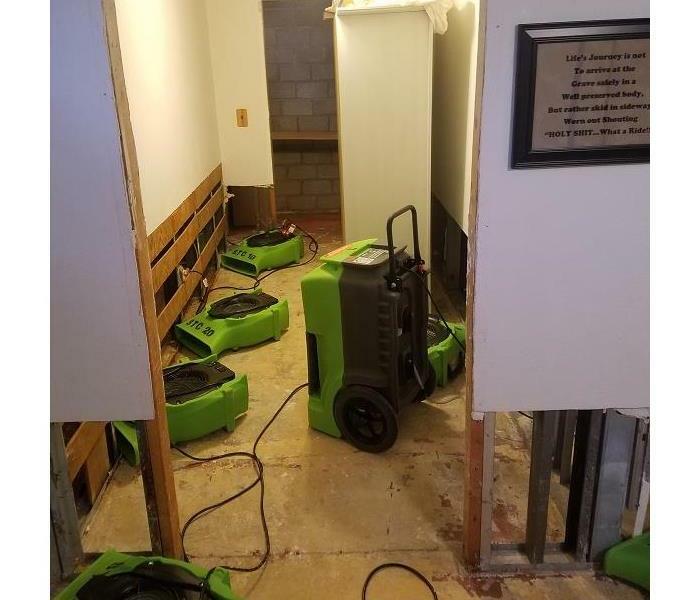 Should your church or business suffer water damage, please contact SERVPRO of St. Cloud at (320) 248-5400 for all your needs. Damage to basement walls as the wood was rotting and concrete discoloring. Teaming with the Red Cross and Rice Fire Department installing smoke detectors to keep our community safe! Installing smoke detectors with the American Red Cross and the Rice Fire Department to keep our community safe! Extracting water from a carpeted area in the living room due to a leak in the kitchen. 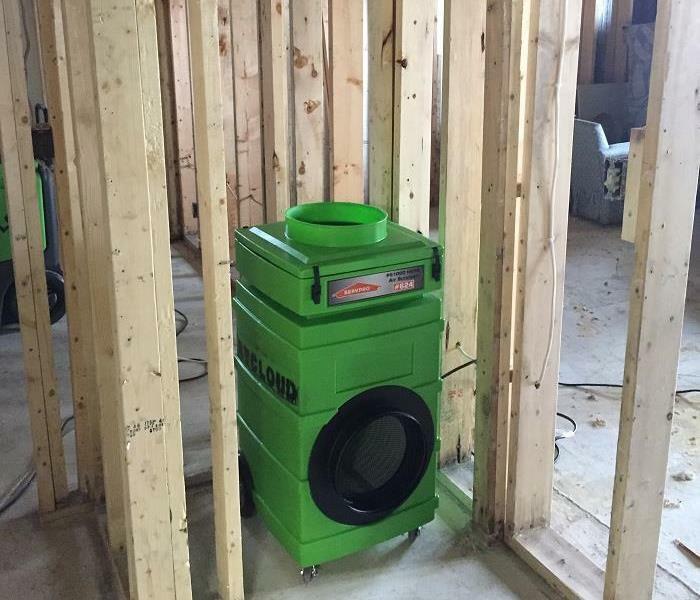 No one wants to have fire or water damage in your home or business; however, SERVPRO of St. Cloud will be there to meet your needs at any time. We are available 24 hours and day- 7 days a week. We will respond faster to any disaster so it truly is "live it never even happened!" 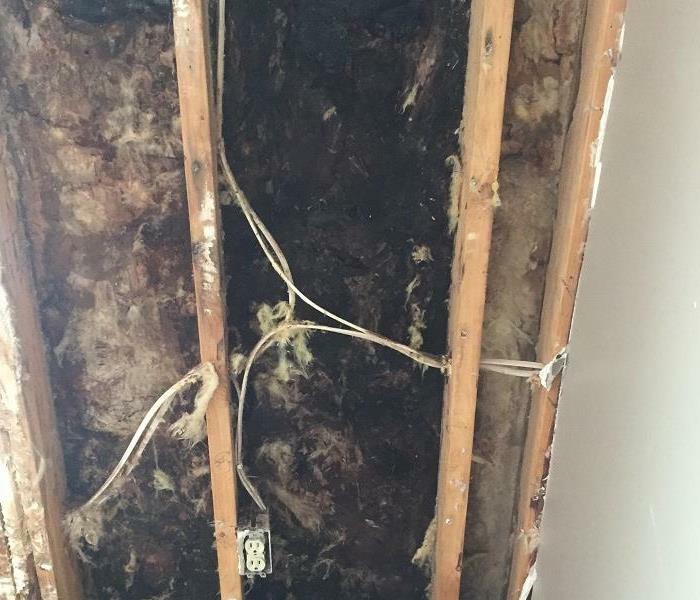 Mold and rotten material from water damage- Mold remediation in St. Cloud Mn. Leaking windows for years caused the wood to rot and mold under the brick exterior. SERVPRO of St. Cloud is proud to be an active member of the St. Cloud Area Chamber of Commerce. We will provide water and mitigation services to the St. Cloud area businesses and residents. This is a containment area that was created to dry out the walls in a living room in St. Cloud, MN. This water damage was dried in a matter of days. The homeowners were pleased with the professionalism and quality of work! This fire occurred during construction while remodeling. Soot was found throughout the house and in between all knotty pine grooves on wall and ceiling. SERVPRO of St. Cloud will be able to remove the odor and soot from the fire damage so the home owners can continue with their remodeling job. Remodeling along with fire damage can be stressful. Our goal is always to put the customer first and reducing the amount of stress by easing the process as much as possible. This homeowner suffered water damage in Benton County in Mn. SERVPRO of St. Cloud responded to this water loss and dried out all materials. 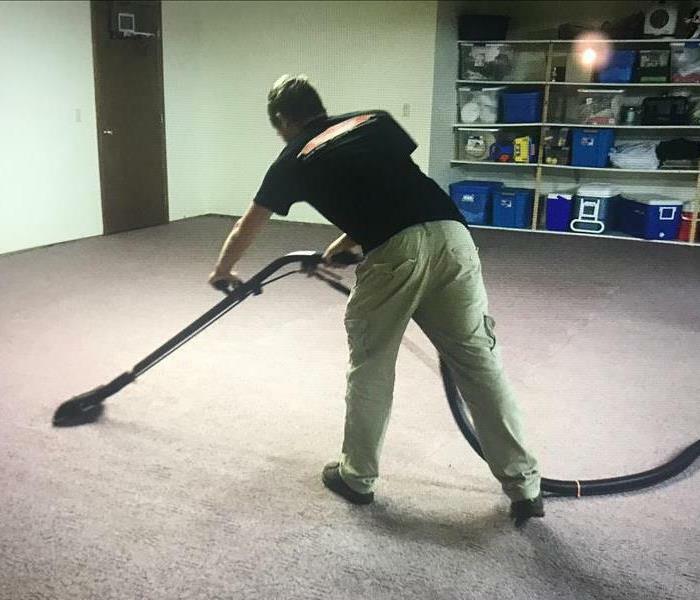 The final touch was to clean the carpets. The homeowners were truly happy with the work that was done and how fast it took! This St. 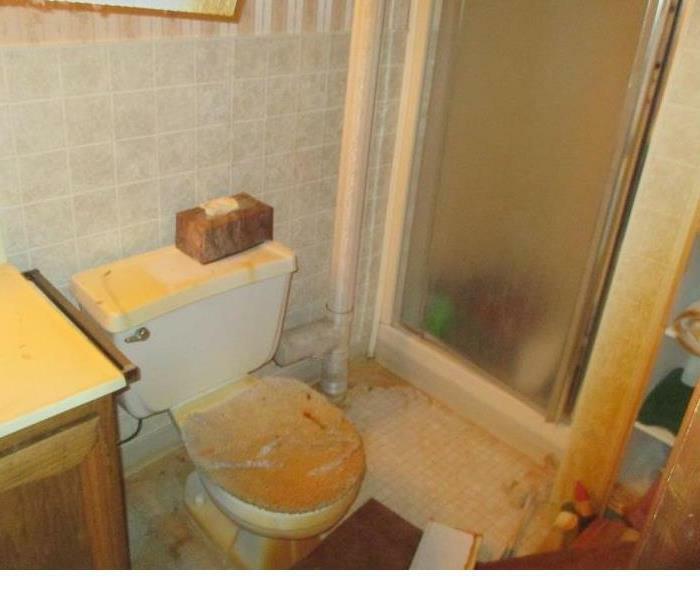 Cloud, Mn homeowner had a toilet overflowed that damaged a portion of the lower level. SERVPRO of St. Cloud provided emergency services and repaired all of the damage. The homeowners were quite pleased! 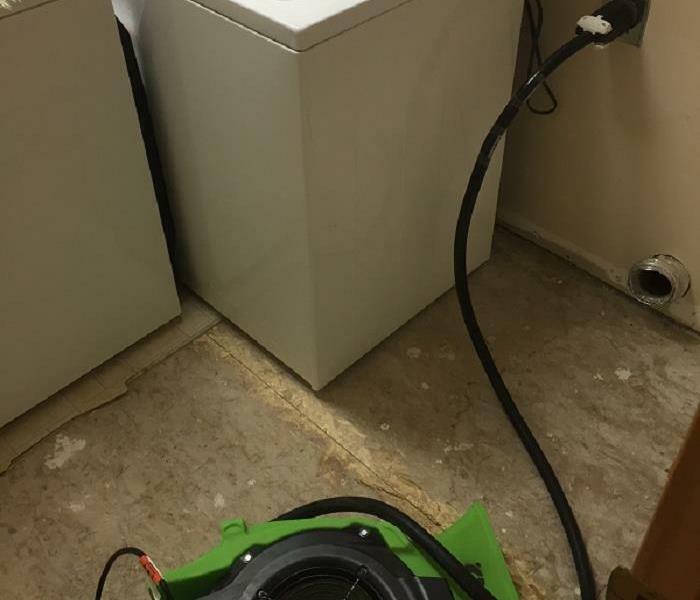 Water damage repairs from a toilet overflow! SERVPRO of St. Cloud is drying out all of the materials in a basement in St. Cloud, Mn from a toilet overflow. Let the professionals clean it up your water damage so you have peace of mind! 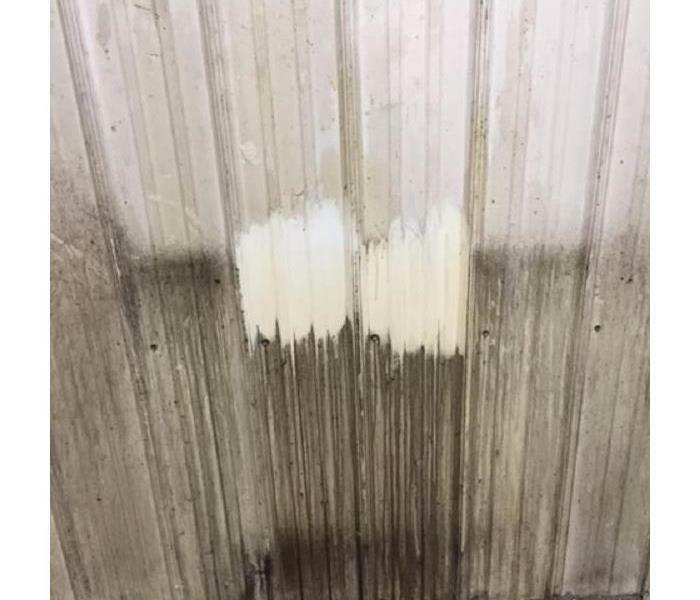 Water damage from a leak in a roof at a commercial building. These ceiling tiles showed water staining and SERVPRO of St. Cloud was able to make the repairs. 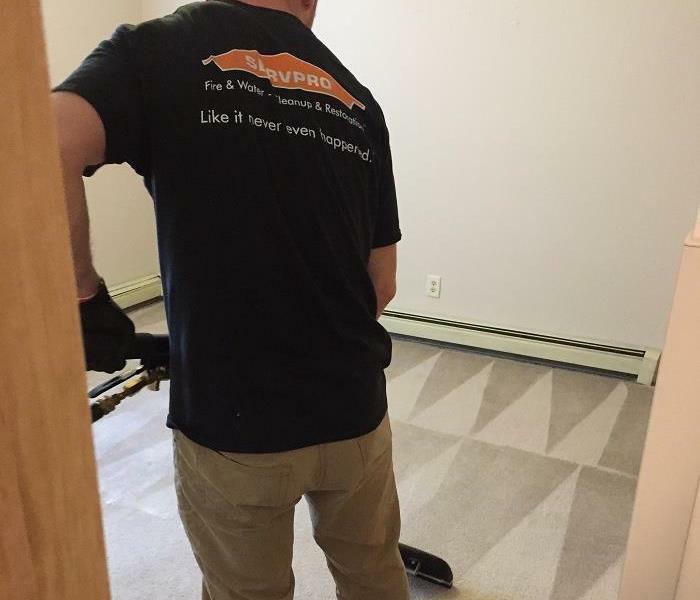 The company was happy with the work and SERVPRO of St. Cloud worked around their business hours to make repairs. 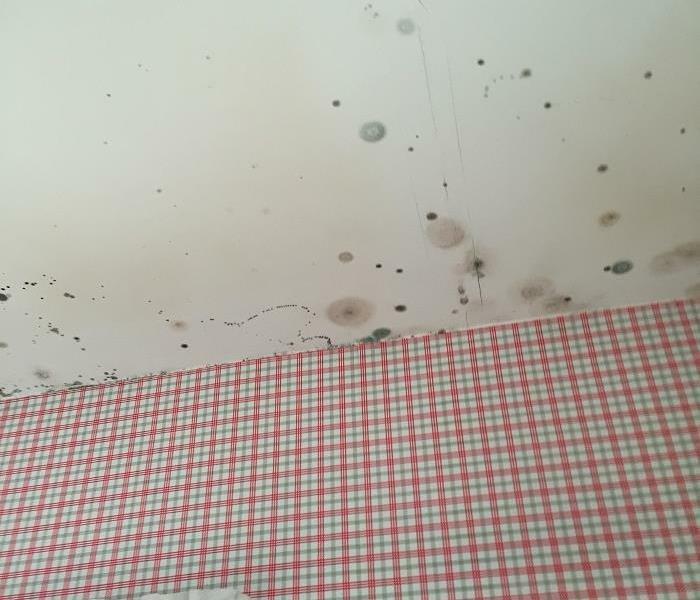 Water damage from a laundry room disaster! SERVPRO of St. Cloud responded to water damage from a leak in the laundry room. 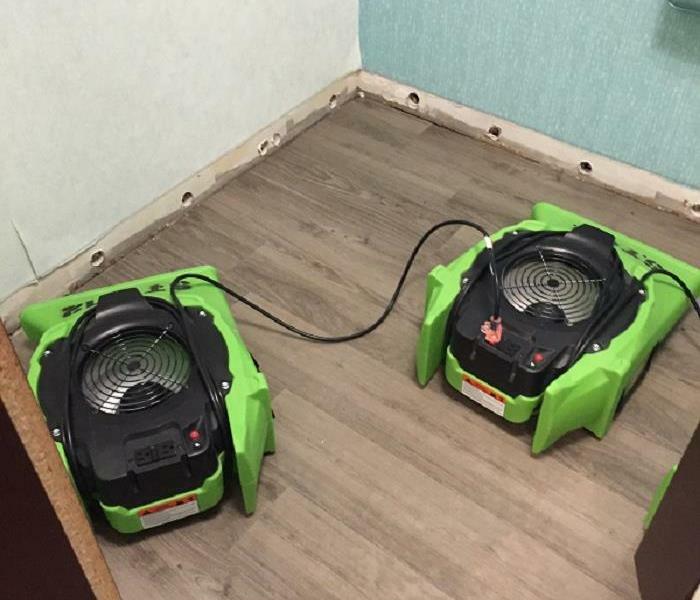 The vinyl flooring was removed and fans set up to dry out materials. The home owners were happy with the response time and quality of work that occurred! 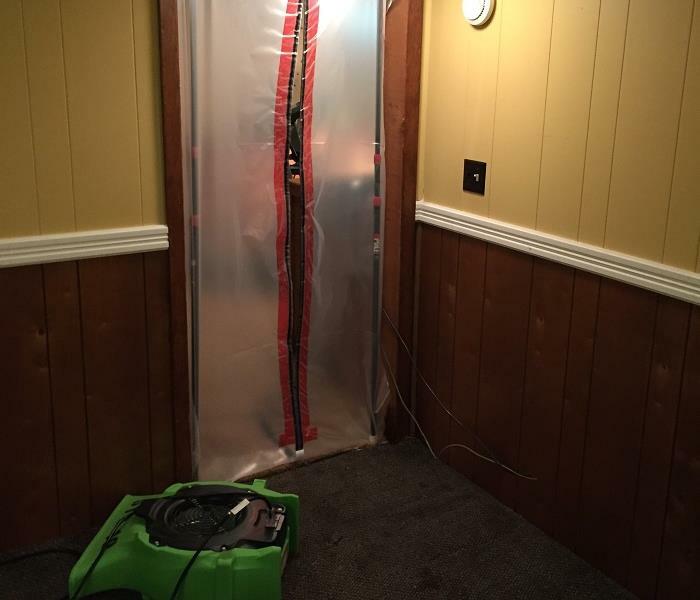 Pipe bursting causing water damage! This home in St. 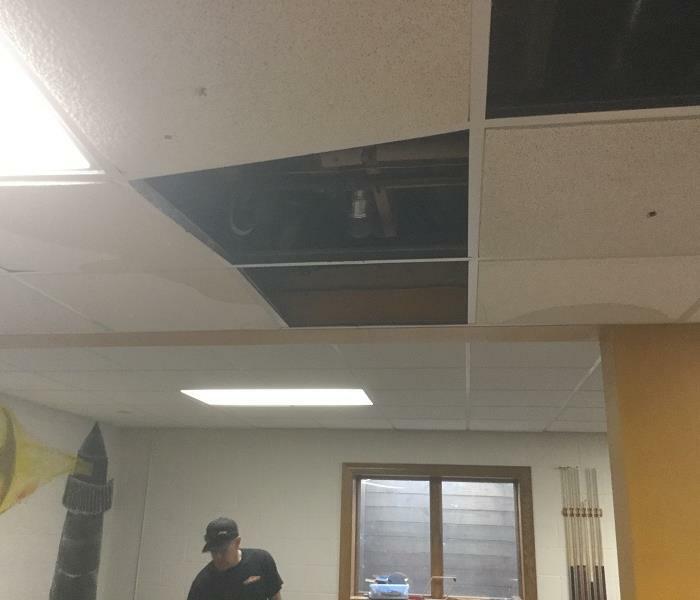 Cloud, Mn suffered water damage as a result of a pipe bursting inside of the wall. Water damaged the flooring, walls, and beautiful wainscoting. SERVPRO of St. Cloud responded after business hours to provide restoration services. The homeowners were pleased with the workmanship and how clean and professional the crew was! Toilet leak caused water damage throughout! SERVPRO of St. Cloud was contacted by an insurance agent to repair damages to a home in Sauk Rapids, Mn. The toilet leaked causing water damage throughout the house. We dried out the house and the home owners were happy how fast their house came back together! SERVPRO of St. Cloud and the CMBA Home Show was a success! Thank you to everyone that stopped by our booth at the CMBA Home Show this past week! We enjoyed our time talking about all the services that SERVPRO of St. Cloud offers including mold remediation, water damage repairs, and fire restoration! We look forward to a great spring season ahead! Cleaning up water damage doesn't have to be messy! This St. Cloud, Mn home suffered water damage throughout the main floor. The home owners were surprised how neat and tidy the clean-up process was. This photo shows the containment area that SERVPRO of St. Cloud constructs to dry out the damaged materials. The repairs were made quickly and the home owners were pleased! Laminate floor damaged from water pipe bursting under the sink. Look at the damaged laminate flooring that was cupping after water seeped beneath the wood. The homeowners returned home to find the pipe bursting under the kitchen sink and damaged the flooring throughout. SERVPRO of St. Cloud responded to this water disaster and dried out the remaining materials. The homeowners were pleased with the workmanship throughout. Carpet cleaning after repairs from water damage to a home in St. Cloud, Mn. This home in St. 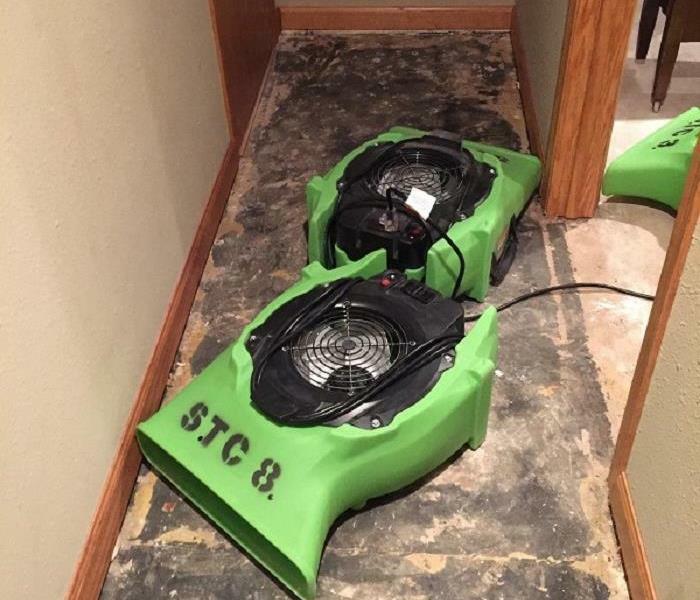 Cloud, Mn suffered water damage and SERVPRO of St. Cloud responded immediately! 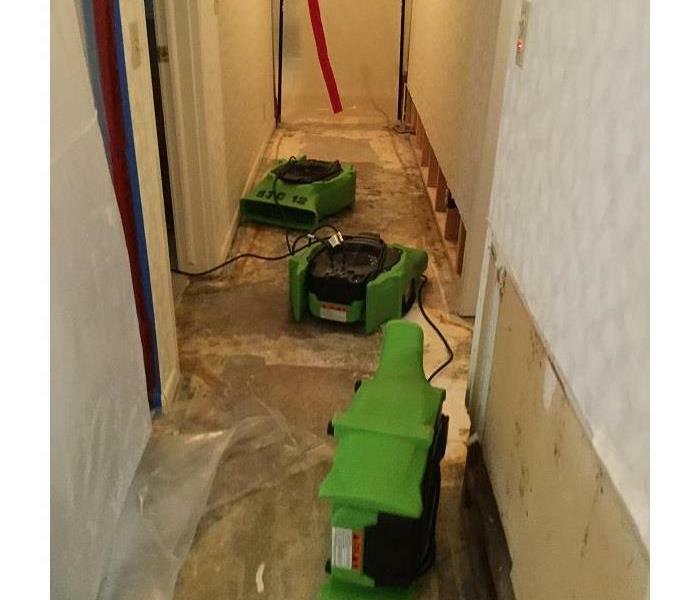 Once all repairs were made and all of the materials were dried out, SERVPRO of St. Cloud cleaned the carpets. The homeowners were amazed of how quickly the process was and how great the job looked once we were finished! 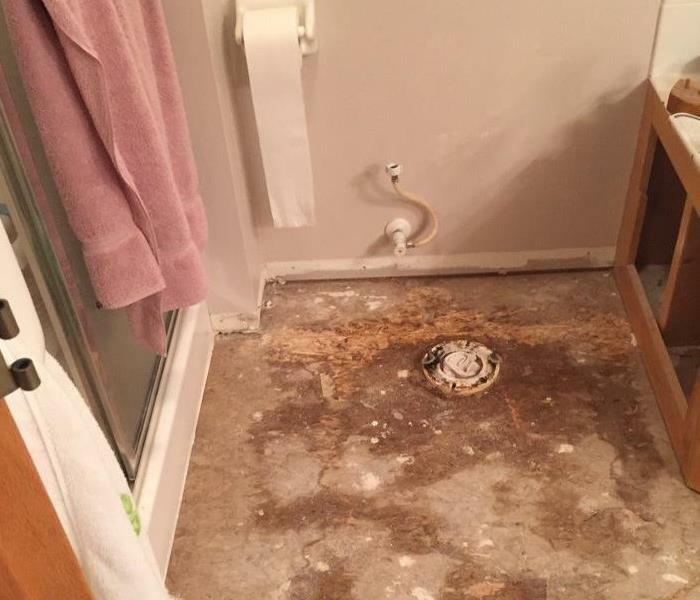 This home in Sartell, Mn suffered water damage to the flooring and walls in the bathroom. SERVPRO of St. Cloud responded to the damage and removed all damaged materials. The homeowners were pleased with the service! 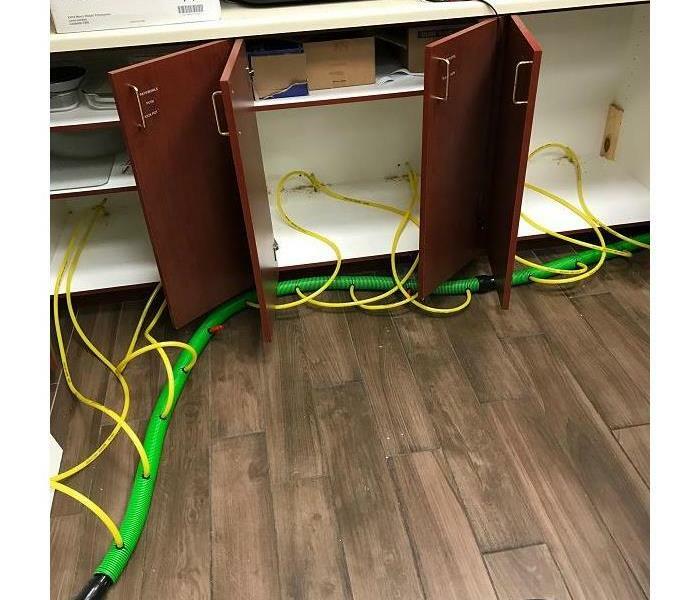 No disaster too large for SERVPRO! Large flooded commercial building? Great fire devastation to a church, retail mall, or government center? Any disaster that could occur in the St. 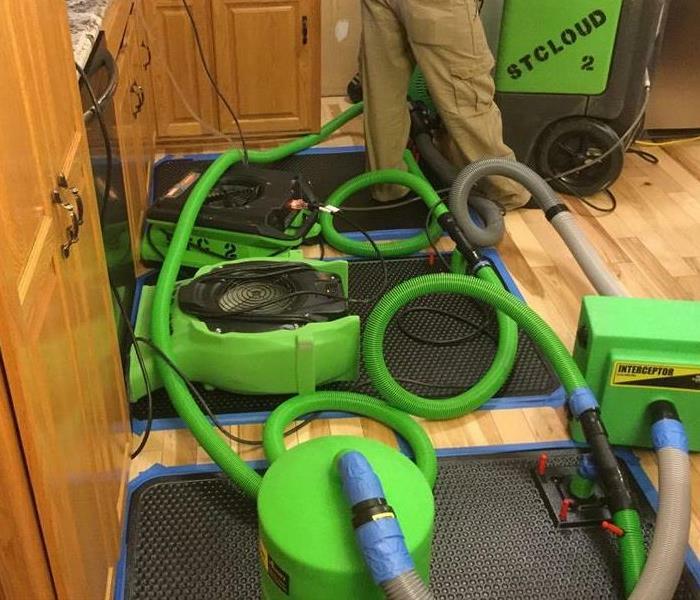 Cloud, Mn or surrounding area is not too large for SERVPRO. 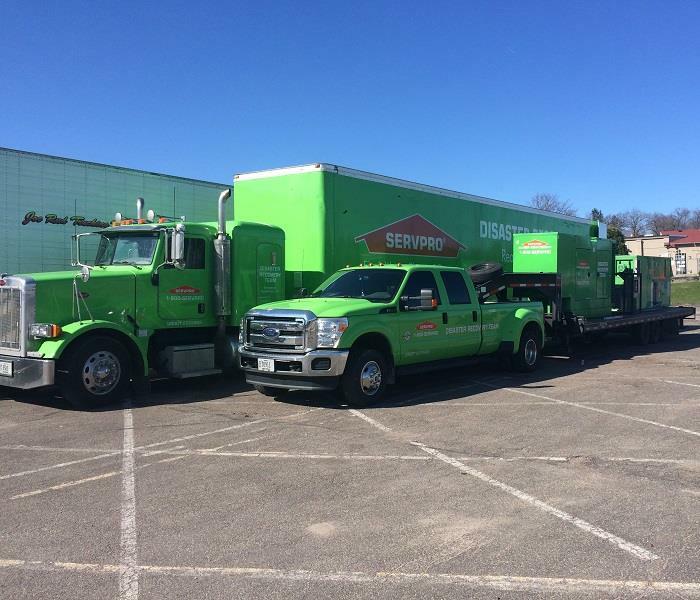 SERVPRO has a disaster recovery team that can respond efficiently to those in need! 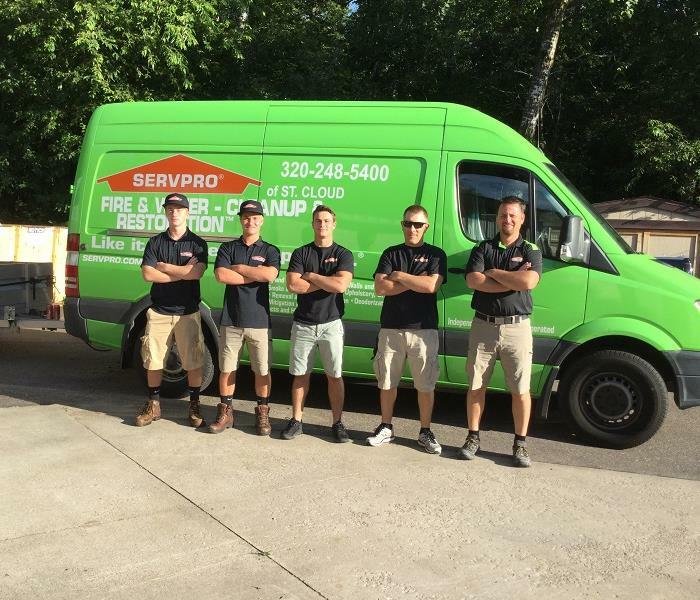 Call us today at (320) 248-5400 for SERVPRO of St. Cloud to help in any small or large disasters! Visible mold growth in house in Central Minnesota. SERVPRO of St. Cloud responded to a flooded basement after a pipe burst at a cabin. 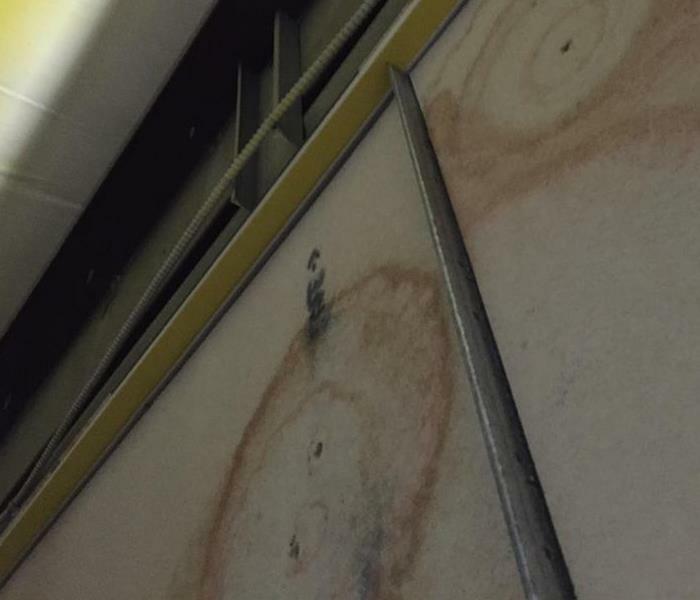 As it was not used over the winter months, it is unclear how long the water damage occurred. Visible mold was seen in the upstairs of the home. SERVPRO of St. Cloud is in the process of making the necessary repairs. Check back later to see before and after pictures once the job is complete! Water damage that ran down the stairway. This home in Foley, Mn suffered water damage which ran down into the lower level. SERVPRO of St. Cloud responded to their needs and was able to work with their insurance company. Should you suffer from a flooded basement or any water damage, please call our office at (320) 248-5400. 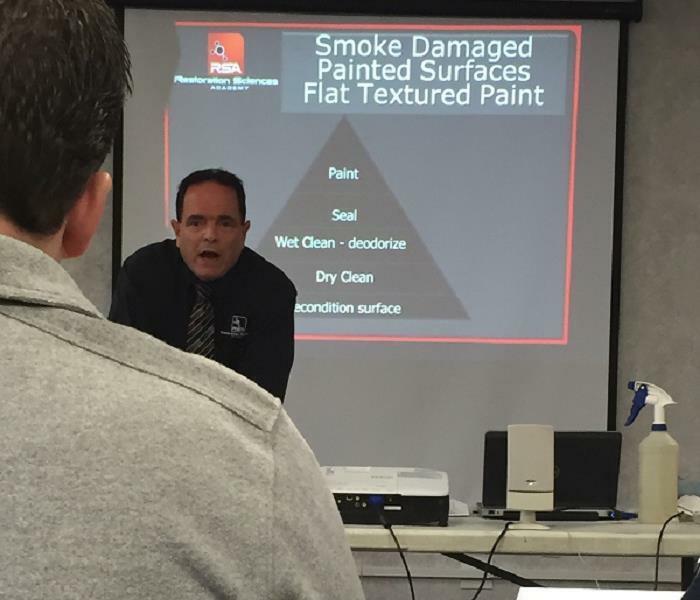 Participating in continuing ed classes to gain more knowledge regarding fire damage repairs. SERVPRO of St. Cloud continues to strive to further our knowledge in all areas of fire and water damage. We believe that our best work comes from furthering our education and learning all aspects of mold repairs, fire damage, and water restoration. The more we know, the more satisfied customers we will have. Customer satisfaction is our top priority! Flooded basement? We are ready to help! This home in St. Cloud, Mn 56301 suffered a flooded basement. The insured contacted their insurance company who contacted SERVPRO of St. Cloud. 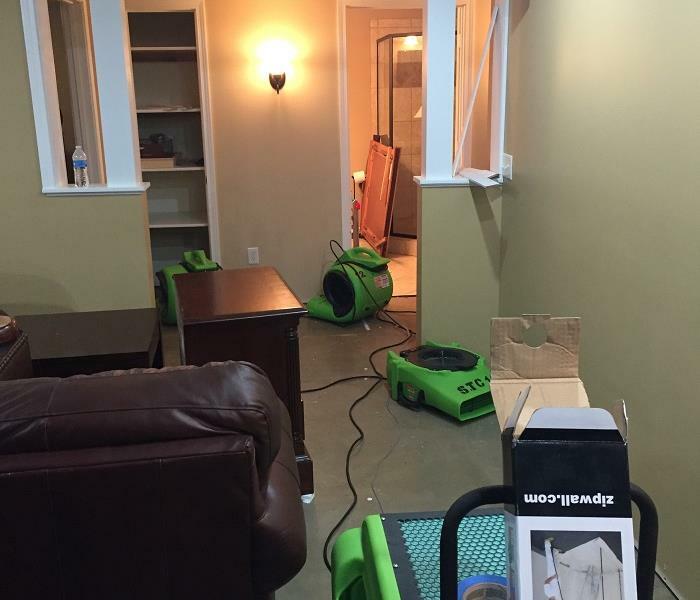 We have high grade equipment including dehumidifiers and air movers along with scientific technology to minimize any loss that you might have. Should you suffer from water damage or a flooded basement, please contact our office at (320) 248-5400. April showers can bring flowers.... and flooded basements! Although Spring in Central Minnesota is long anticipated, the spring showers can cause disaster to your home. This home in St. Cloud, Mn suffered water damage throughout. SERVPRO of St. Cloud was contacted after the house had water standing for a long period of time. Should you have any water damage to your home, please call SERVPRO of St. Cloud to help dry out the materials at (320) 248-5400. SERVPRO of St. Cloud can eliminate odors caused by a fire. Smoke and soot can travel and penetrate into the materials of a home. 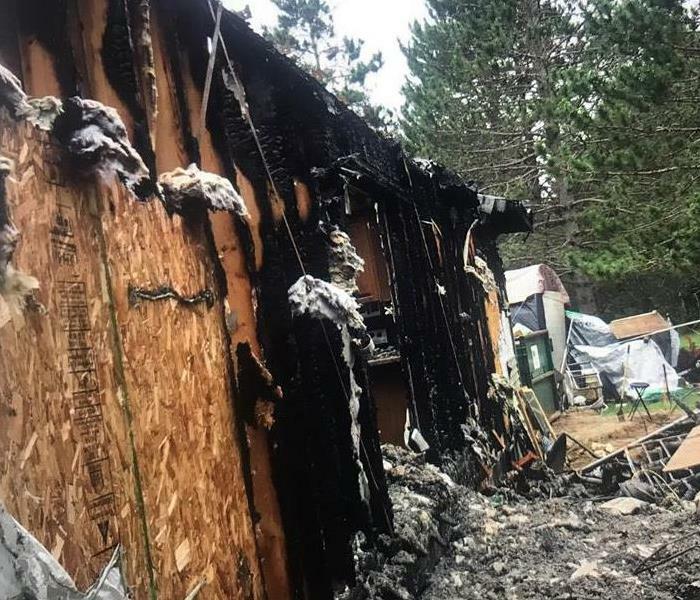 This home in Central Minnesota suffered fire damage with a strong fire odor. SERVPRO of St. Cloud is cleaning the materials and thermal fogging the home. Should you suffer a fire loss, please call SERVPRO of St. Cloud at (320) 248-5400 for further assistance. 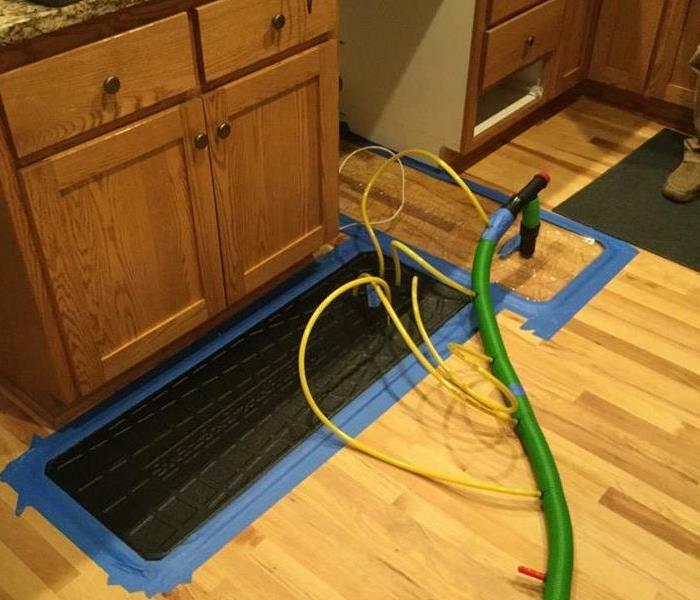 This home in Sartell, Mn suffered water damage throughout the entire level. SERVPRO of St. Cloud extracted the water and dried out the materials. The homeowners were appreciative of how fast the work was completed. Should you have any water damage or a flooded basement, contact our office at (320) 248-5400.
Business in St. Cloud, Mn suffered water damage. This commercial building in St. Cloud, Mn suffered water damage. SERVPRO of St. Cloud removed all of the damaged materials and set up air movers and dehumidifiers to dry out the building. The business was able to make all of the necessary repairs in the fastest manner so they could open for business as soon as possible. Should your business suffer water damage, call SERVPRO of St. Cloud at (320) 248-5400 for all your commercial needs! SERVPRO of St. Cloud is in the process of working with a homeowner in regards to mold in their house. Look for before and after photos to be posted shortly. Should you have mold in your house, SERVPRO of St. Cloud can have air quality testing done to protect you and your family. Call SERVPRO of St. Cloud for any of your mold concerns at (320) 248-5400. SERVPRO of St. Cloud drying your water damaged materials efficiently! 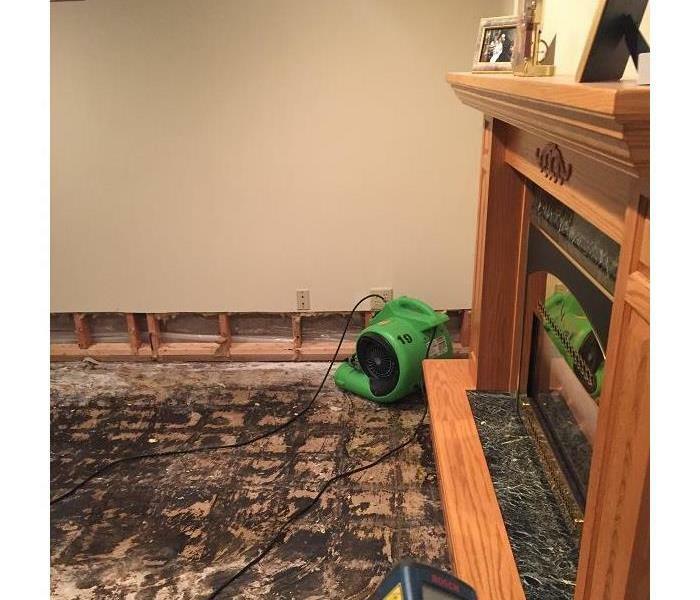 This home near Little Falls, Mn suffered water damage after the hot water heater leaked throughout the basement. SERVPRO of St. Cloud responded and was able to dry out the basement. Notice the containment area as the walls and carpet were able to be saved. The homeowners were pleased with the response time and service. 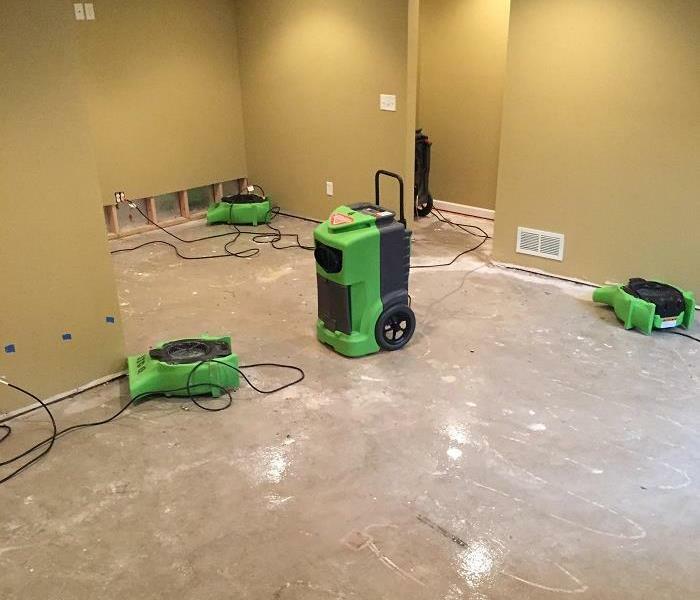 If you have a flooded basement or other water damage related issues, do not hesitate to call SERVPRO of St. Cloud at (320) 248-5400 for all your needs! 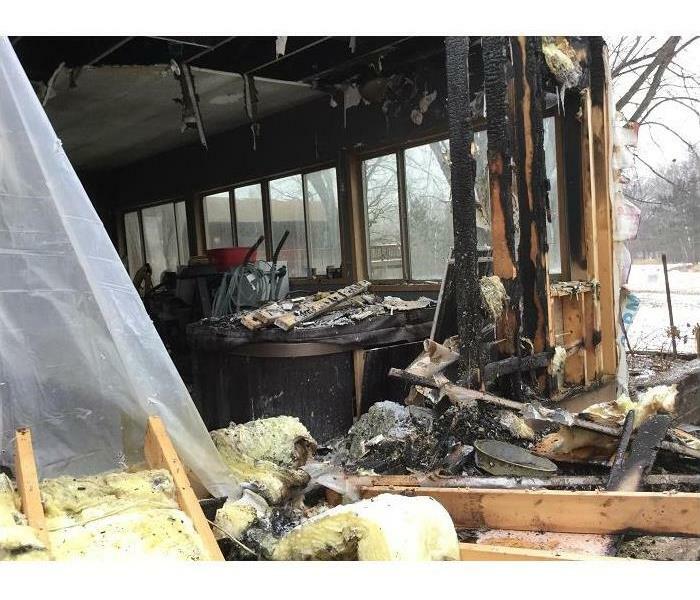 This was the aftermath of a kitchen fire in Sauk Rapids, Mn. SERVPRO of St. Cloud arrived on the scene and observed significant smoke and soot damage. SERVPRO of St. Cloud was able to wipe down the majority of the materials and remove the smoke odor. The customers were happy with the outcome and could not believe that you could not smell the smoke odor once completed. Should you have fire or water damage to your business or home, please call SERVPRO of St. Cloud for all your needs at (320) 339-3737. SERVPRO of St. Cloud cleans campers! A local camper dealership contacted SERVPRO of St. Cloud as there was a distinct odor in a camper. SERVPRO of St. 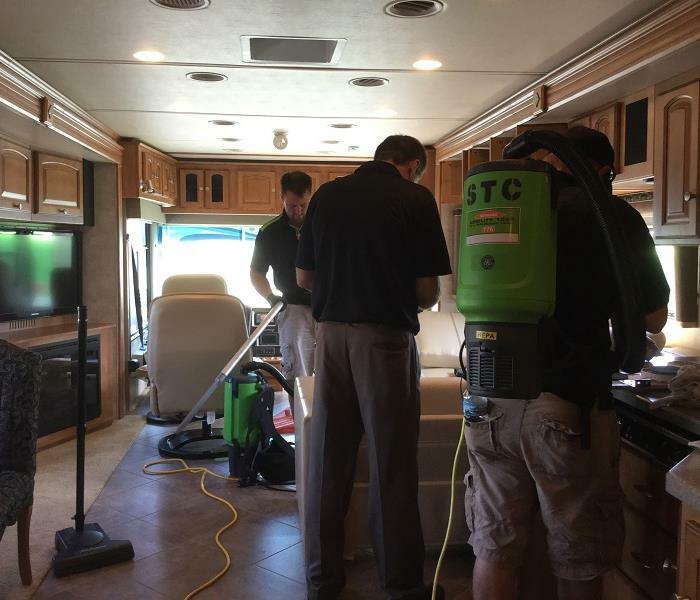 Cloud cleaned the camper and deodorized the vehicle for them. They were pleased with the results and eager to take their new camper on the road! Should you have any unusual cleaning requests, contact SERVPRO of St. Cloud at (320) 248-5400 for your needs! Water damage from a water heater leak! 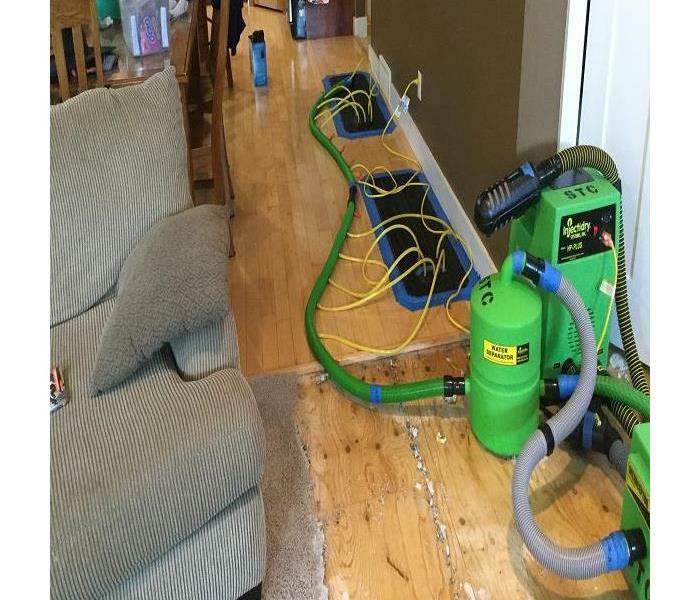 This home in Sauk Rapids, Mn suffered water damage after a water heater leaked. SERVPRO of St. Cloud was contacted to repair the damages. Due to our fast response time, SERVPRO of St. 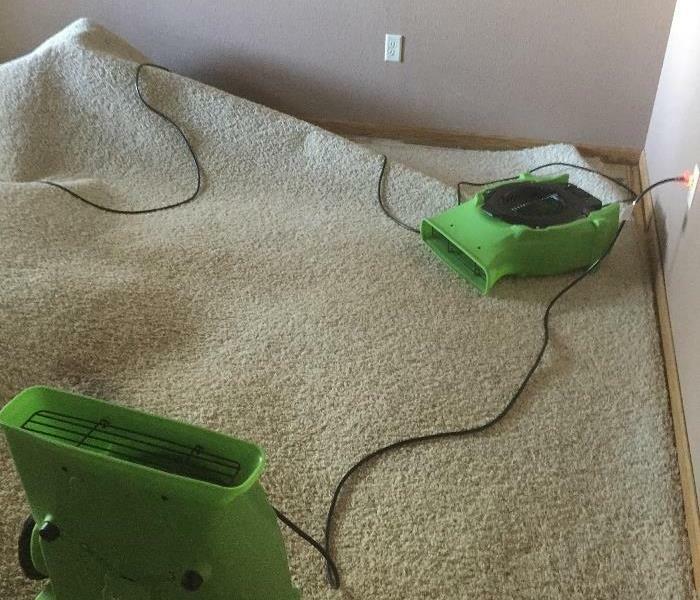 Cloud was able to lift the carpet and place air movers throughout so the damage was minimal. The homeowners were happy with the outcome! Should you suffer a flooded basement, broken pipe, or other water damage issue, please contact SERVPRO of St. Cloud at (320) 248-5400 for all your water repairs. SERVPRO of St. Cloud to the rescue! This basement in St. 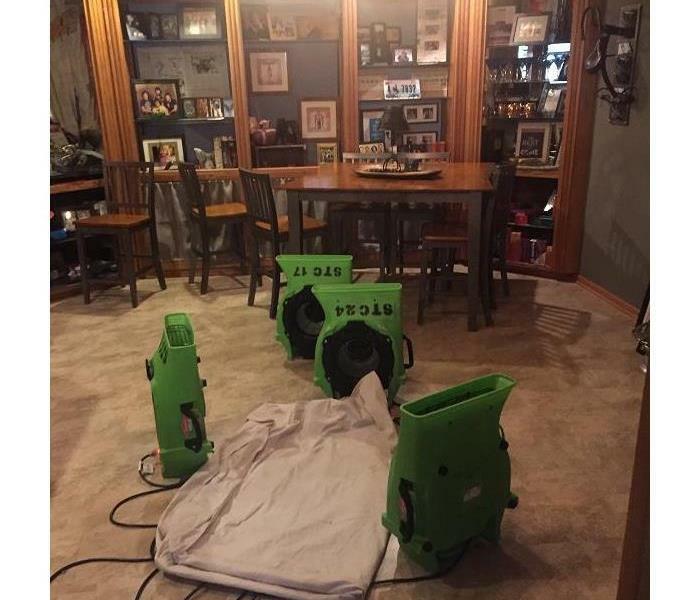 Cloud, Mn suffered water damage and the home owners called their insurance company who referred them to SERVPRO of St. Cloud. SERVPRO of St. Cloud responded to their disaster and removed the damaged materials. 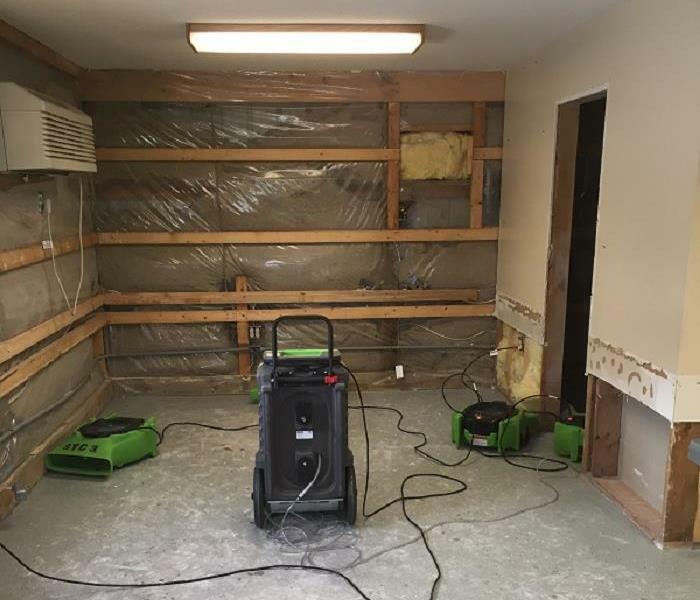 A portion of the drywall was removed and air movers were set up. The homeowners were impressed with the quality of work and friendliness of our staff. Should you suffer water damage, please contact SERVPRO of St. Cloud at (320) 248-5400. Laundry room leaked into a basement causing water damage throughout! This home in St. Cloud, Mn suffered water damage as the wash machine in the laundry room leaked throughout the main floor and below. The homeowners came home and found water damage to the ceiling below along with the carpet and pad. SERVPRO of St. Cloud was able to dry out the carpet and make their home back to normal in a short amount of time. Should you have a flooded basement or broken pipes, please call SERVPRO of St. Cloud at (320) 248-5400. 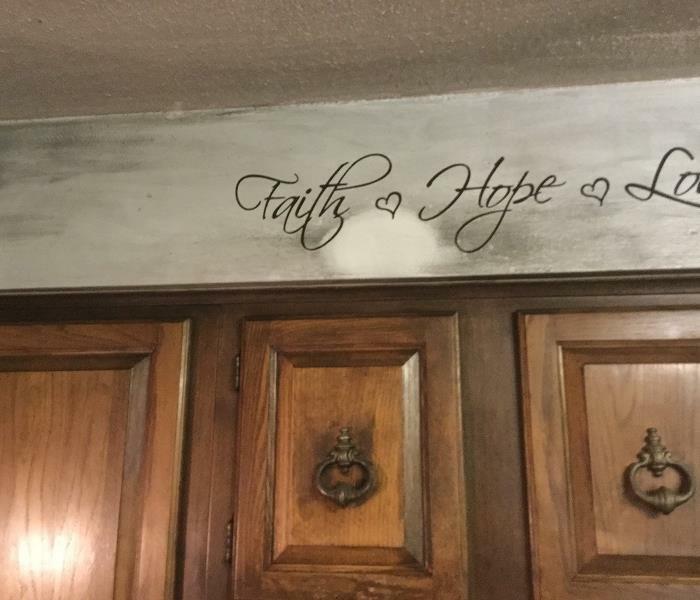 Soot on kitchen walls and cabinets from fire! This home in St. 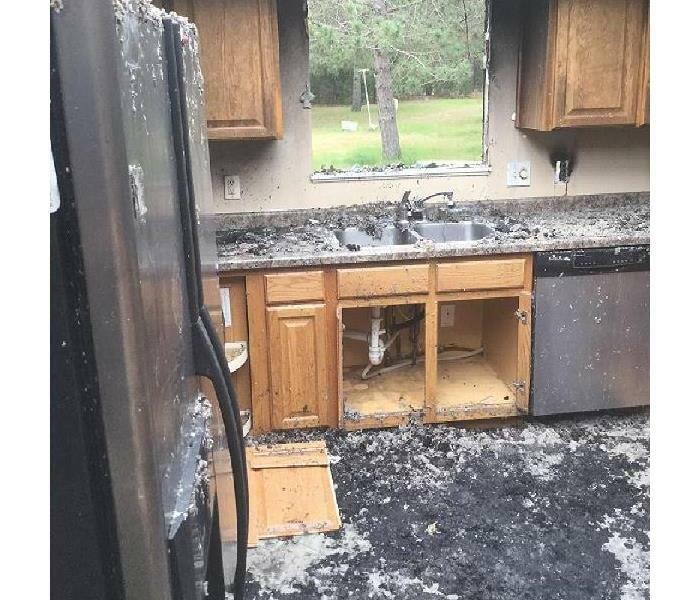 Cloud, Mn suffered a small kitchen fire which left the cabinets and walls filled with soot. SERVPRO of St. Cloud responded and repaired the damage. Look for photos coming soon of the before and after pictures showing the fire damage and cleanup. The homeowners were pleased with the end result! 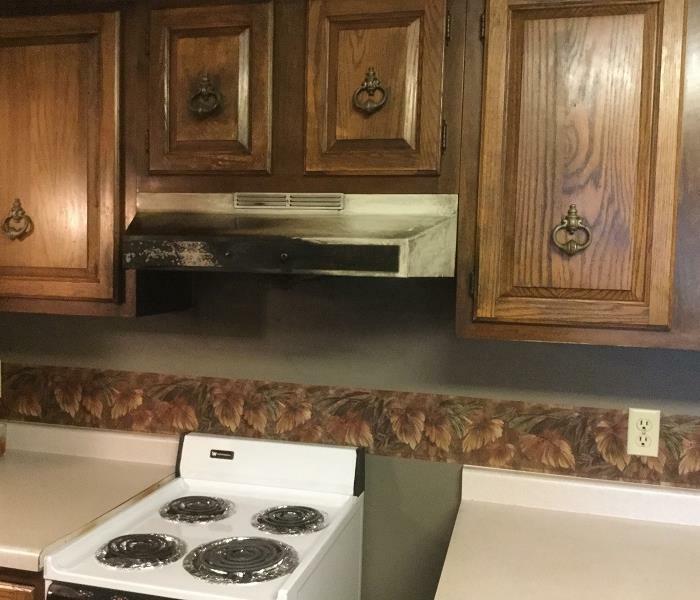 Should you have any kitchen or grease fire, please contact SERVPRO of St. Cloud at (320) 248-5400 for all of your fire restoration needs! Water damage throughout a kitchen. A toilet on the 2nd floor overflowed causing water to leak on the main floor kitchen. A portion of the ceiling above needed to be removed. SERVPRO of St. Cloud is drying out the materials. Should you have a broken water pipe or toilet overflowing to cause damage to your house, please contact SERVPRO of St. Cloud at (320) 248-5400. We are here 24/7 to help you in time of need! Sump pump failure causes flooded basement. 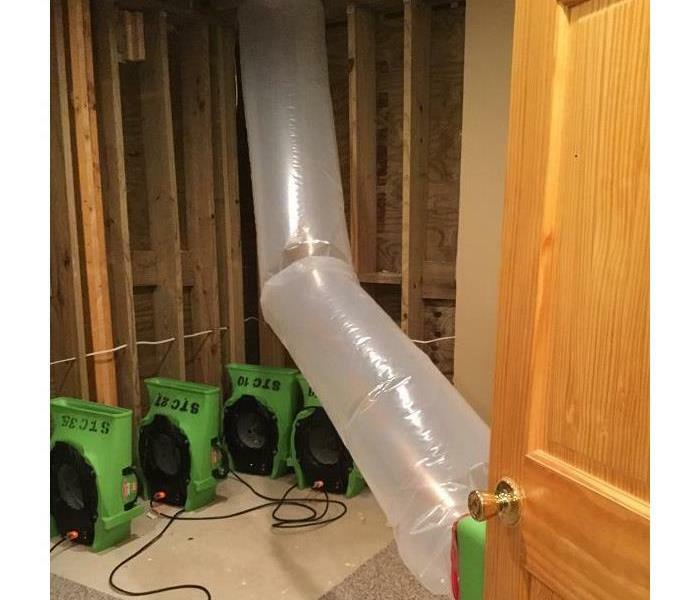 This house in central Minnesota suffered water damage after their sump pump failed as they came home to find their basement flooded. SERVPRO of St. Cloud responded, extracted water, and removed their carpet and pad. 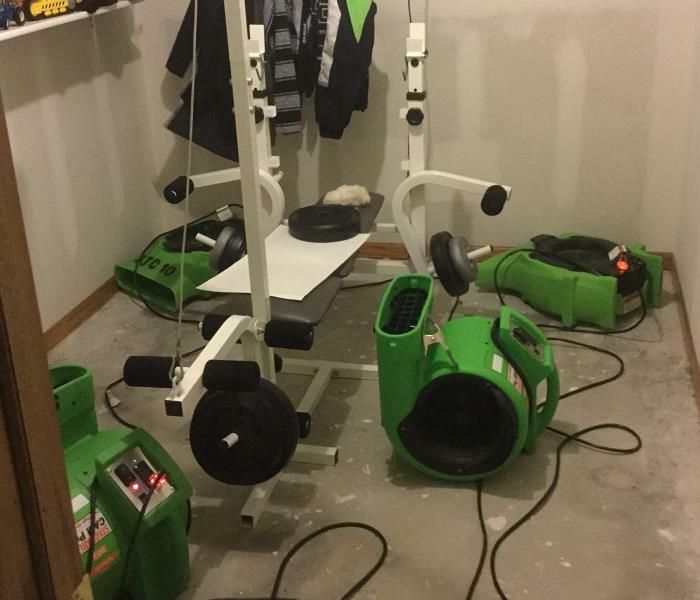 Air movers were set up throughout along with dehumidifiers. Should you have any water damage or broken pipes, please contact SERVPRO of St. Cloud to help clean it up! We can be contacted at (320) 248-5400. 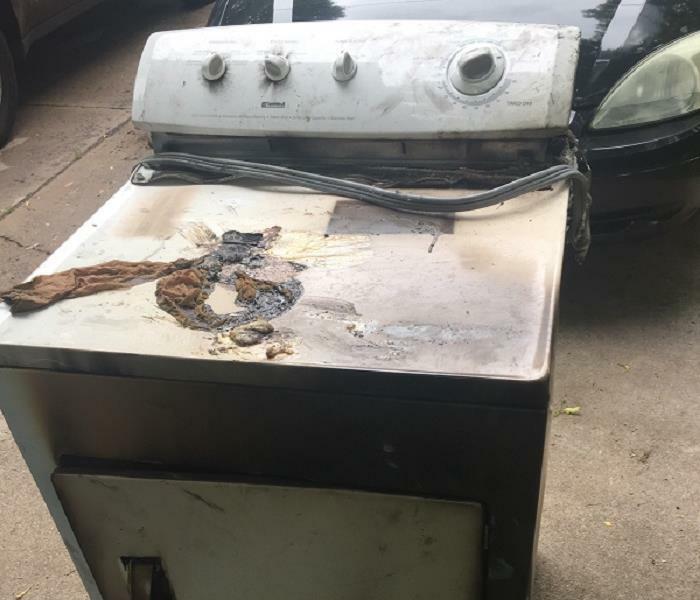 This dryer caught on fire causing smoke odor throughout home! This dryer started a fire in Sauk Rapids, Mn causing smoke odor throughout the home. The insured contacted SERVPRO of St. Cloud who immediately began drying out materials from water by the fire department. The smoke odor will be eliminated along with the soot found in the home. Should you have a small kitchen fire or large fire in your home or business, please contact SERVPRO of St. Cloud for all your needs at (320) 248-5400. Drying out water damage to a local business! This retail store in St. 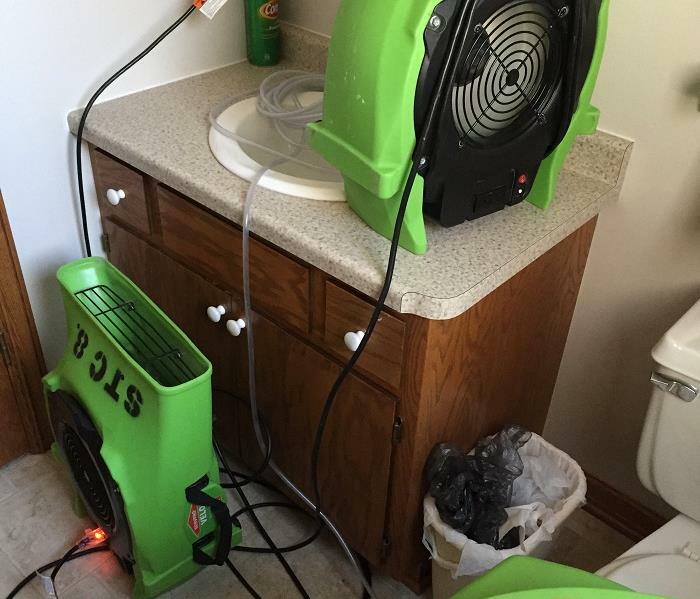 Cloud, Mn suffered a water loss and SERVPRO of St. Cloud responded by drying out the materials immediately. 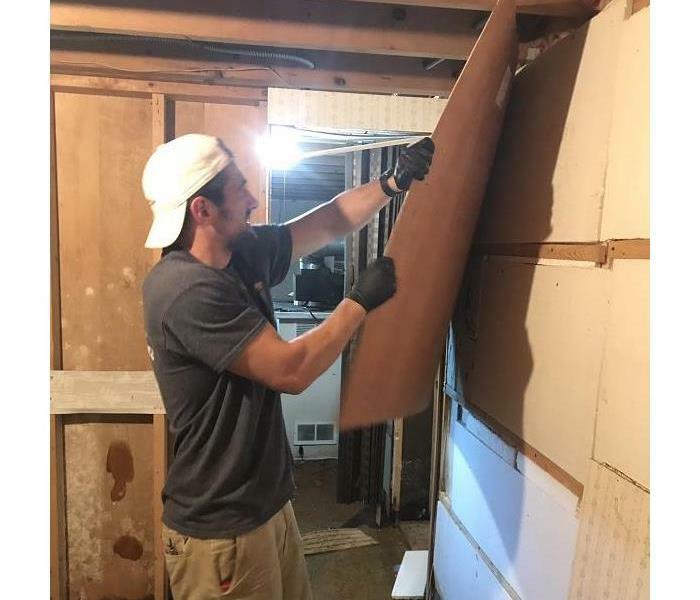 The business did not want to lose any additional days of operation and we were able to dry out the materials by drilling holes in the sheetrock and drying out the wall cavity. The business was happy with the response time! Should your business suffer water or fire damage, contact SERVPRO of St. Cloud at (320) 248-5400 to help restore your business back to working conditions again! SERVPRO of St. Cloud loves to clean! Leave the cleaning to us! SERVPRO of St. Cloud is proud of their cleaning crew! An apartment complex in St. 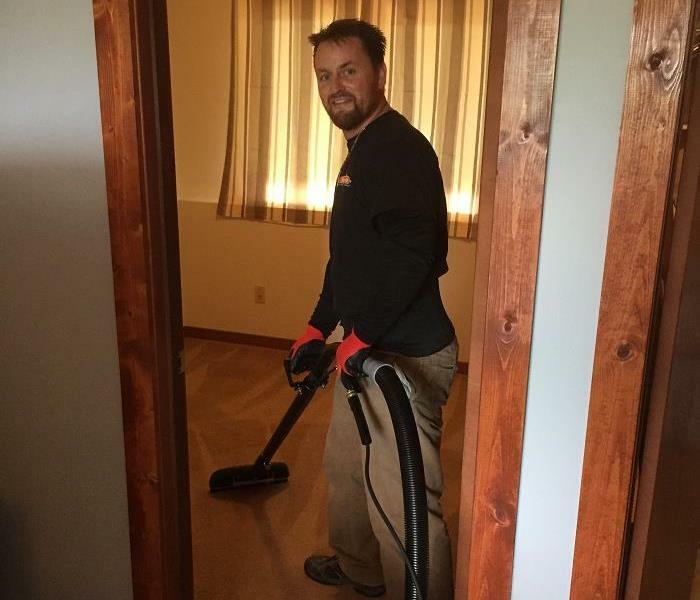 Cloud, Mn contacted us as they had an apartment that needed additional cleaning after the tenants left. SERVPRO of St. Cloud was able to make their apartment shine again! Should you have any cleaning needs either at your residence or place of business, please contact SERVPRO of St. Cloud at (320) 248-5400. We would love the opportunity to work with you! SERVPRO of St. Cloud is here to help you! SERVPRO of St. Cloud was able to dry the carpet! Bathroom toilet overflowed causing damage! 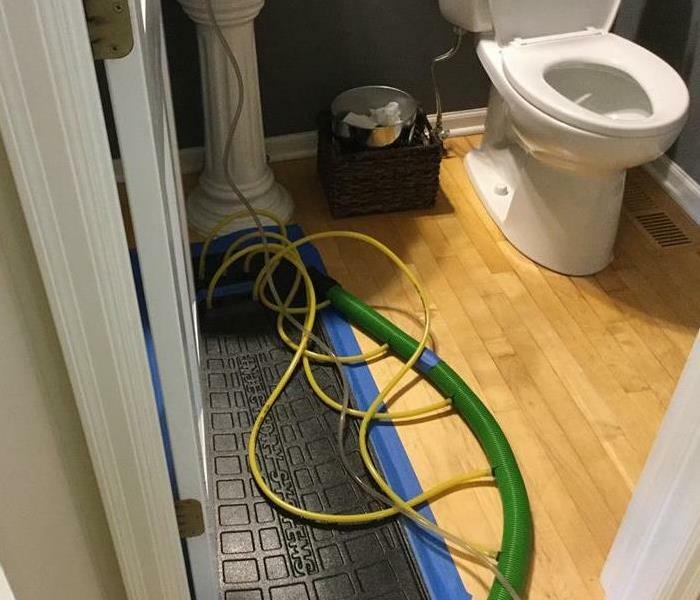 This home in St. Joseph, Mn suffered water damage after the toilet overflowed causing water damage throughout the entire level. SERVPRO of St. Cloud was dispatched and able to contain the damage as best possible. 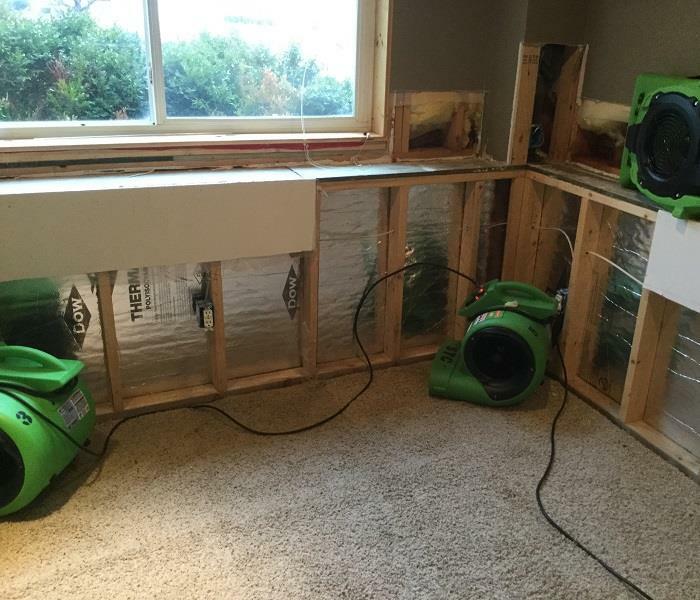 We placed air movers throughout to minimize any removal of walls or other materials. Should you suffer any type of water damage from a pipe burst, toilet overflow, or sump pump backup, contact SERVPRO of St. Cloud for immediate assistance! (320) 248-5400. SERVPRO of St. Cloud working on repairing a basement. This home in Sartell, Mn suffered water damage after we recently received 8+ inches of rain in a short amount of time. SERVPRO of St. Cloud was contacted by the home owner's insurance company. We were able to respond and begain the remove the damaged materials and place drying equipment throughout. Notice the clean construction lines in the removal of the drywall as we pride ourself in doing high quality work. Should you suffer any water damage, please contact SERVPRO of St. Cloud at (320) 248-5400. SERVPRO of St. Cloud is ready to help you! 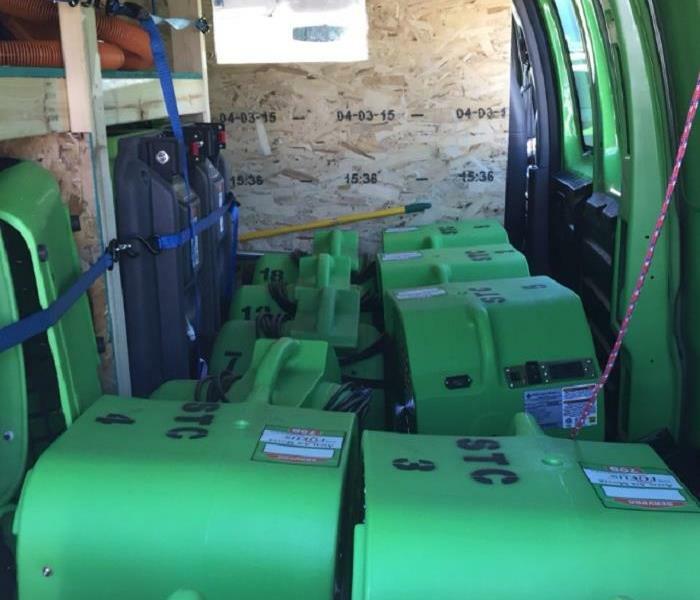 Our vans are loaded and our green equipment is ready to help you! 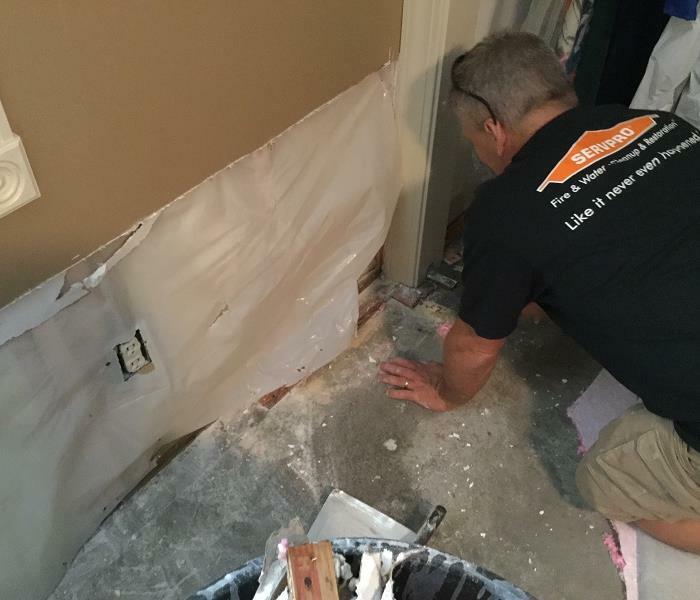 Should a disaster ever strike, such as a flooded basement, water pipe burst, dishwasher or toilet leak, or a fire within your home or business- SERVPRO of St. Cloud is ready to respond! We are available 24/7 and pride ourself as our team is knowledgable in building and restoration services. SERVPRO of St. Cloud would be happy to assist you. Call us at (320) 248-5400. Water damage caused from torrential rains! This home in Sartell, Mn sustained water damage after the torrential rain when 8" of rain came down in just a short time. The sump pump failed and caused water damage to the lower level. SERVPRO of St. 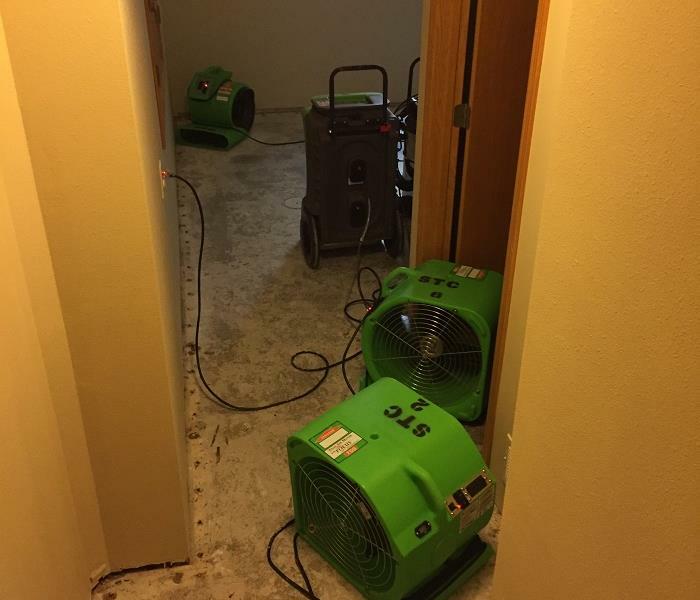 Cloud removed the carpet and pad and set up high efficient blowers and dehumidifiers to dry out the materials. Should you have water damage to your home or business, please contact SERVPRO of St. Cloud at (320) 248-5400 for all your water and fire damage repairs. Water damage to basement in St. Cloud, Mn. St. Cloud, Mn residents: Should you suffer water damage in your home, let quality professionals help you in time of need! This home in St. Cloud, Mn had water damage in the basement after the recent storm. SERVPRO of St. Cloud responded immediately and was able to restore the materials by setting up a containment area and drying the carpet and drywall. Notice the tidy work area as SERVPRO of St. Cloud prides itself in keeping your home clean while we do our work. Should you have any water damage to your home or business, contact SERVPRO of St. Cloud at (320) 248-5400. If you have been vandalized, we are here to help! 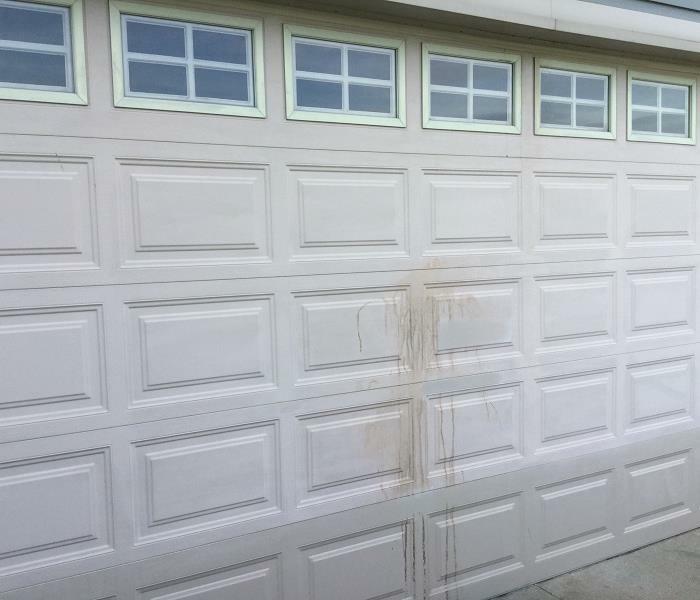 This home in Sartell, Mn suffered damage as they were vandalized and egged. The garage doors along with the siding was egged on the entire front of the home. An act of vandalism may be costly to repair. In this case, if the egg material has sat for a day or more, the egg decomposes to an acidic by product and it may "bleach out" the siding in which you will notice a lighter shade where the egg was. We tested a portion of the siding in which we believe we can clean instead of replacing the siding. Look for upcoming before and after photos in the near future. If your house or business has been vandalized, please contact SERVPRO of St. Cloud for a free estimate to repair. We can be reached at (320) 248-5400. Floating carpet to dry- economical and fast! 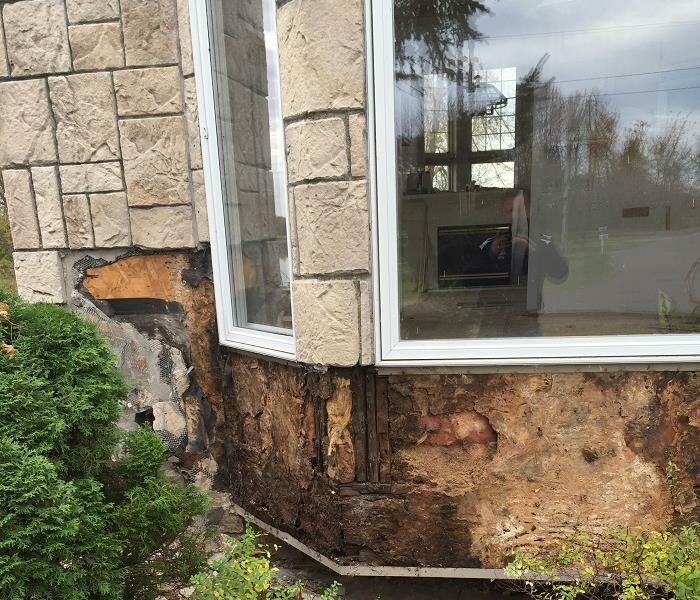 This home in Central Mn suffered water damage to the lower level after a recent large rainfall. The insured contacted SERVPRO of St. Cloud in which we responded immediately. 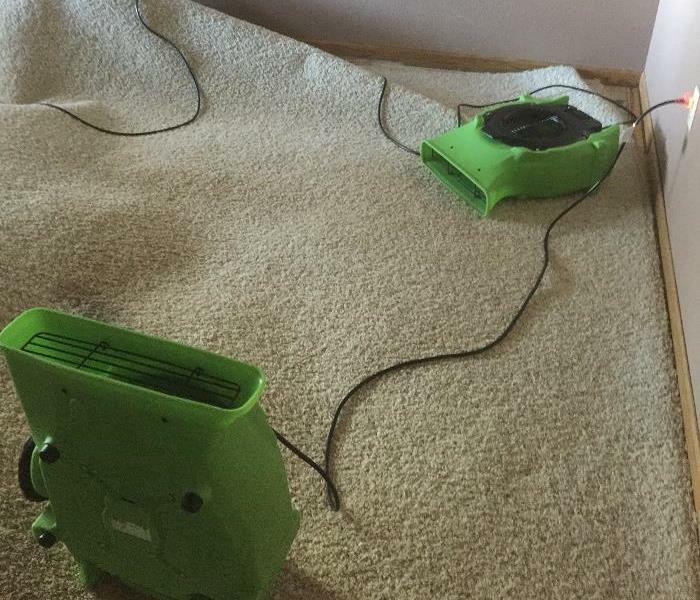 Due to the fast response, we were able to salvage the carpet by removing the pad and placing fans under the carpet to dry out. The homeowner was pleased as they recently purchased this carpet and wanted to keep it in their home. Should you have a water loss, contact SERVPRO of St. Cloud at (320) 248-5400. We are open 24/7 and would love to help you through this experience.